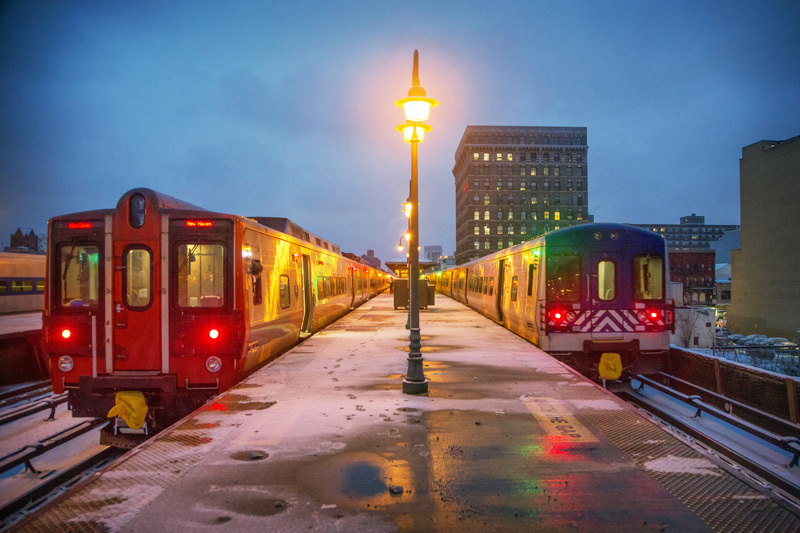 2016 has been bookended by two major moves for me – early in the year I was settling in to a new place in the Harrisburg, Pennsylvania, area, and at the end of the year I find myself settling in to a new place in the Buffalo, New York area. 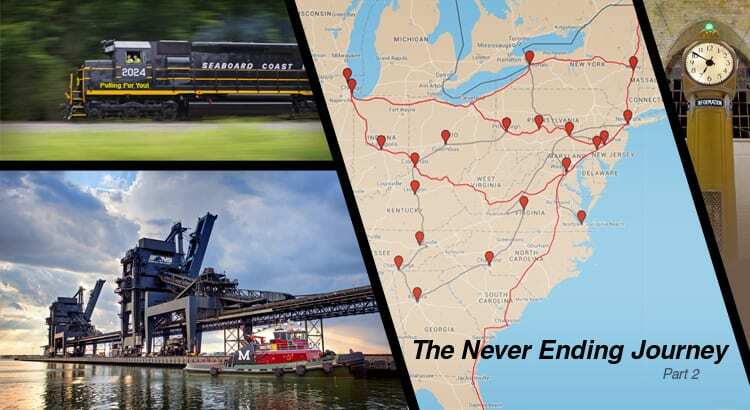 Busy seems to be an understatement when you find yourself traveling through at least 18 different states, and spending the equivalent of nearly three months in different hotel rooms. 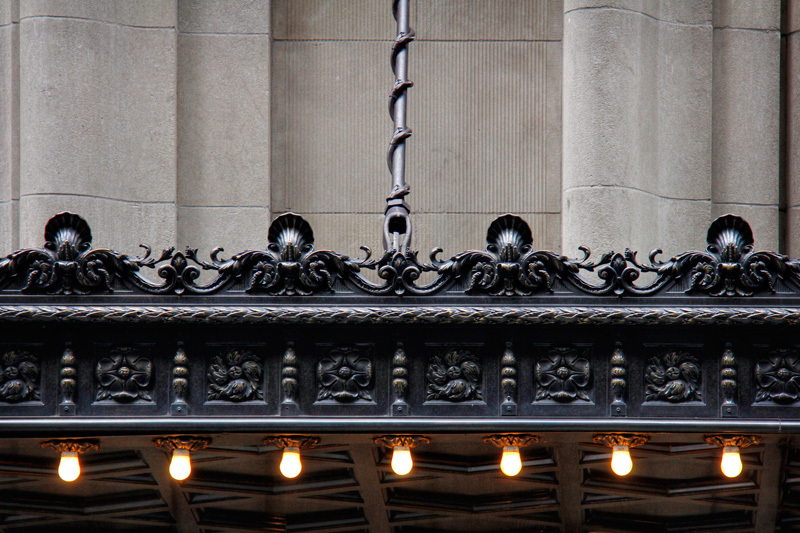 Of course, throughout it all I kept my camera by my side. This post roughly continues where Part 1 left off – but I’ve aptly attempted to bookend it with Harrisburg, and the Buffalo – a true reflection of 2016. 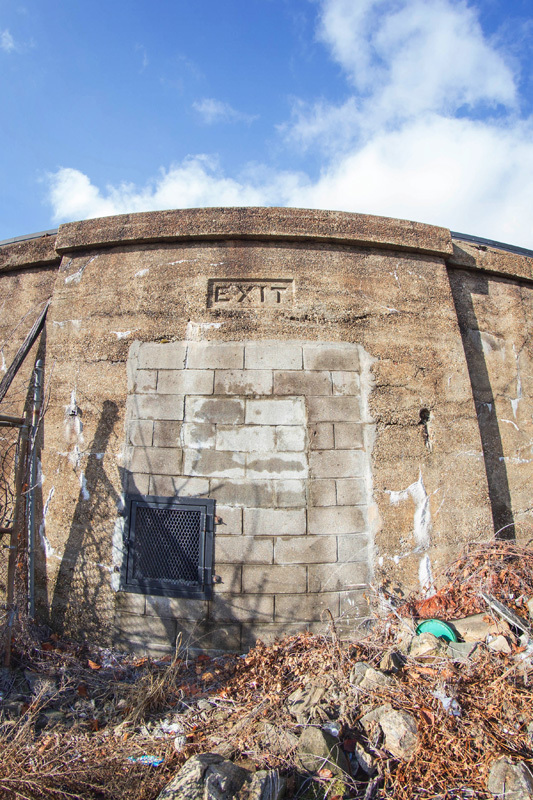 Continuing off from the previous Never Ending Journey post, my road trip back from Atlanta led us to Oak Ridge, Tennessee, where I heard that the Secret City Scenic would be ending operations. 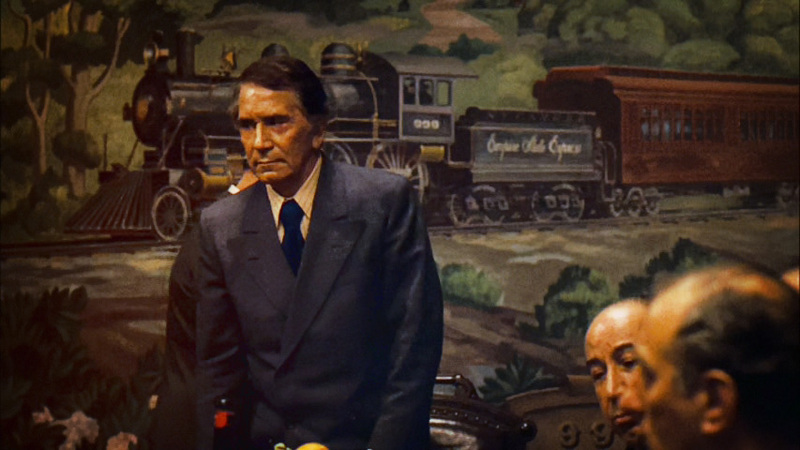 Sadly, their operating agreement was not renewed, and they would no longer be permitted to run trains. 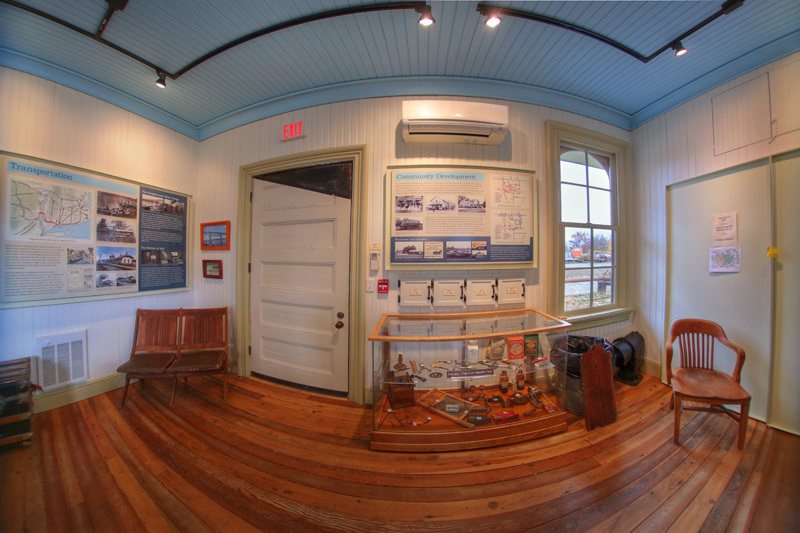 Since we were not far, we dropped in to see the final excursions, and snap a few photos. 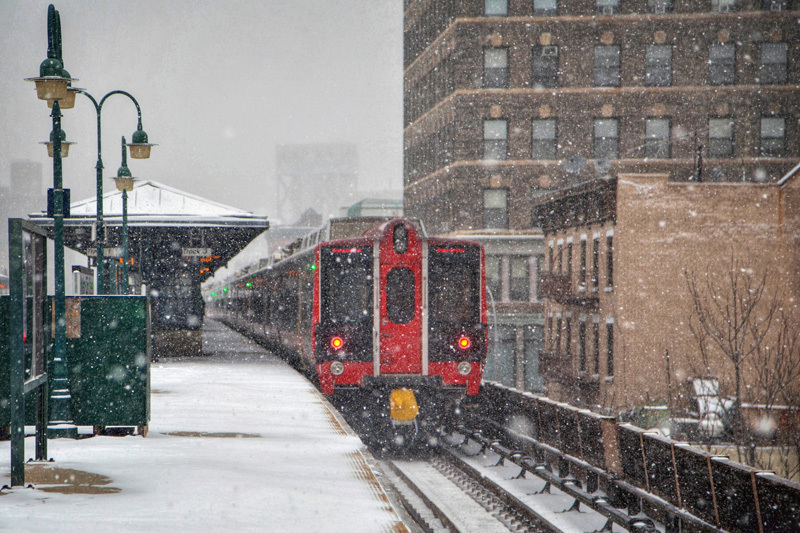 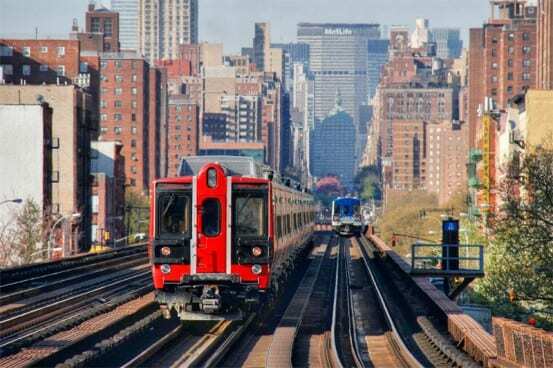 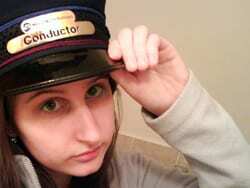 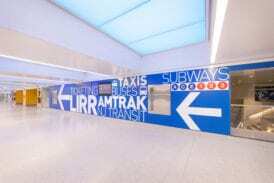 As has been readily established on this blog, I’m not much of a fan of subways. The subterranean lack of light has never been of much intrigue to me, though I do find some interest in the stations located above ground. 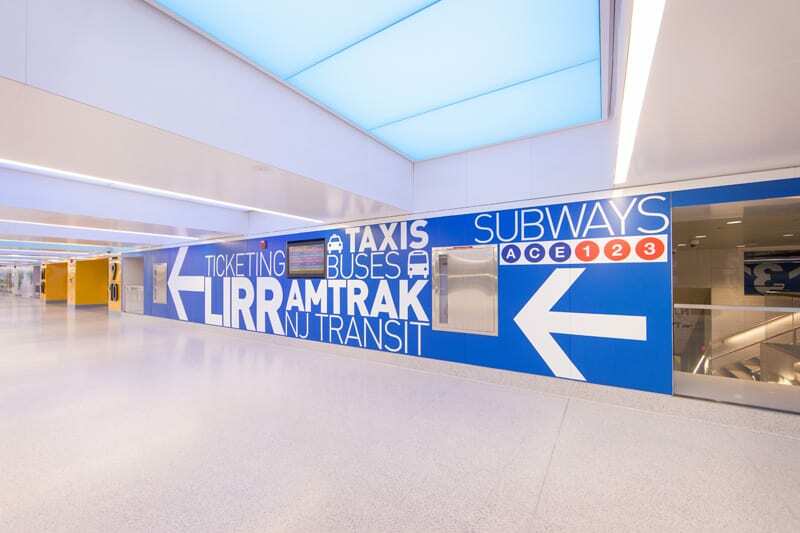 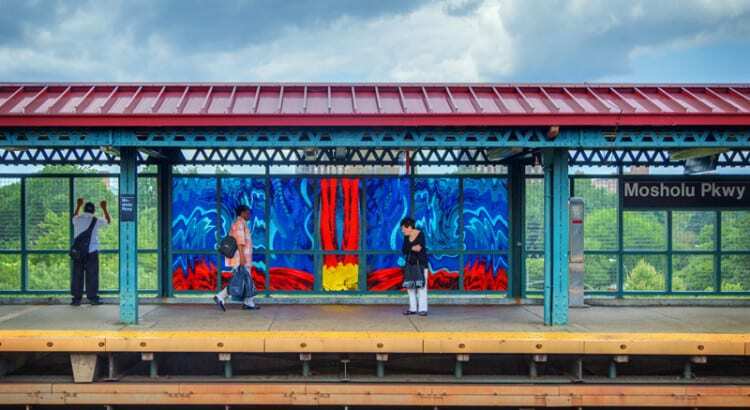 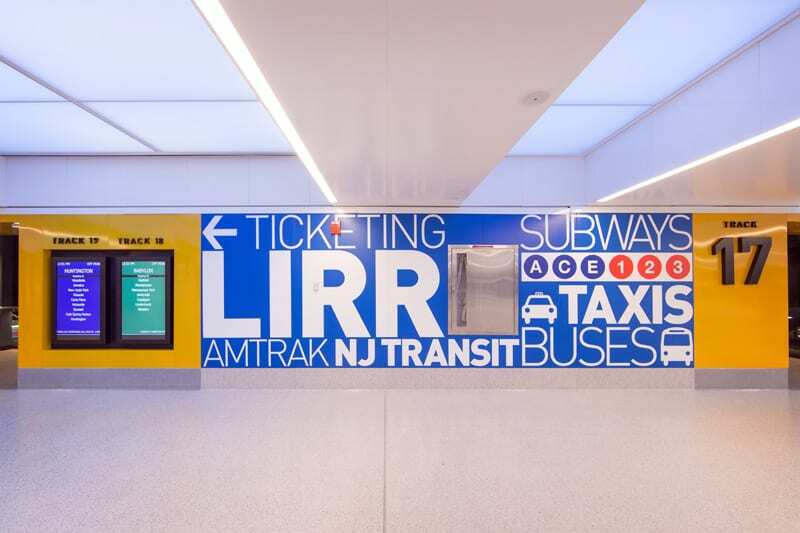 Many of New York City’s above-ground subway stations feature attractive stained glass art, through the Arts for Transit program. 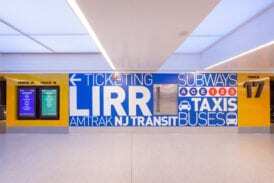 While I thought it might be interesting to do a post featuring some of the attractive stained glass found on the subway, I ended up with a whole lot more material than I anticipated. 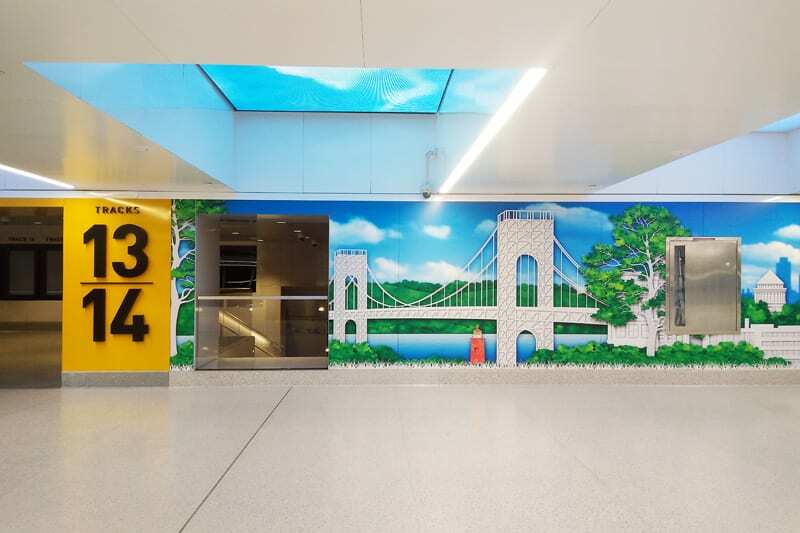 Though we won’t be going as in-depth as my previous tours of Metro-North stations, I did think it would be fun to tour some of the above-ground sections of the NYC subway, focusing on the glass art found at various stations. When trains went back underground – I bailed – and when the art wasn’t glass in the windows or windscreens, I skipped it. 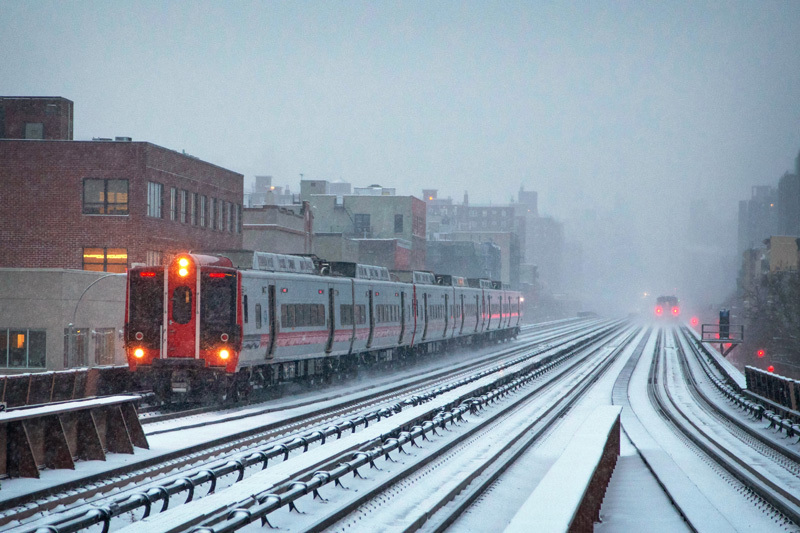 We’ll start our exploration on the 4 Line. 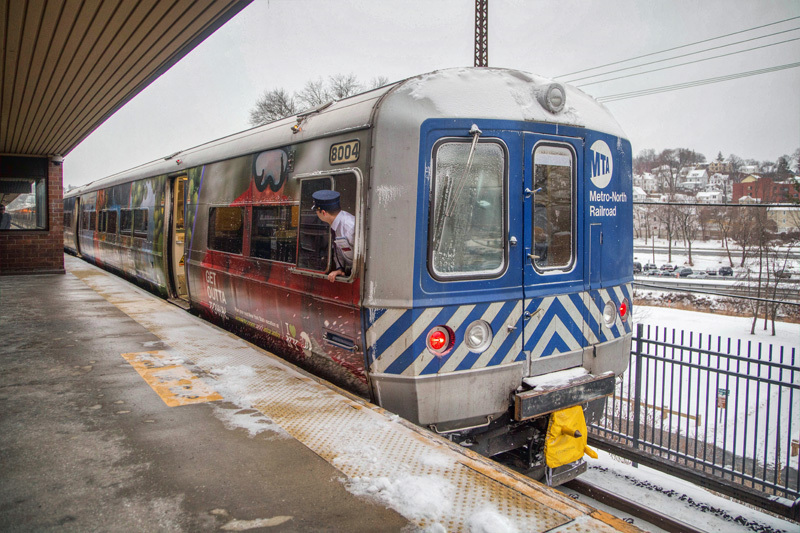 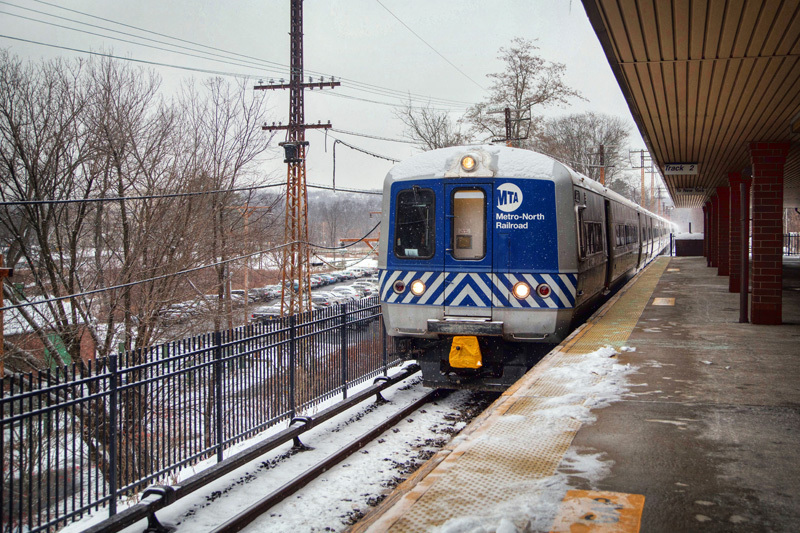 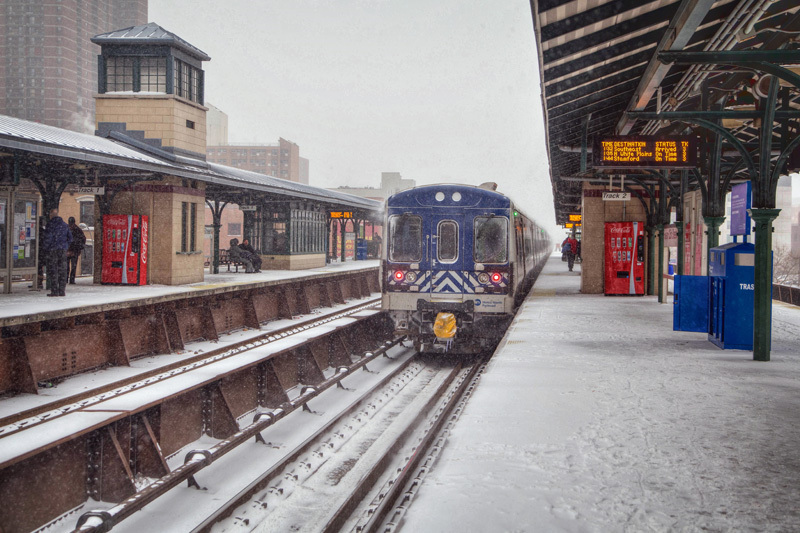 If you’re interested in joining up via Metro-North, board a Bronx-bound 4 train to Woodlawn from Grand Central or Harlem-125th Street. 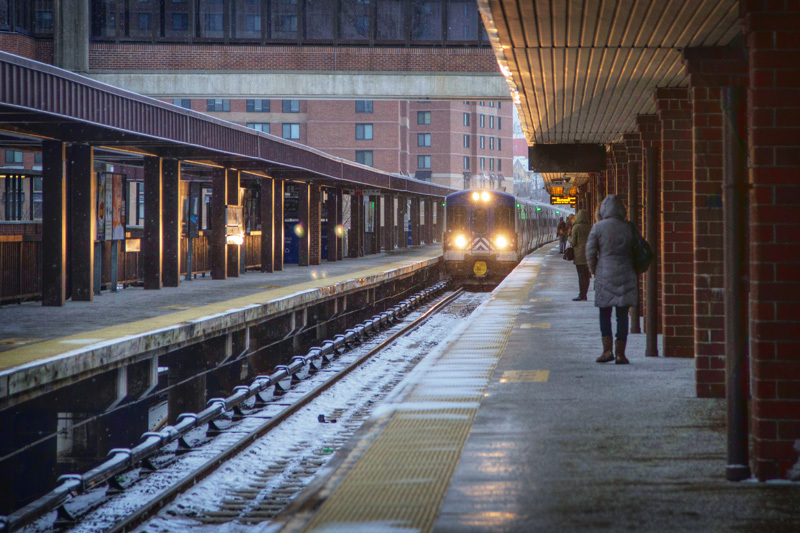 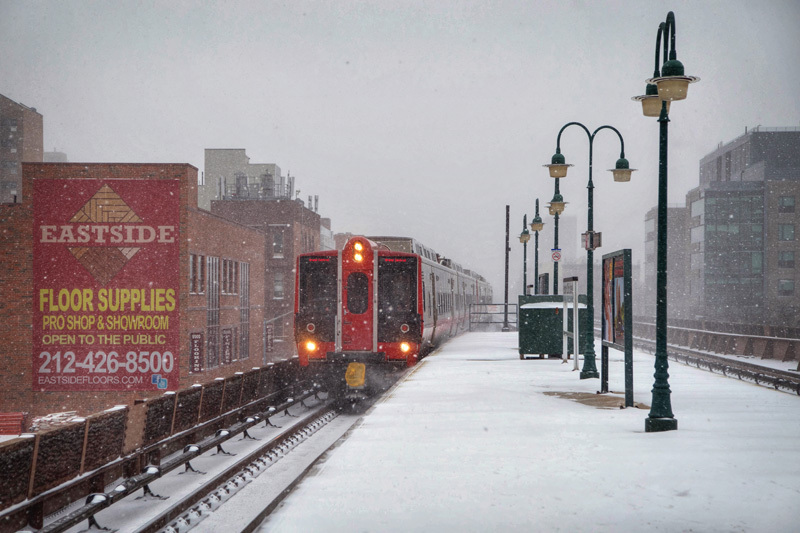 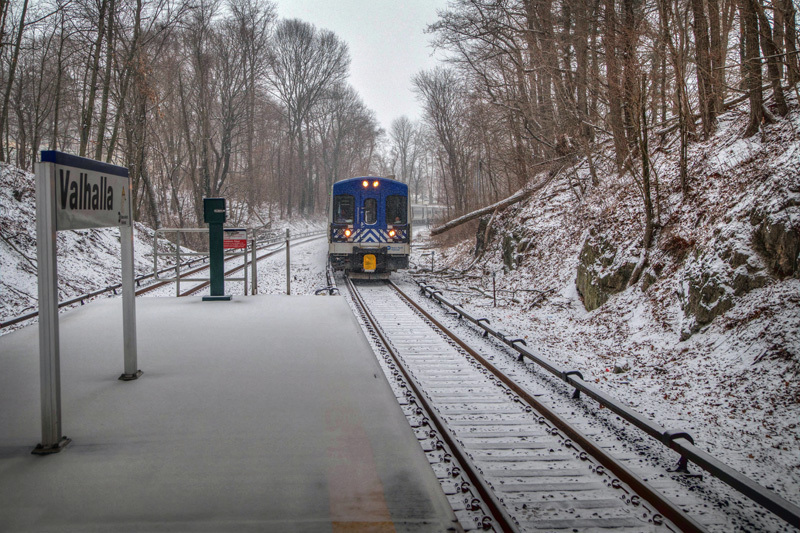 We’ll be starting at Woodlawn – the end of the line – and working our way down. 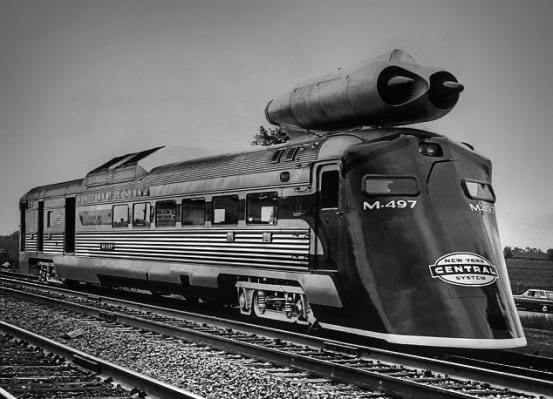 Essentially, the M-497, better known as the “Black Beetle,” is an RDC-3 with a shovel nose to be more aerodynamic, coupled with jet engines of a B-36. 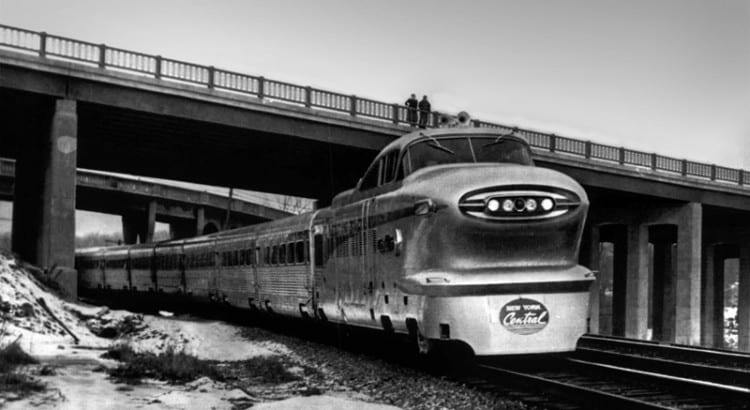 Tested in Ohio, it achieved a speed of 183.85 MPH. 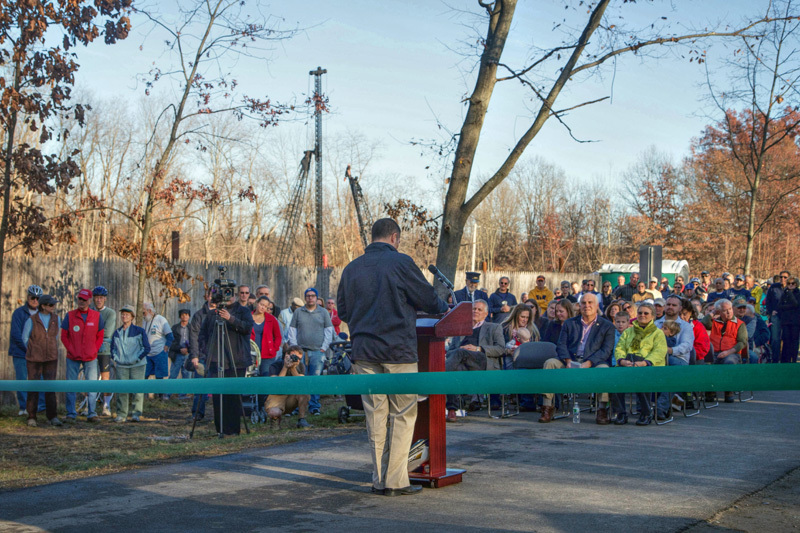 Eventually, the jets were removed, and the RDC was returned to service, albeit much slower. Though far more tame than the jet-powered train, it is too difficult for me not to mention the Xplorer, which has always looked a bit comical to me. 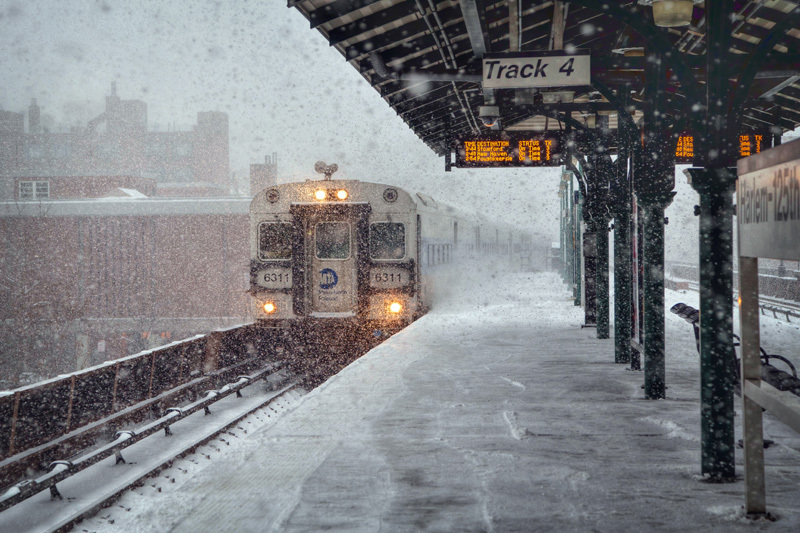 Right about now I am really looking forward to summer. 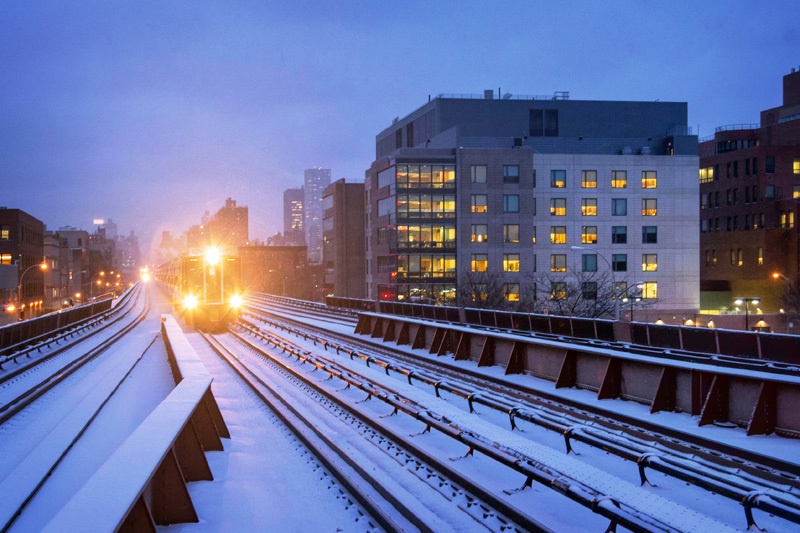 I’m never a fan of the cold (despite sleeping in an ice hotel, and visiting Alaska in winter…) and this winter feels exceptionally so. 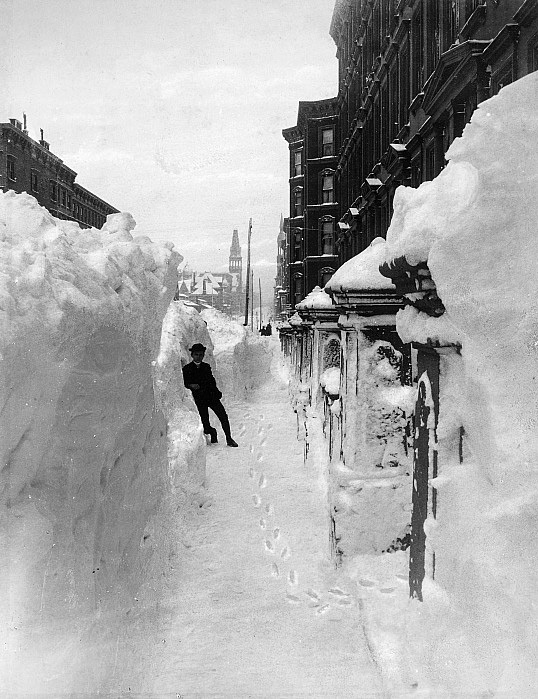 The winter we’ve thus endured, however, pales in comparison to the winter of 1888. 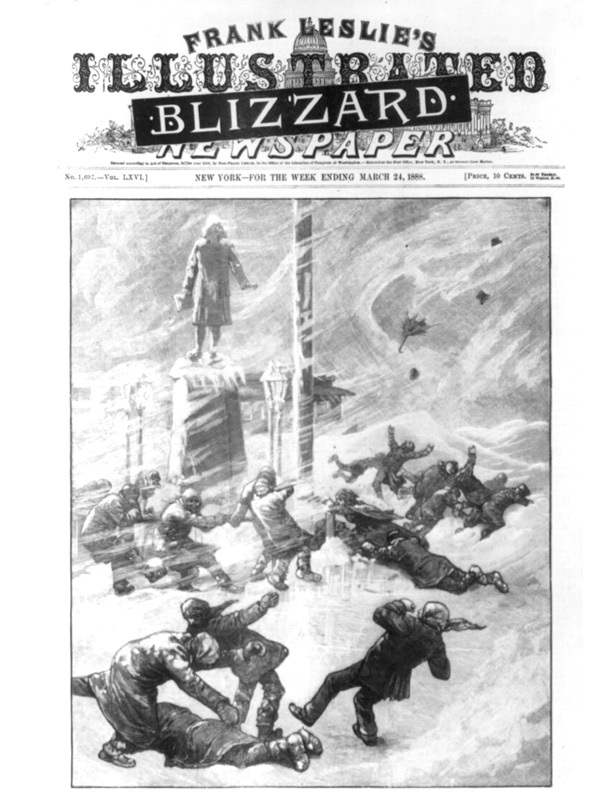 The Great Blizzard of 1888 is one of the most severe blizzards ever recorded in the US, with 22 inches of snow in New York City and 48 inches of snow in Albany. 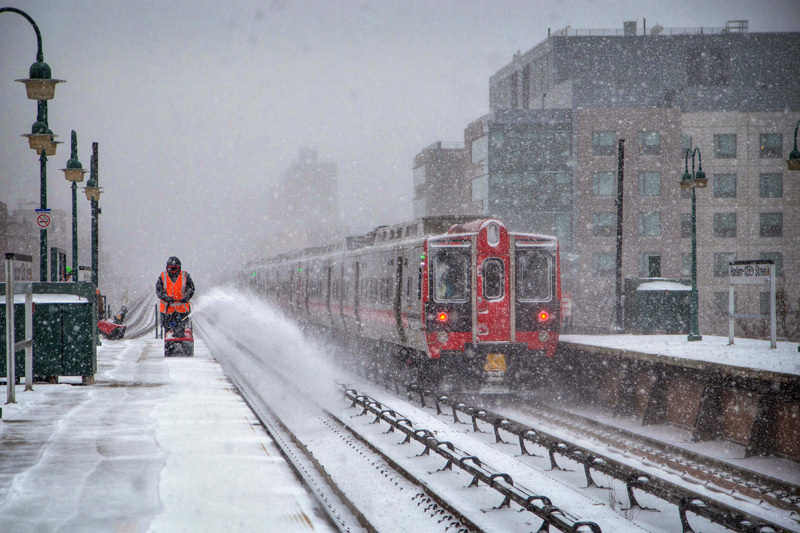 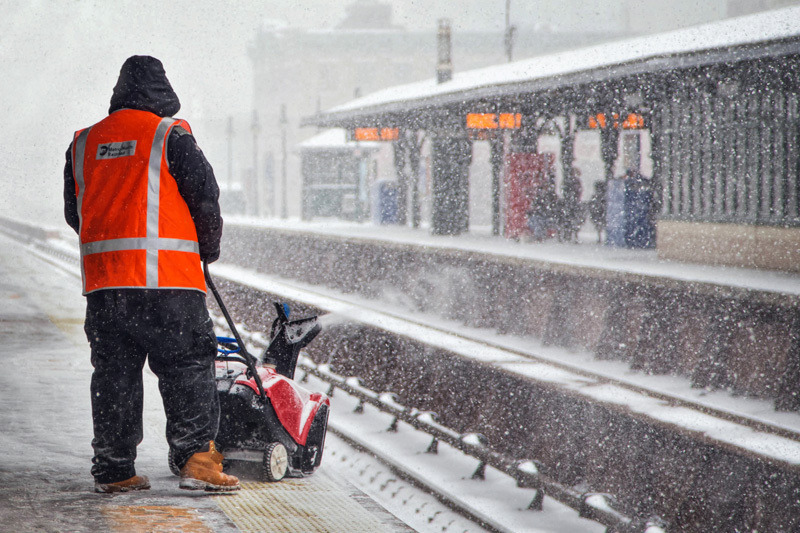 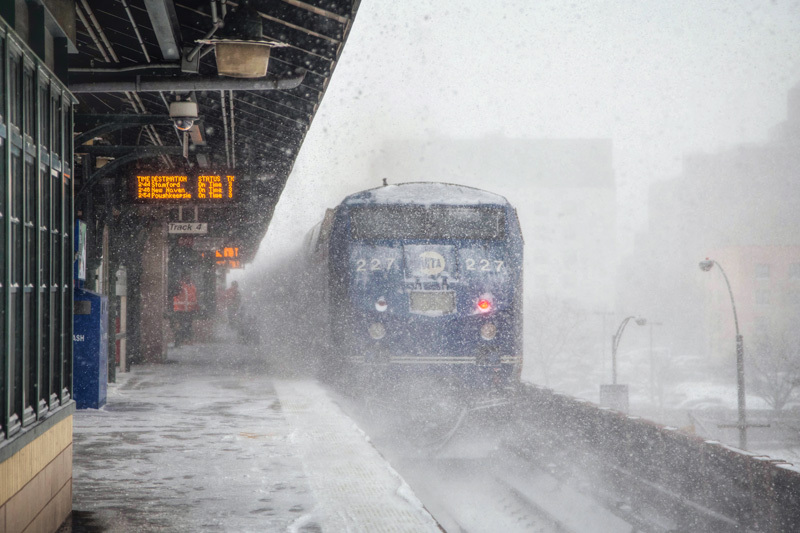 It took the New York, New Haven, and Hartford Railroad eight days to clear the snow from their main line to New Haven. 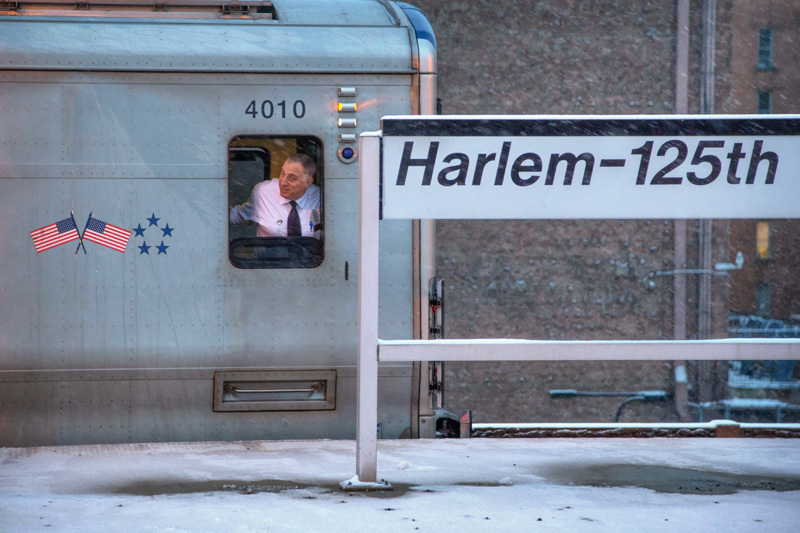 The New York and Harlem Railroad’s attempts were less successful, recorded as a small blip in the annals of history. 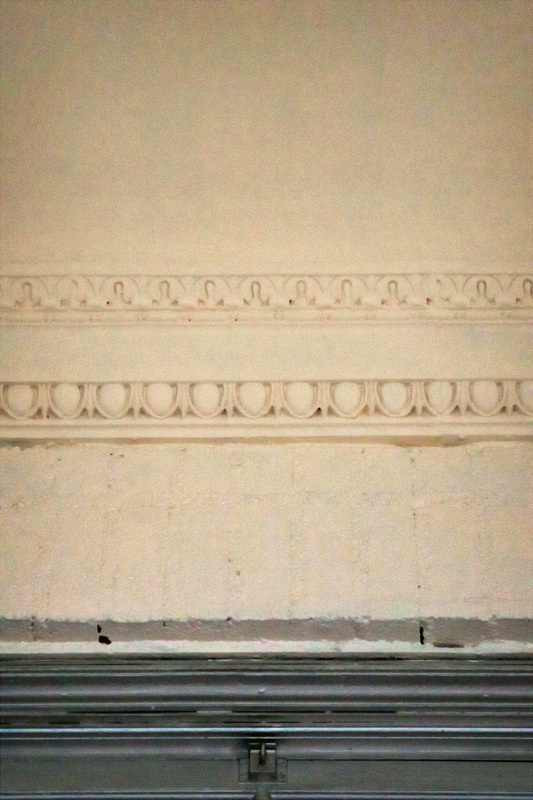 Meet Old Eli. 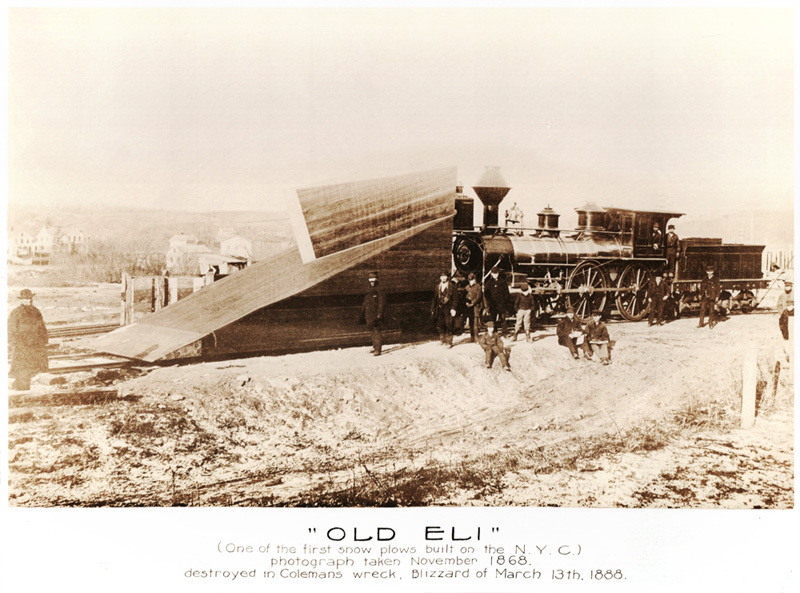 This comical looking contraption was one of the first snowplows built for the New York Central Railroad in 1864. 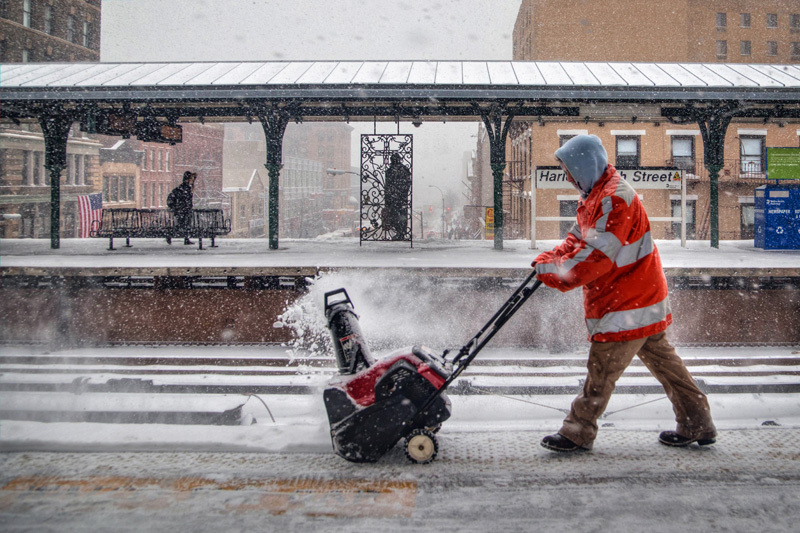 The plow was mounted on a six-wheeled truck, and connected to an engine with an old-fashioned push bar. 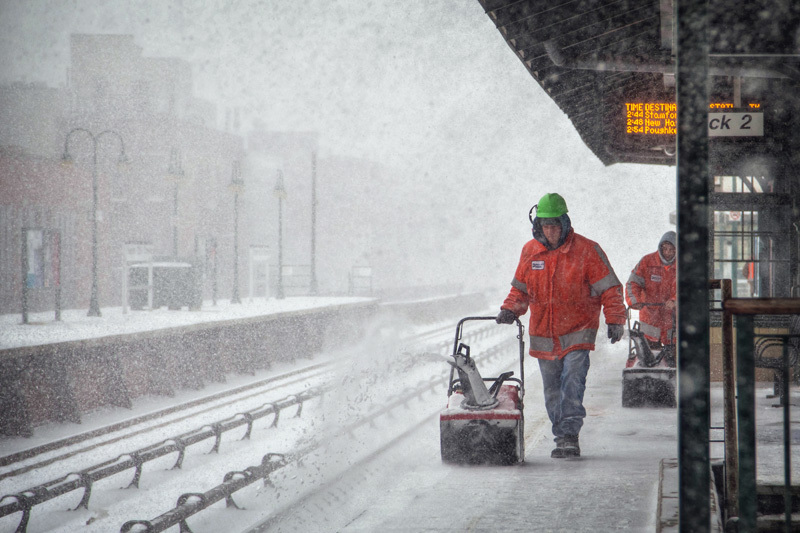 The plow usually required several steam locomotives to push it, and for the 1888 blizzard the plow was being pushed by a total of five. 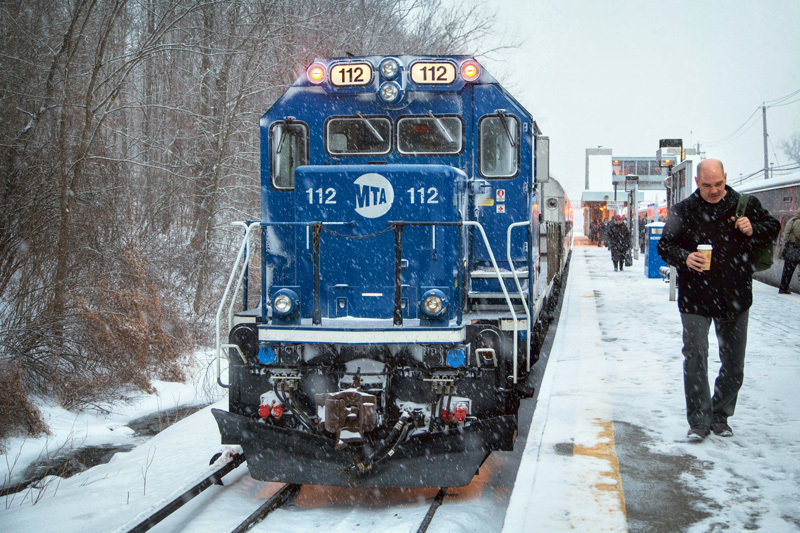 It is worth mentioning that this plow was hardly an ingenious innovation, instead of pushing snow to the side, it often pushed the snow up and above the engine – a grievous issue when traversing an extremely narrow rock cut. 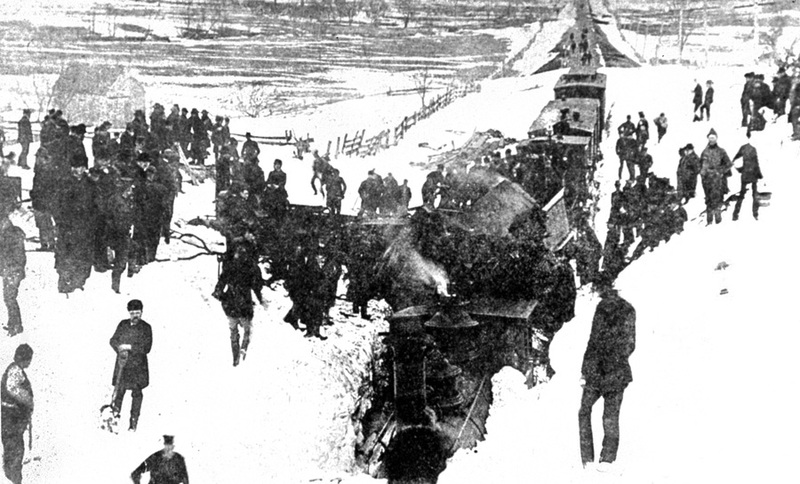 Scene from the wreck at Coleman’s during the Great Blizzard of 1888. 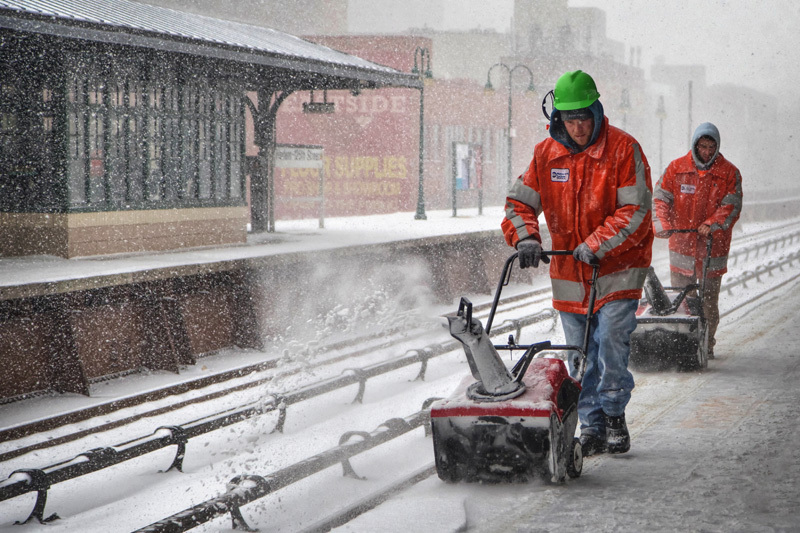 Heading north from White Plains, Old Eli was to clear the snow from the Harlem all the way to Chatham, but instead met doom at Coleman’s. 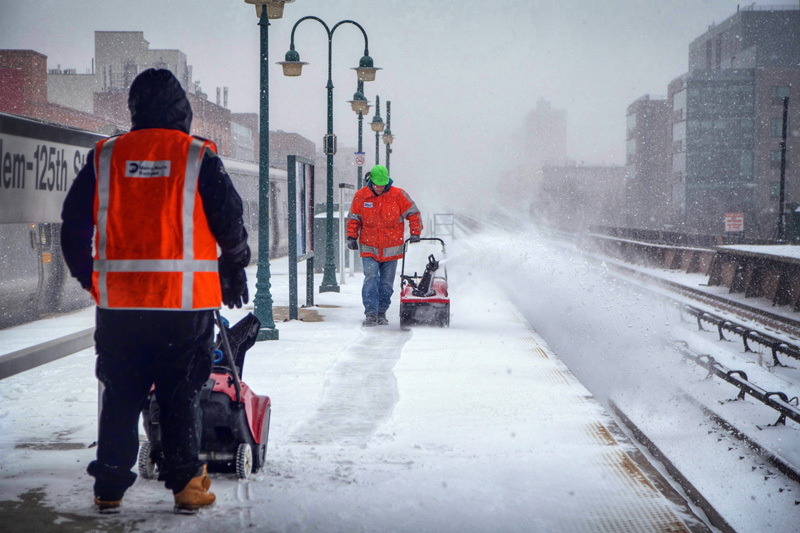 The narrow rock cut there was plugged with snow, and the aforementioned deficiency of the plow ensured that the lead locomotive was thoroughly buried in the snow. 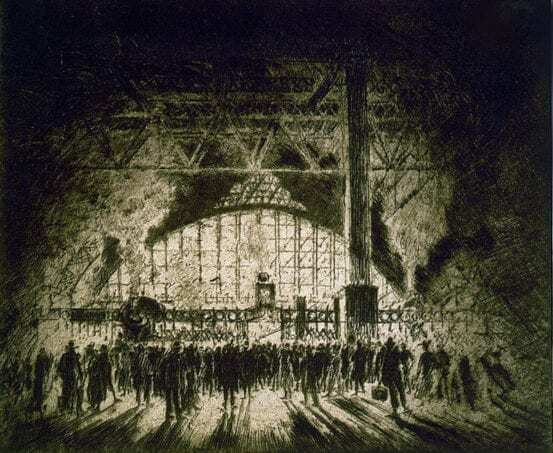 All five locomotives derailed, Old Eli was destroyed beyond repair, and five crew members lost their lives, three of which were boiled alive by the lead steam locomotive. 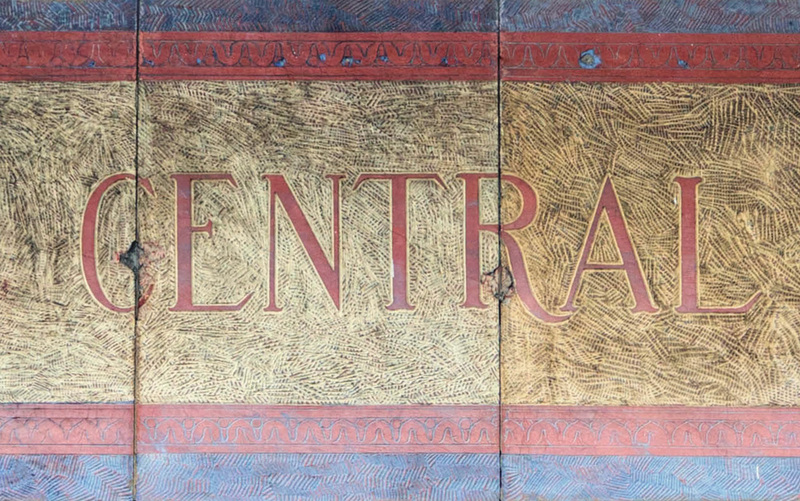 On the final day of 2013 – Grand Central’s centennial year – there’s one more station that I’d like to take a visit to. 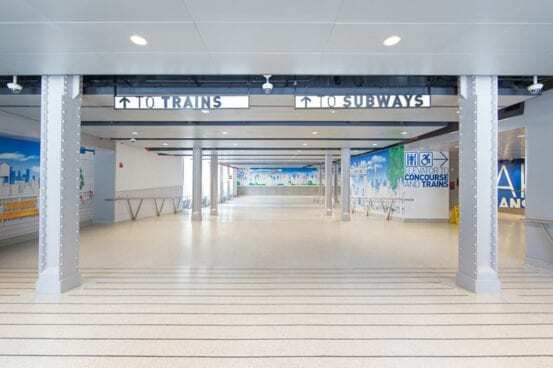 Several years ago, when we visited during our Tuesday Tour, we saw only part of the station, the tunnels and the platform. 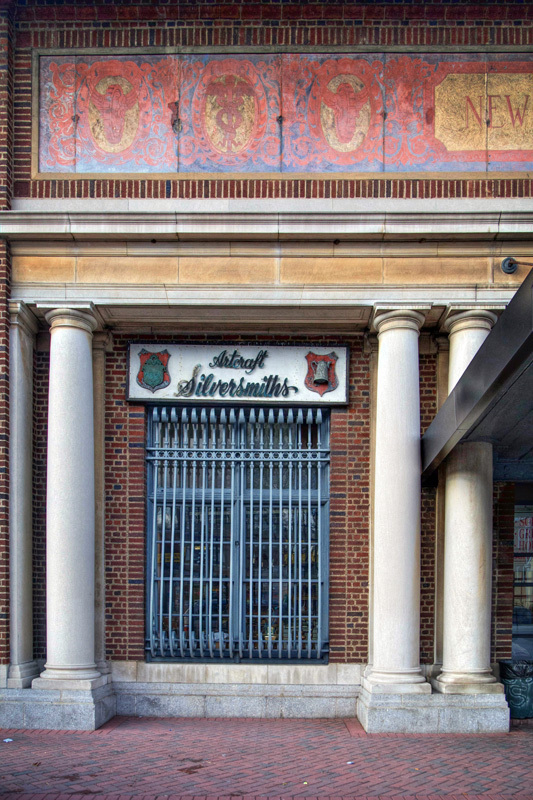 But beyond the current station’s doors is an edifice whose façade has remained fairly similar for over 90 years, though the inside has drastically changed. 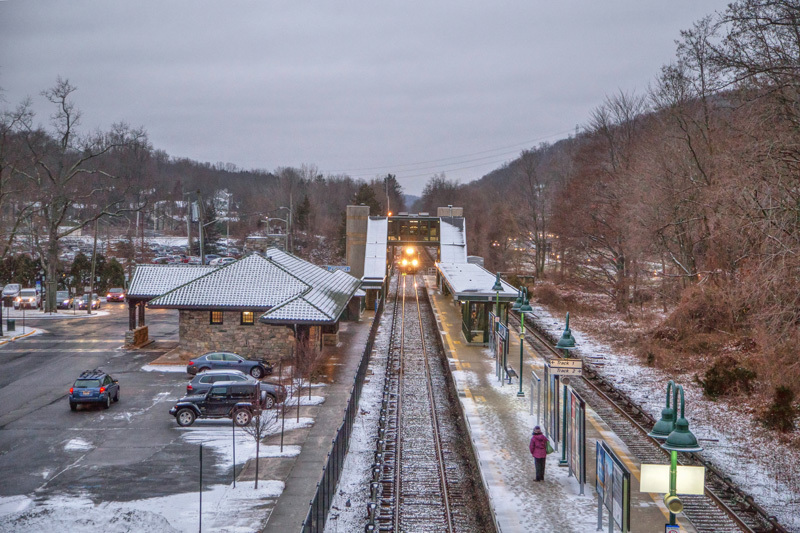 The New York Central’s station at Mount Vernon, designed by Warren and Wetmore, was at one time one of Westchester’s beautiful stations. 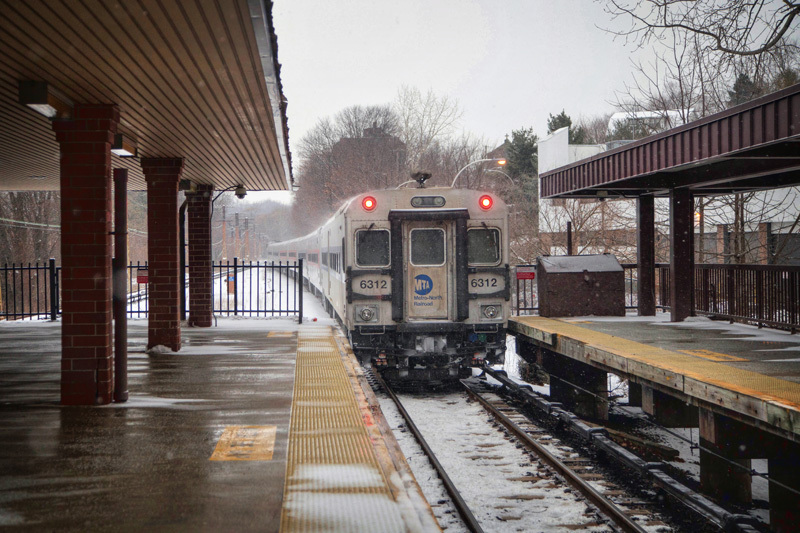 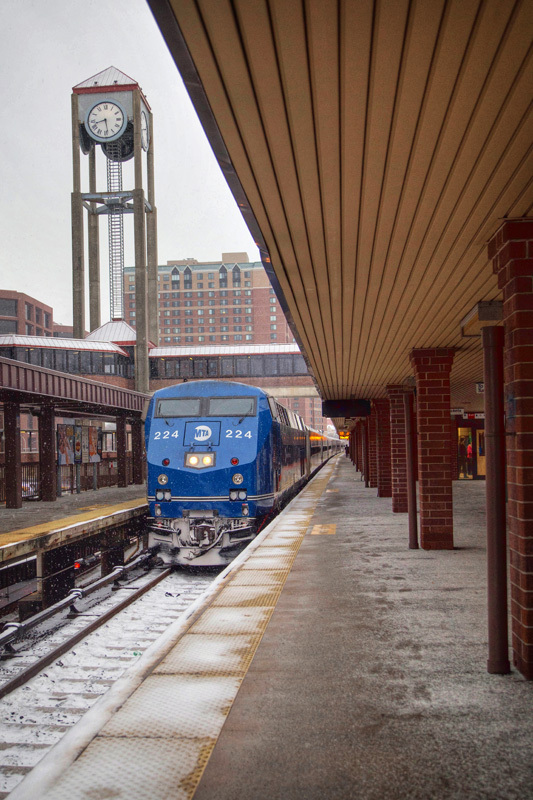 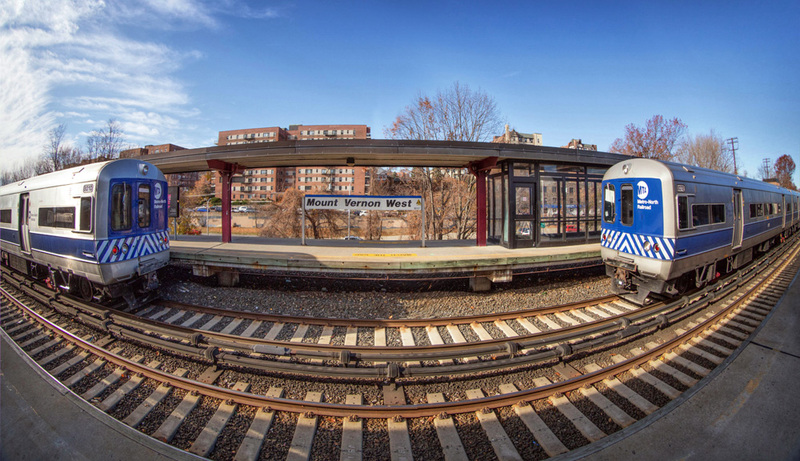 Once it was on par with the great stations at Yonkers and White Plains – but while Yonkers survives and White Plains was razed, Mount Vernon exists in a strange limbo. 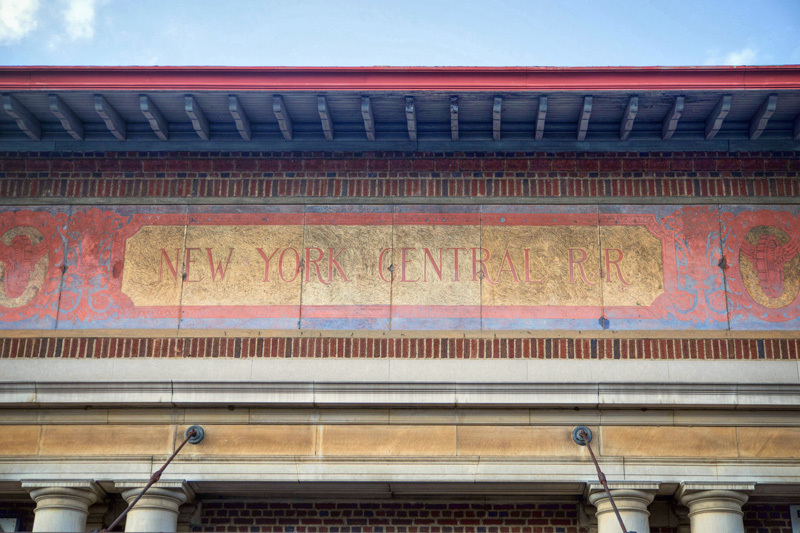 As the New York Central’s financial woes became painfully obvious, the railroad began selling off the very buildings that were once symbols of their might. 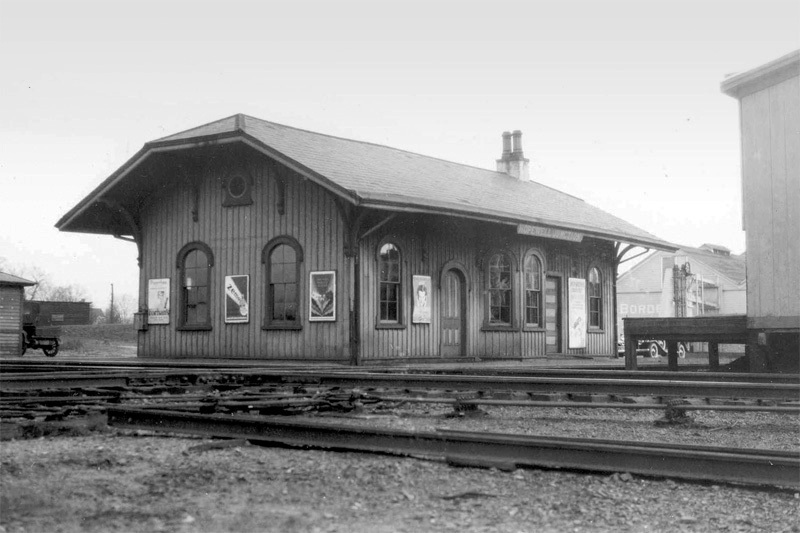 In 1959, Mount Vernon station was sold to local businessman who converted it to serve commercial purposes. 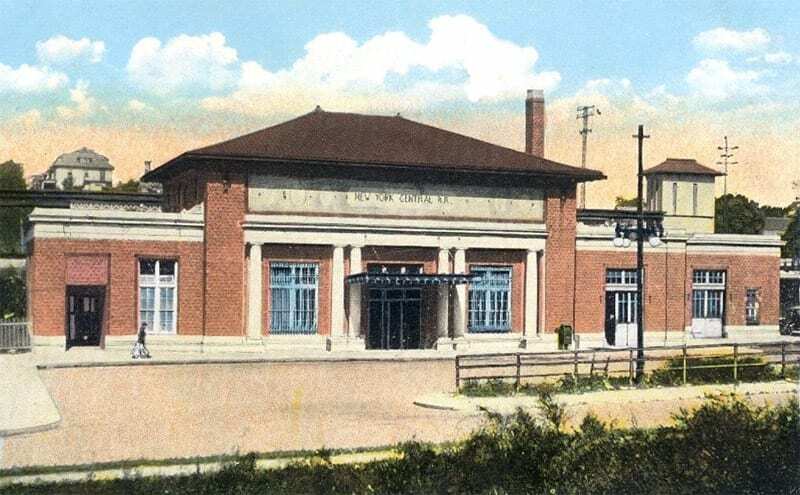 The waiting room was dismantled and the cavernous space split into two floors, and the express room at the north end was demolished and a two-floor office building erected in its stead. 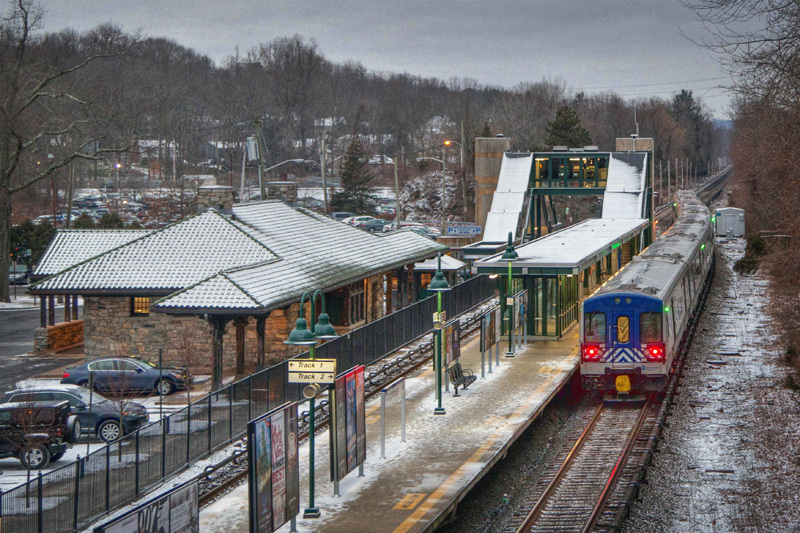 From the platform level one would hardly notice the history that surrounds this Metro-North station. 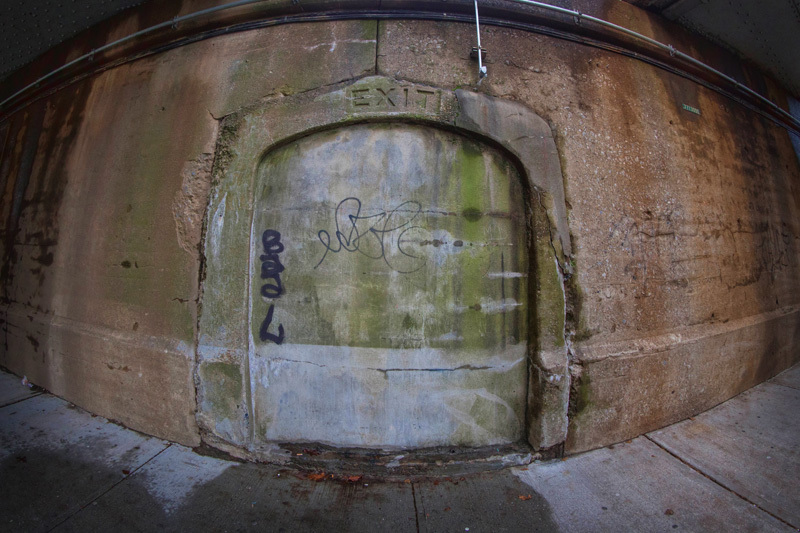 A walk around the property at street level one discovers several exits long closed and covered in concrete. 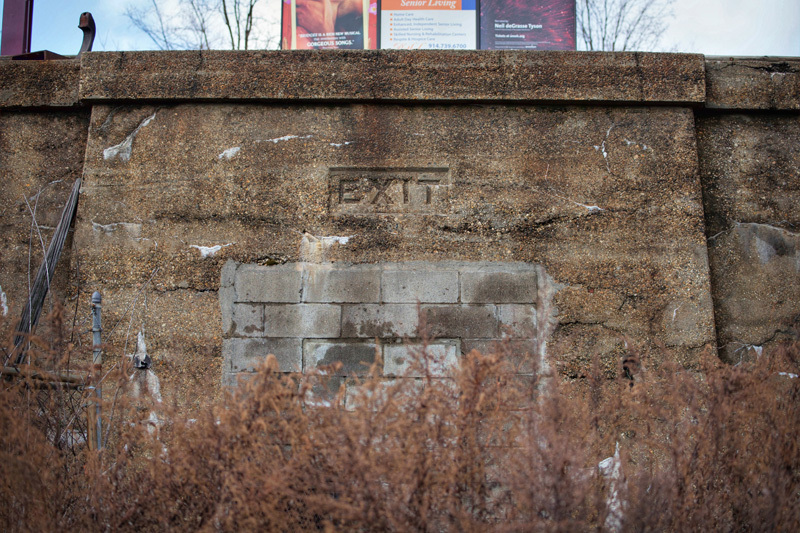 Behind masses of tall weeds is another former exit, the concrete marked with a 1916 date. 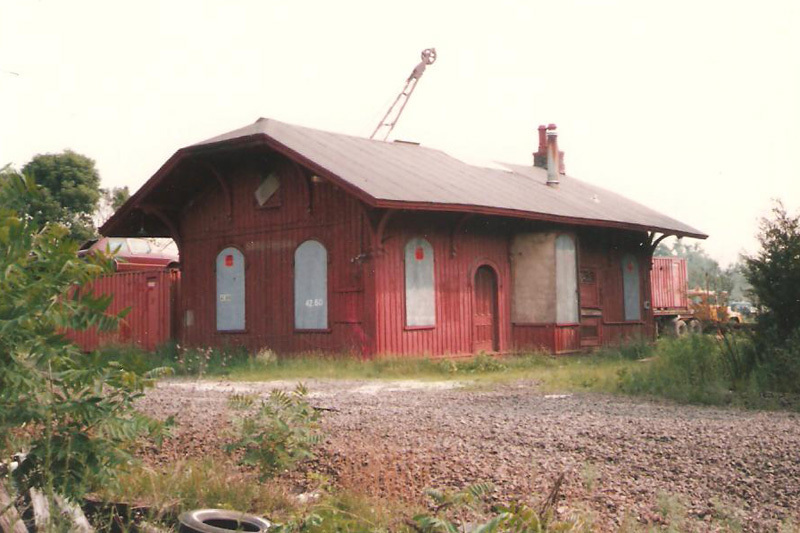 The diamond in the rough, however, is the old station building, or rather its façade. 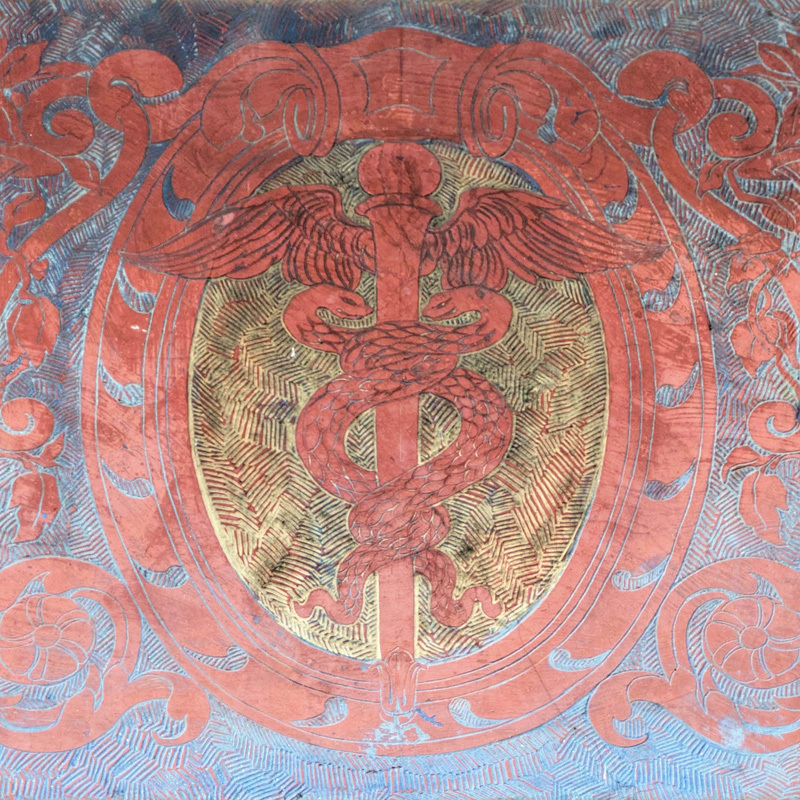 A sgraffito panel bears the traditional symbols of transportation – the winged wheel and the caduceus – positioned between the text identifying the station as one of the New York Central Railroad. 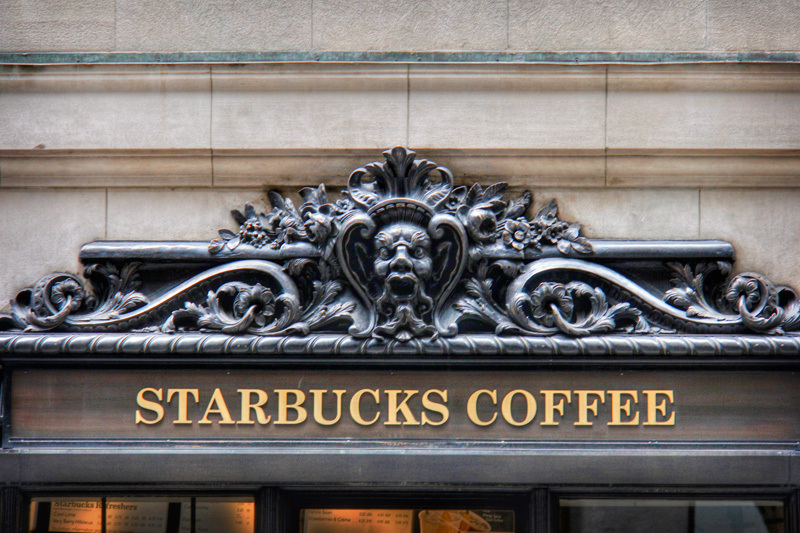 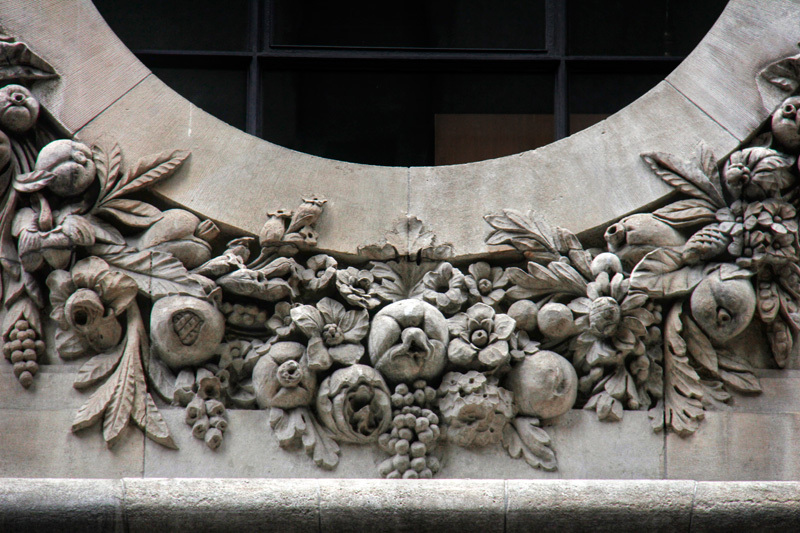 Besides this panel the adornments on the building are few, with the exception of a few sculpted flowers, surrounded by what could possibly be oak leaves. 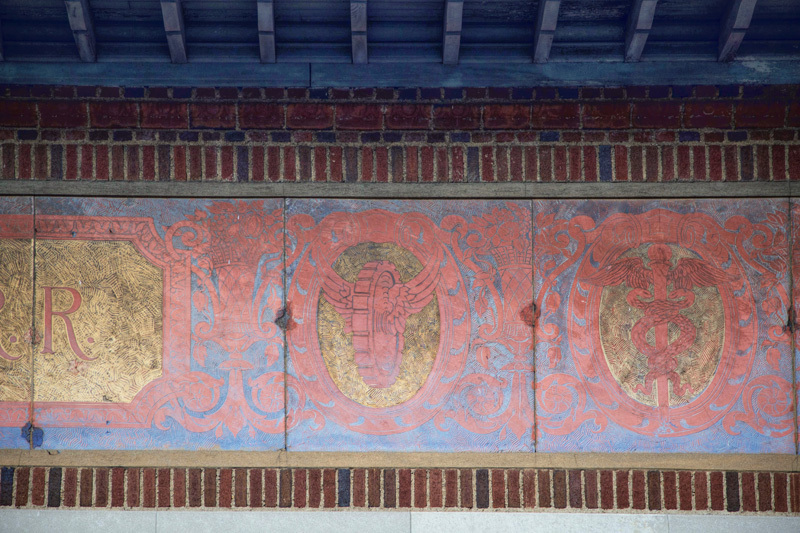 Detail shots of the sgraffito panel on Mount Vernon West station. 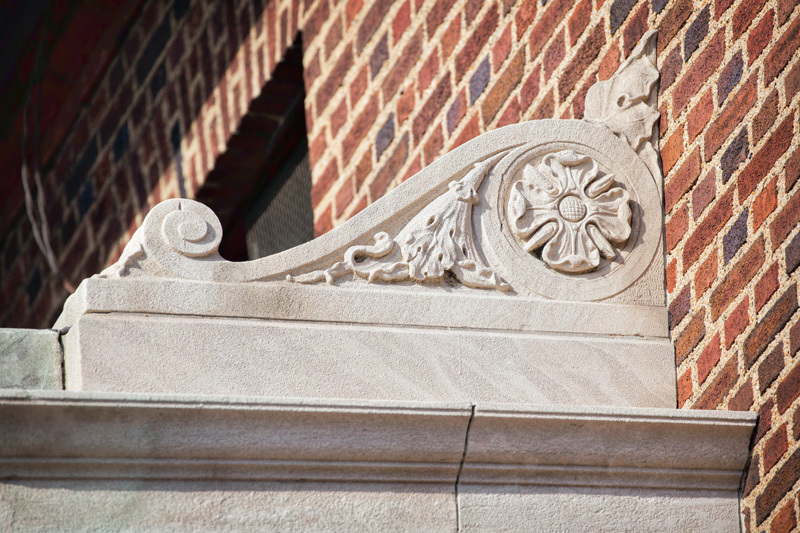 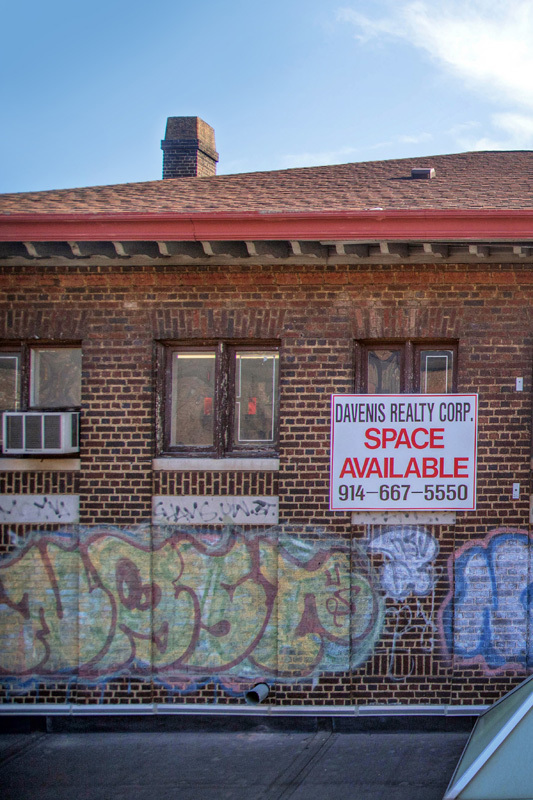 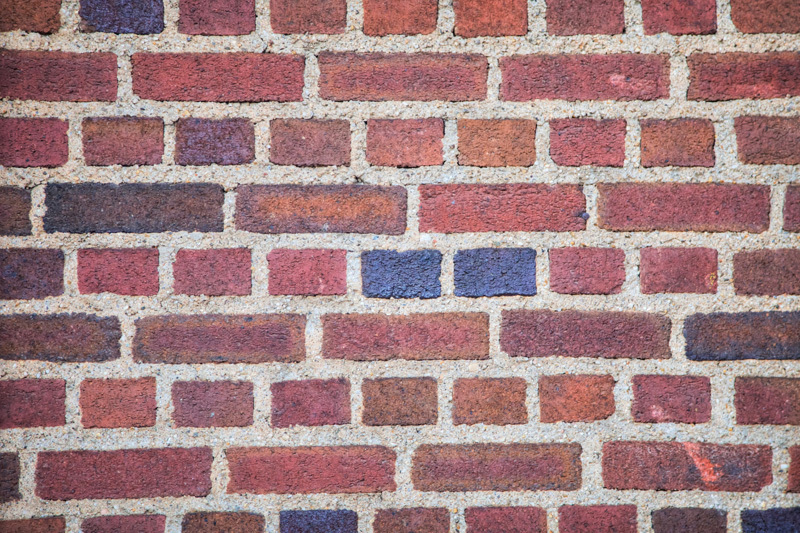 Though the building is now covered in grime and graffiti, it is undeniable that at the time of completion this red brick building with limestone paneling was quite beautiful. 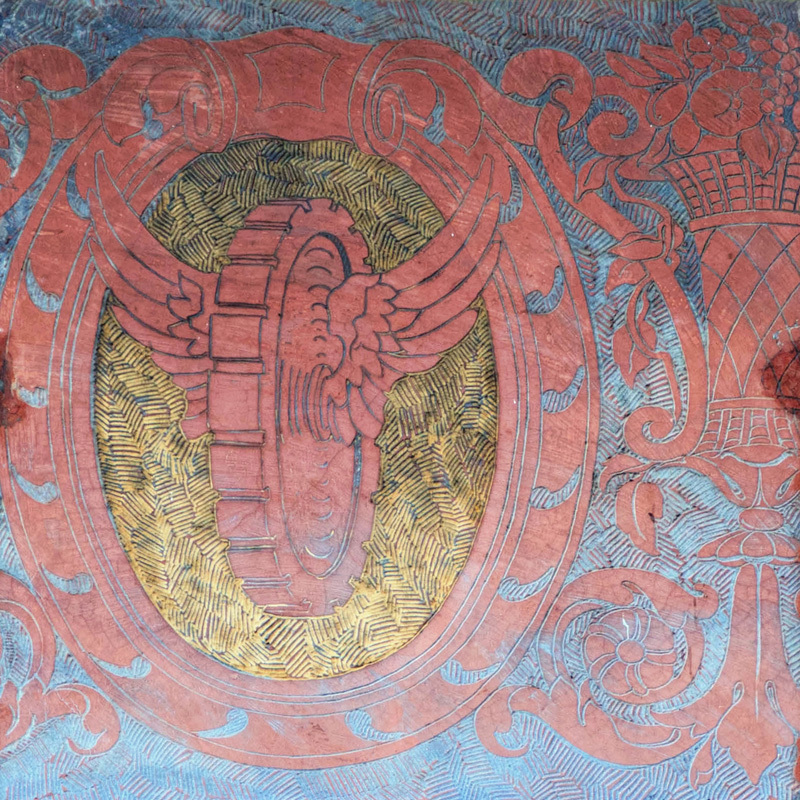 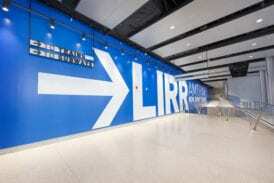 Its sgraffito panel – an art technique which uses colored plaster applied to a moistened surface and scratched to reveal details – is unique among local train stations. 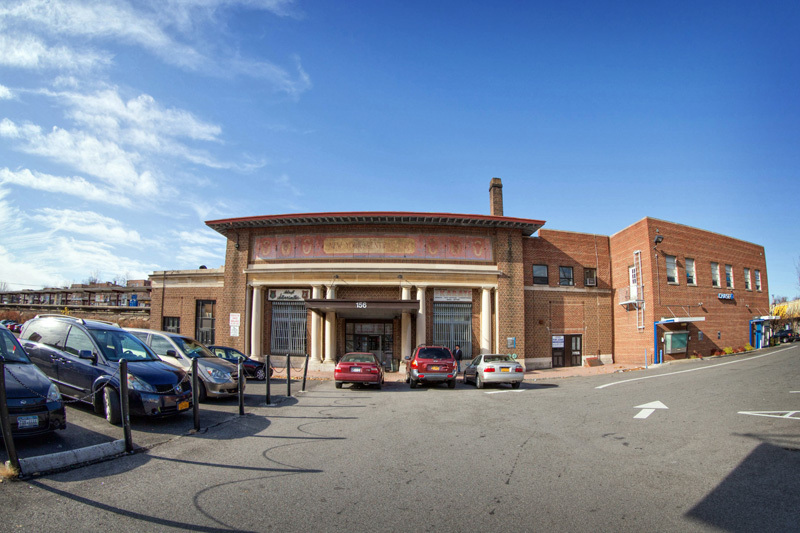 While the building is not quite as embellished as the station at Yonkers, it is still a significant building reflecting the importance of Mount Vernon. 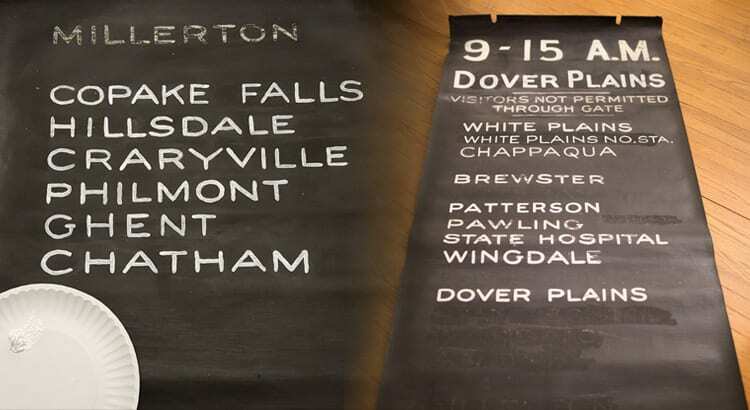 Q&d map of Mount Vernon showing the locations of the old and new stations, and how the rail line was rerouted through town. 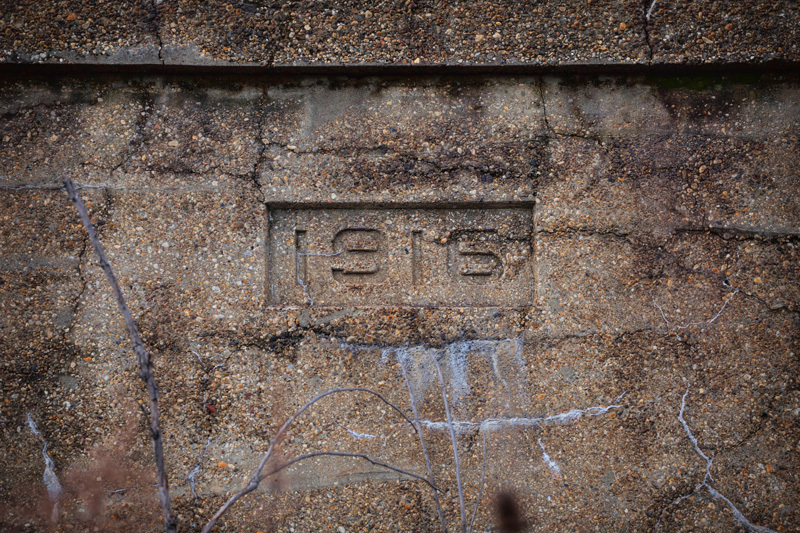 Based on a map found in the 1914 edition of the G.W. 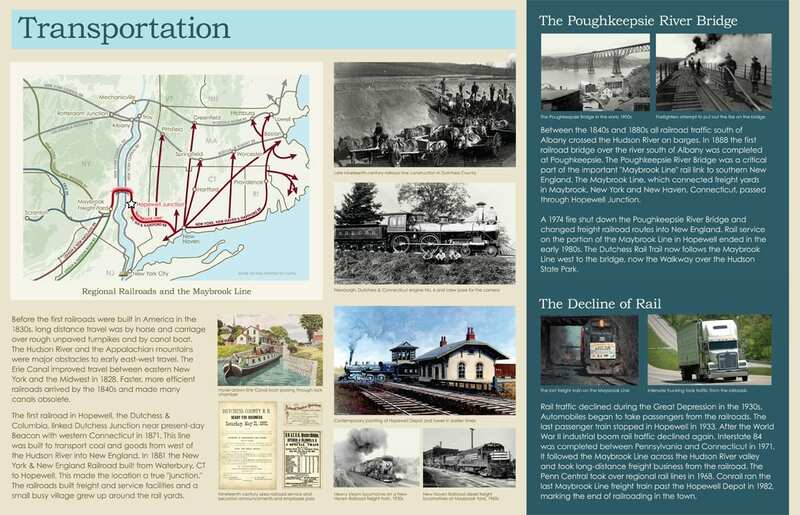 Bromley & Co. Atlas of Westchester County, via the David Rumsey Map Collection. 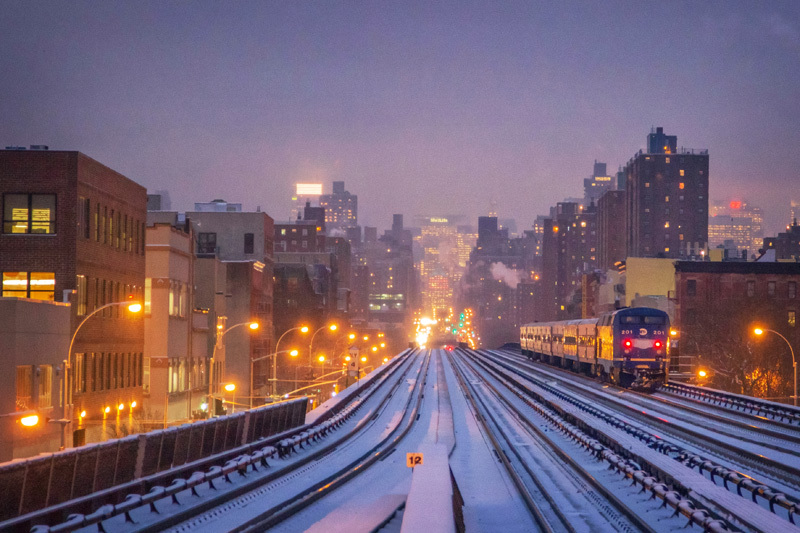 If you want to download the high res original, which shows individual tracks and sidings click here. 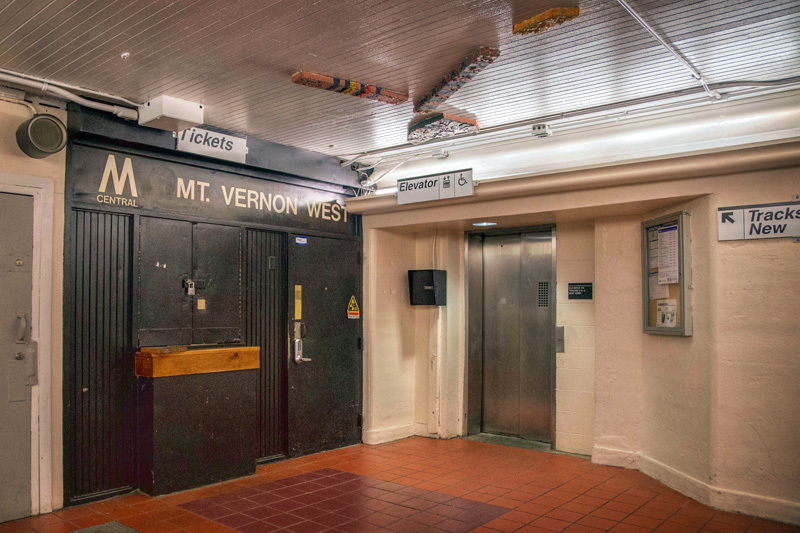 In the early 1900s Mount Vernon was experiencing significant development and was certainly an important stop on the Harlem Division, certainly warranting a new, larger station. 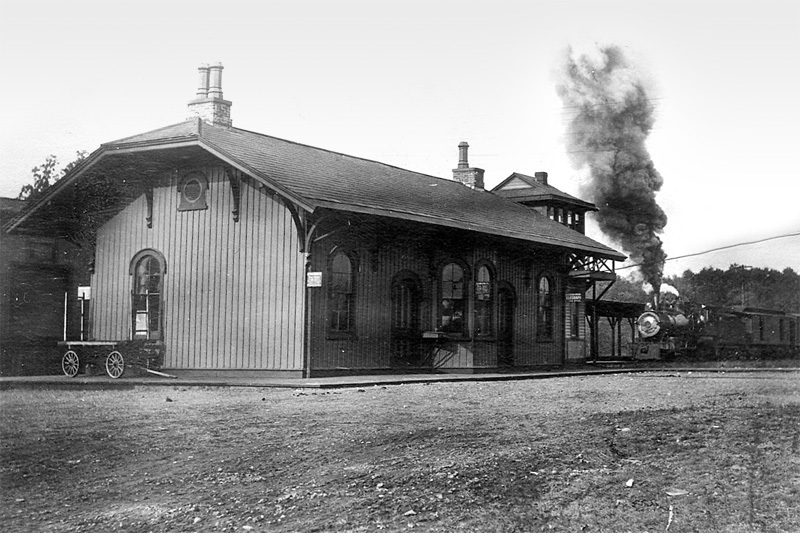 However, there was yet another important reason why the town needed a new train station. 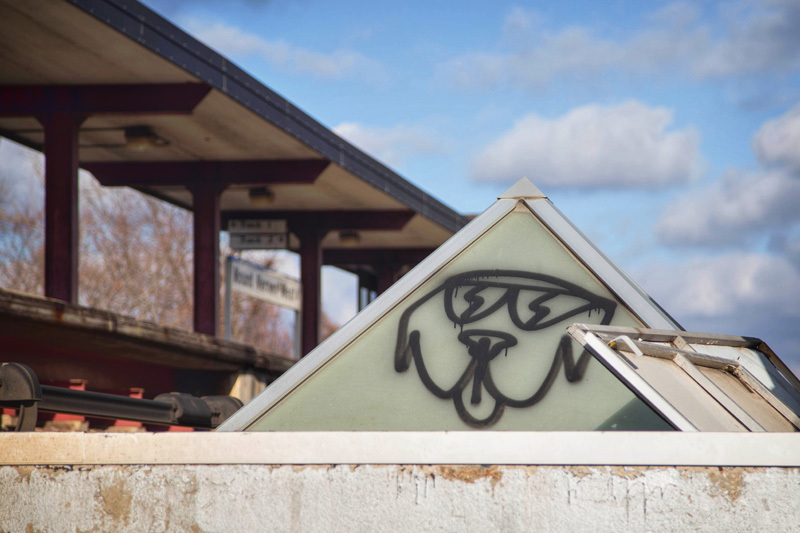 If you’ve ever had the joy of being arrested by the MTAPD and taken to their station in Mount Vernon you are familiar with MacQuesten Parkway, the street on which the police station is located. 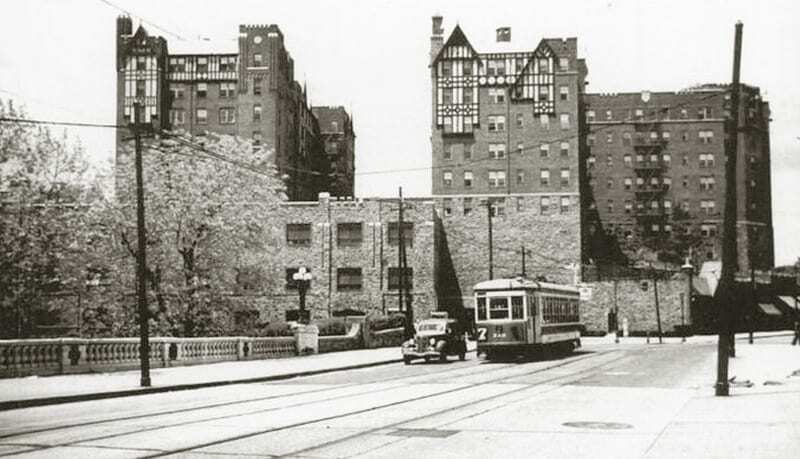 MacQuesten Parkway was once known as Railroad Avenue, and the Harlem Division ran not far from where that police station is today. 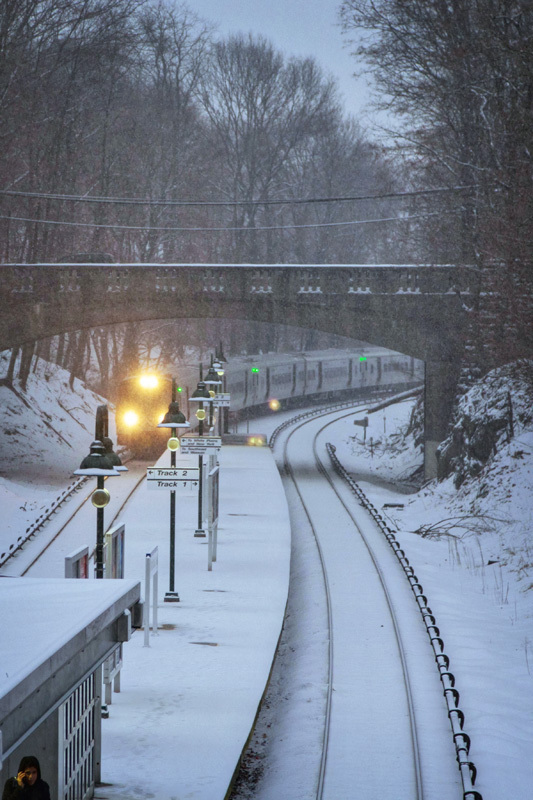 As the Harlem Division was electrified up to North White Plains, some adjustments were made in its route, one of which was in Mount Vernon. 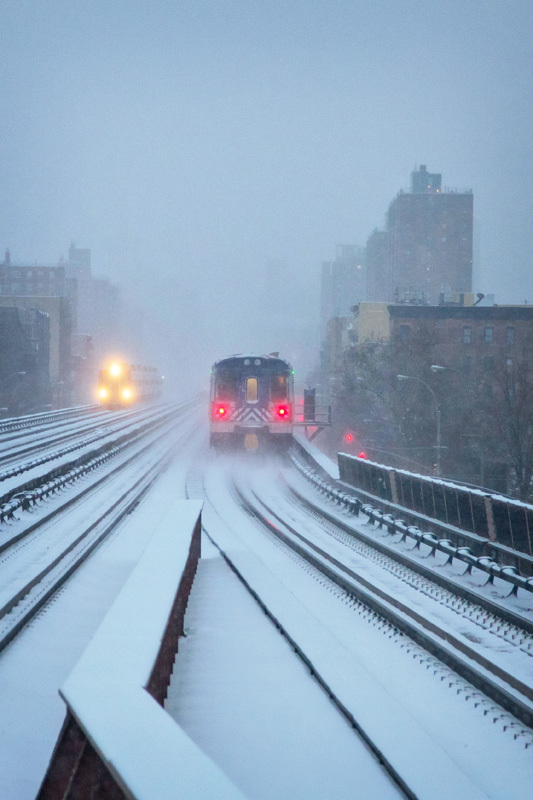 Just north of the border with the Bronx the line was raised and shifted about two blocks to the west. 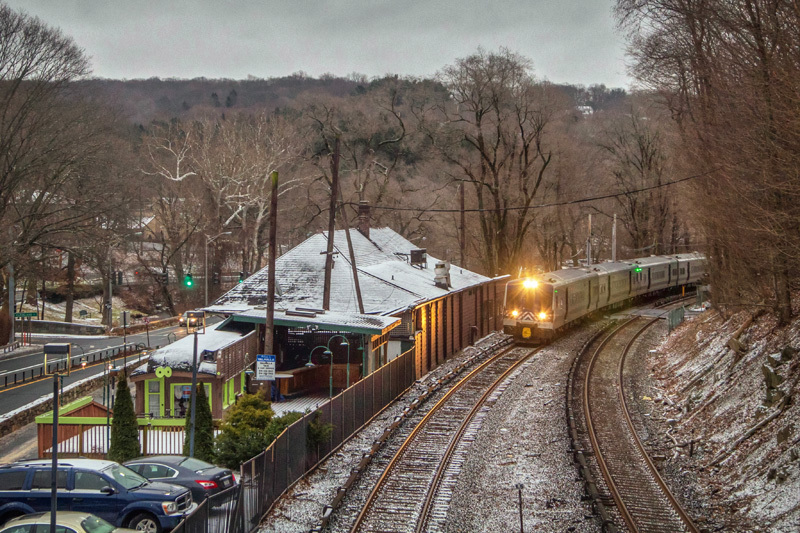 This allowed the elimination of a grade crossing in the city, and allowed the line to be four tracked. An older face of Mount Vernon – the #7 trolley line connecting Yonkers and Mount Vernon ran right next to the station. The first photo, from the book Metropolitan New York’s Third Avenue Railway System shows an eastbound trolley just west of the station. 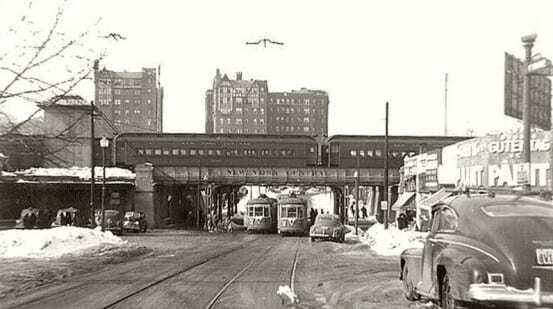 The lower photo from SoYo Sunset shows two trolleys crossing under the New York Central’s tracks, and a northbound train departing Mount Vernon station (which is at left, out of the frame). 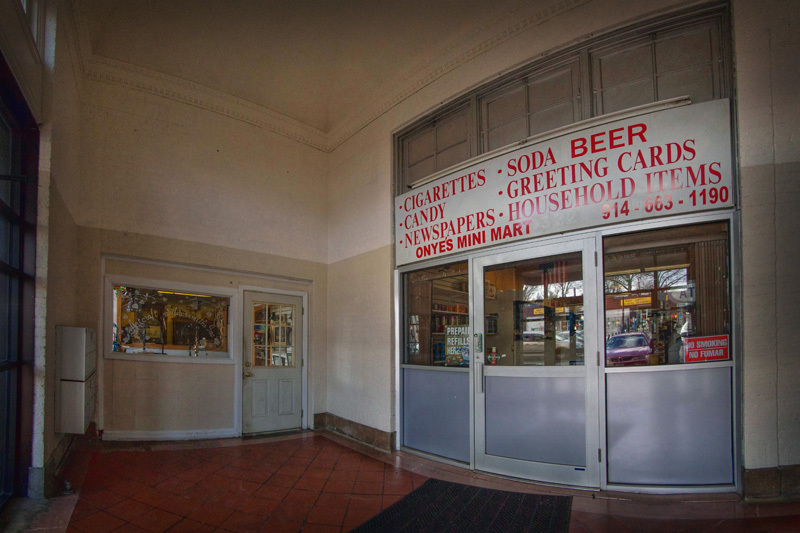 An array of businesses have found homes in the old station over the years, from a silversmith to a pharmacy, a photography shop, and even a karate studio in the building’s upper floor. 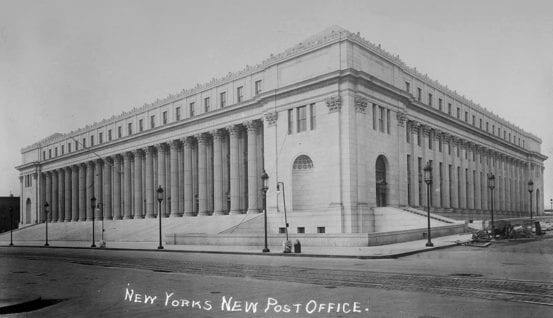 The north wing that was demolished and rebuilt has been various banks over the years – in the ’80s the Bank of New York, today Chase. 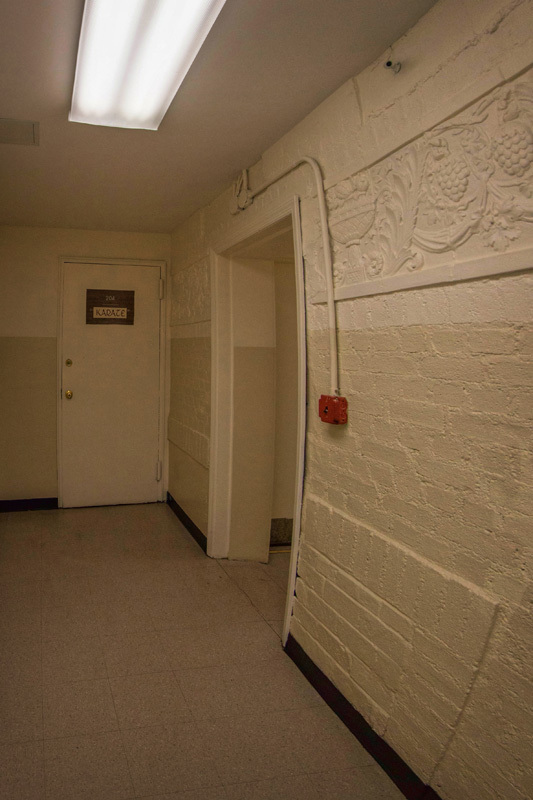 Original details on the inside are very few, but some design work can be found on the walls of an upper hallway. 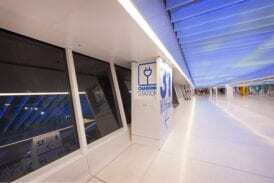 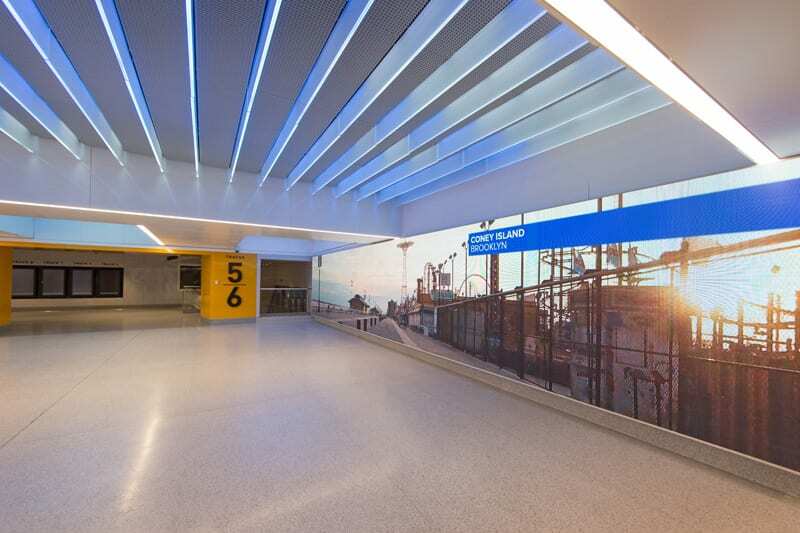 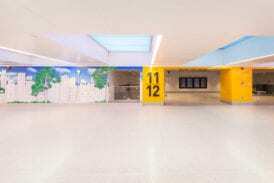 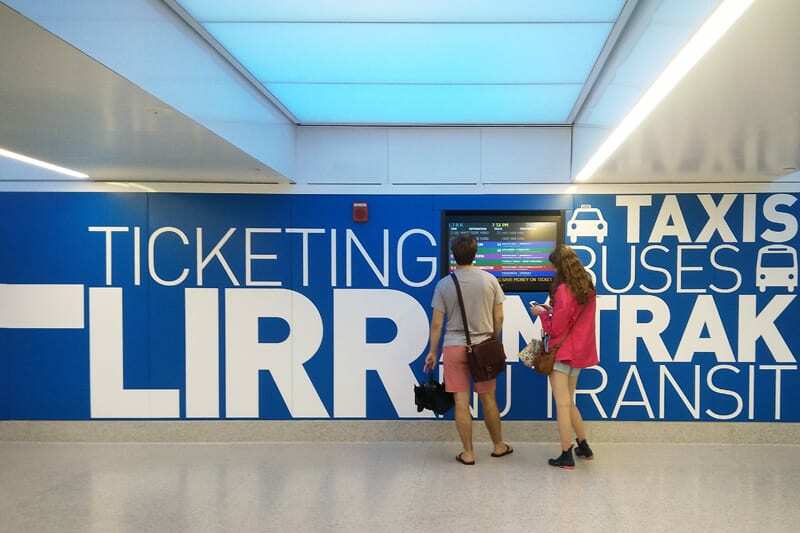 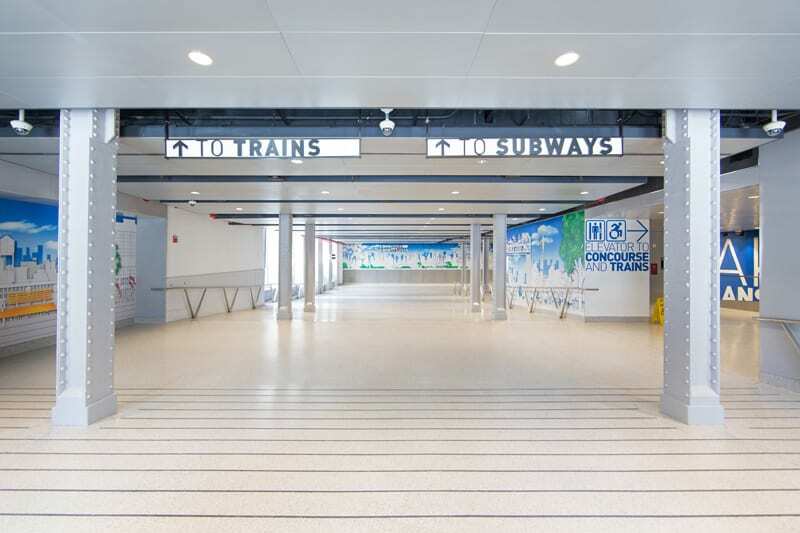 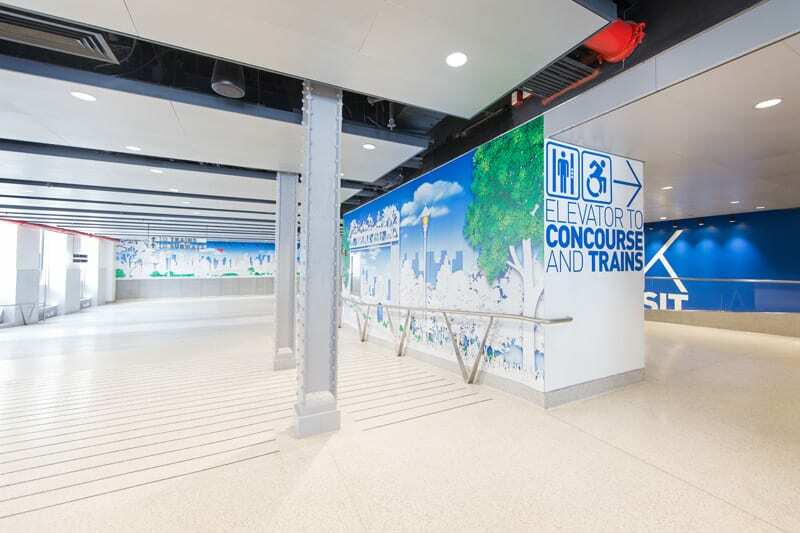 The current train station, which consists of the tunnels under the tracks, is hardly noteworthy except for the old “M Central” signage and the Arts for Transit piece by Martha Jackson-Jarvis. 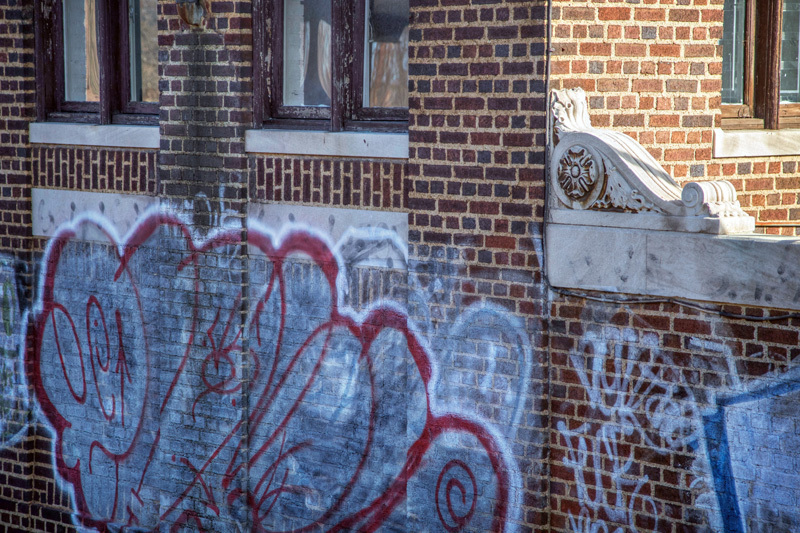 Upstairs on the platform level one can see the back of the once great train station, now covered in graffiti. 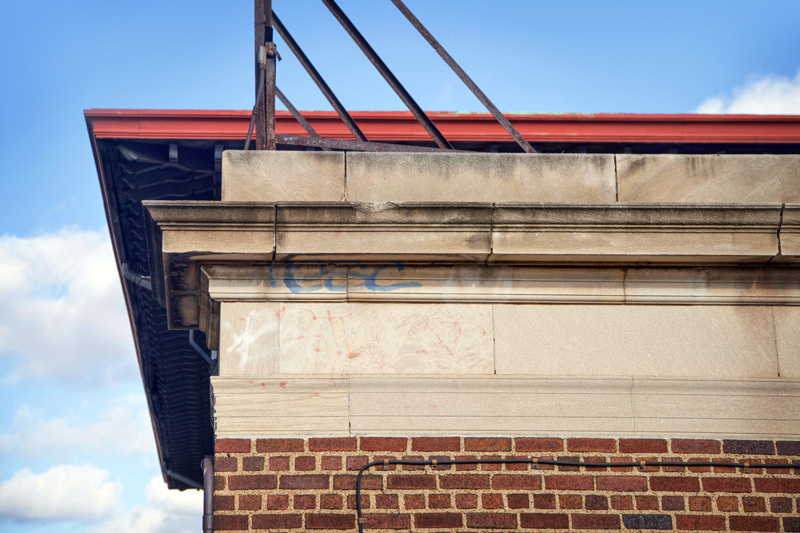 It is mildly amusing to note that the words sgraffito – the art found on the station, and graffiti – the spray marks tagged on the historical building both share the same origins. 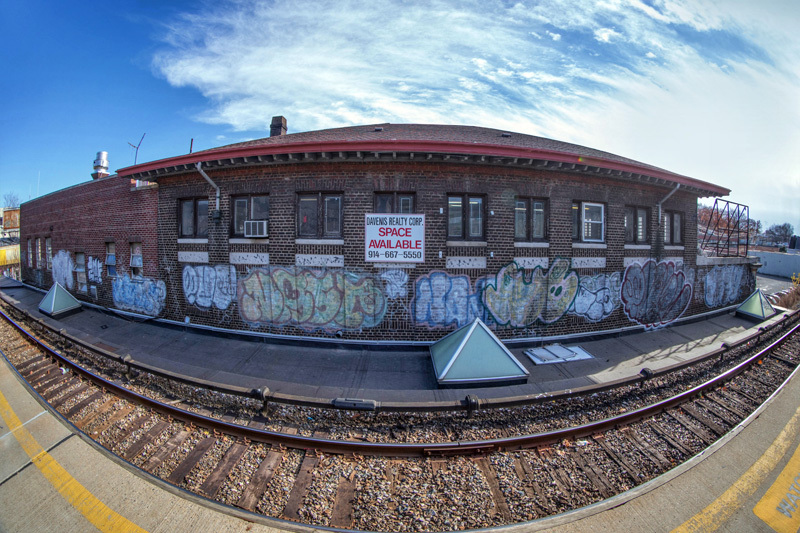 I generally appreciate the graffiti along rail lines, but it is a shame to see it mar a nearly hundred year old station… it seems to be the final, sad outcome of a once proud station, reflecting the downfall of a once great railroad, now long gone. 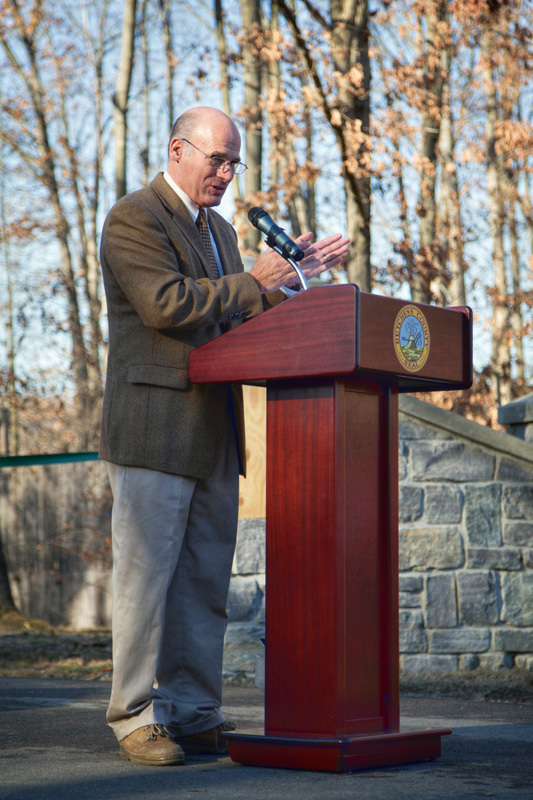 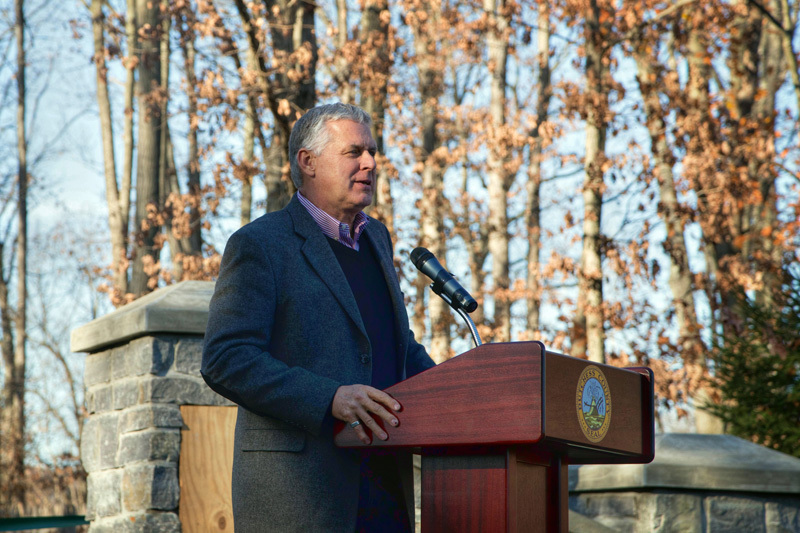 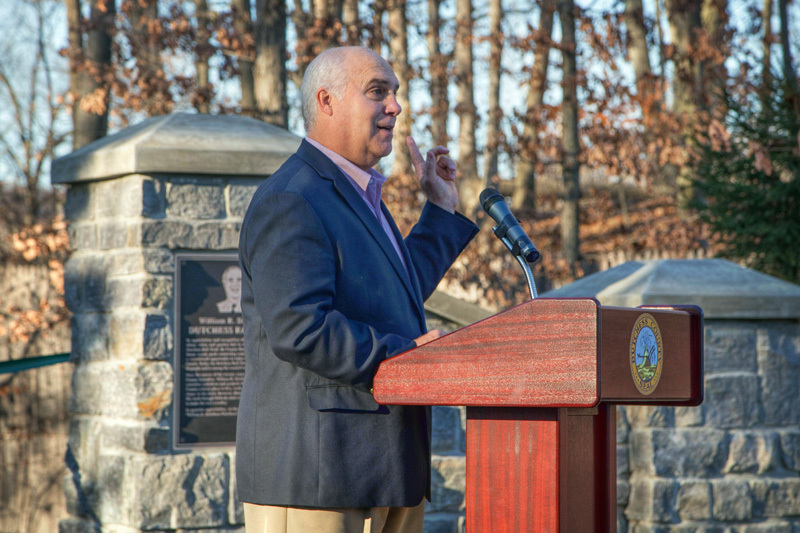 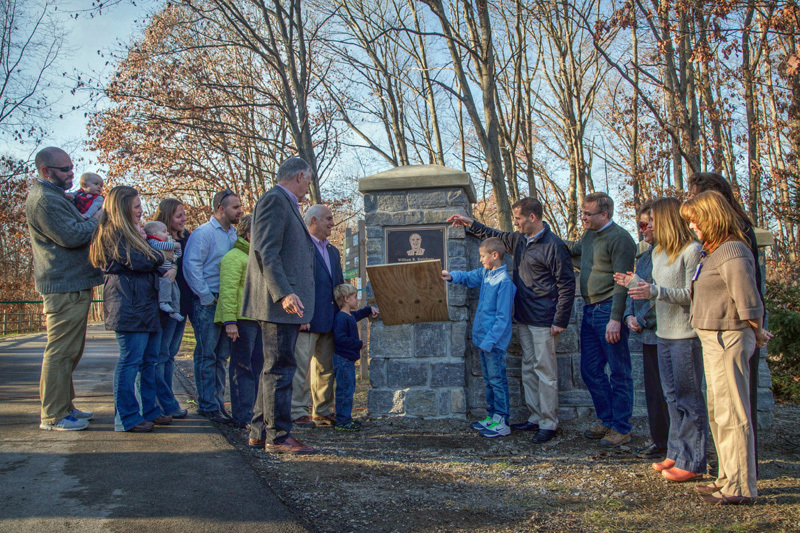 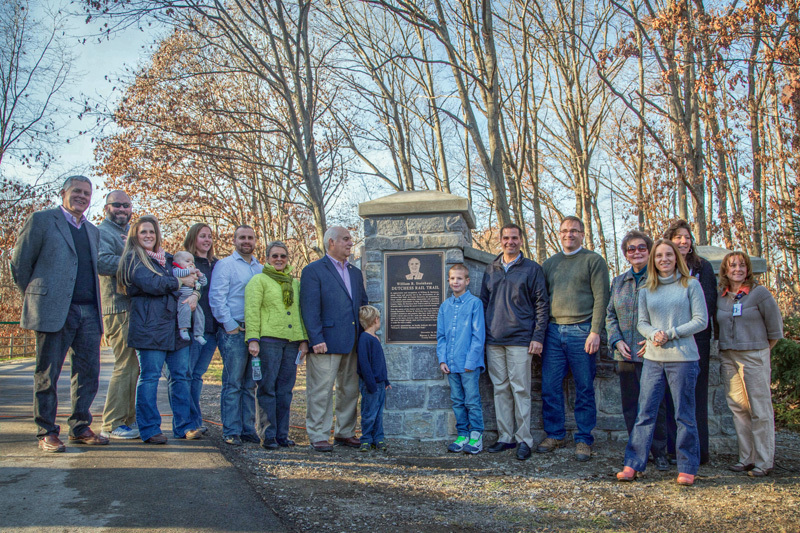 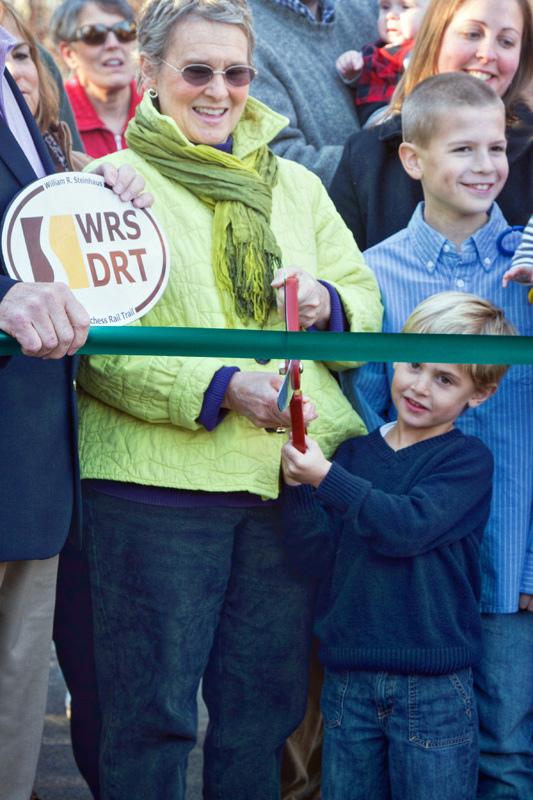 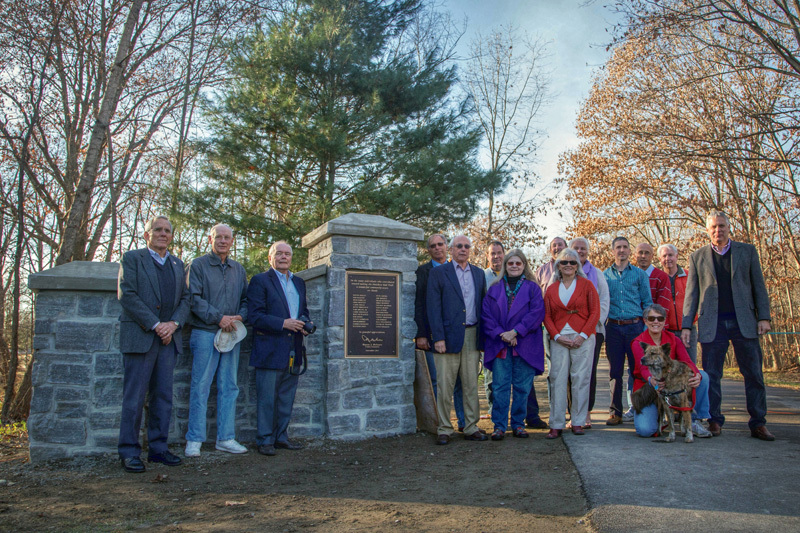 Last Saturday marked the official opening of the Dutchess Rail Trail, and festivities were held in Hopewell Junction to celebrate this newly completed “linear park.” Though the event focused on the dedication of the rail trail to former County Executive William R. Steinhaus, it is impossible to miss the newly-restored depot just steps away. 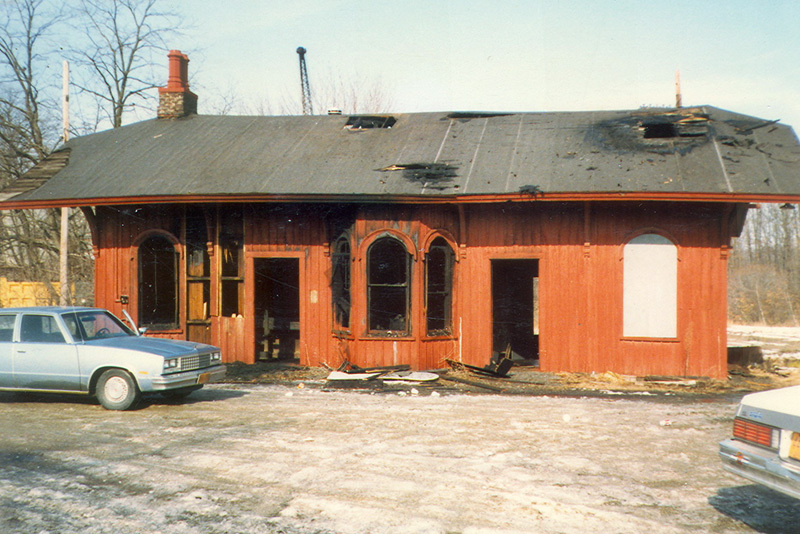 After many years of lying vacant, and even being burned by arsonists, the depot was eventually restored to greatness. 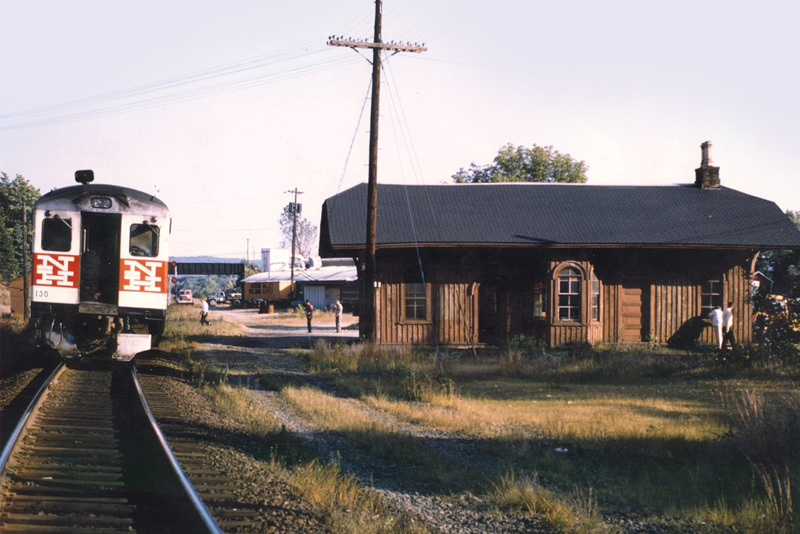 The depot lies at the east end of the trail, and will serve as a welcome center for visitors. 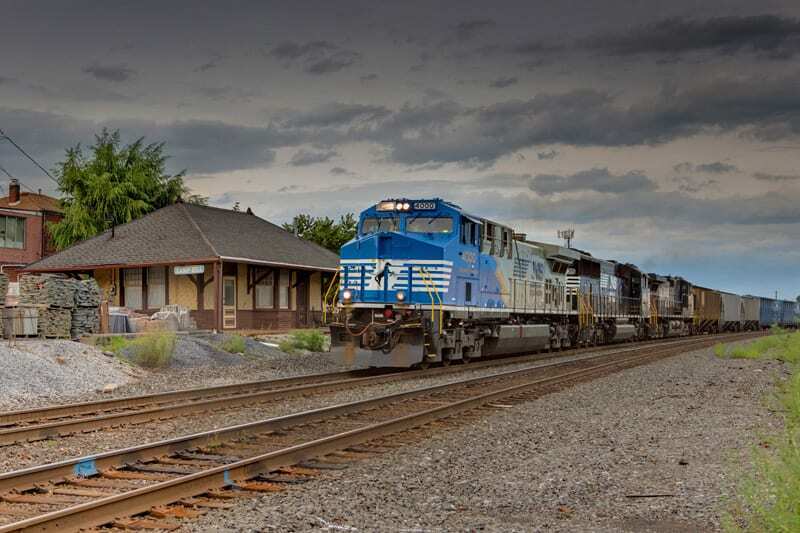 Hopewell has a long history of railroading – the first railroad to arrive was the Dutchess and Columbia in 1871. 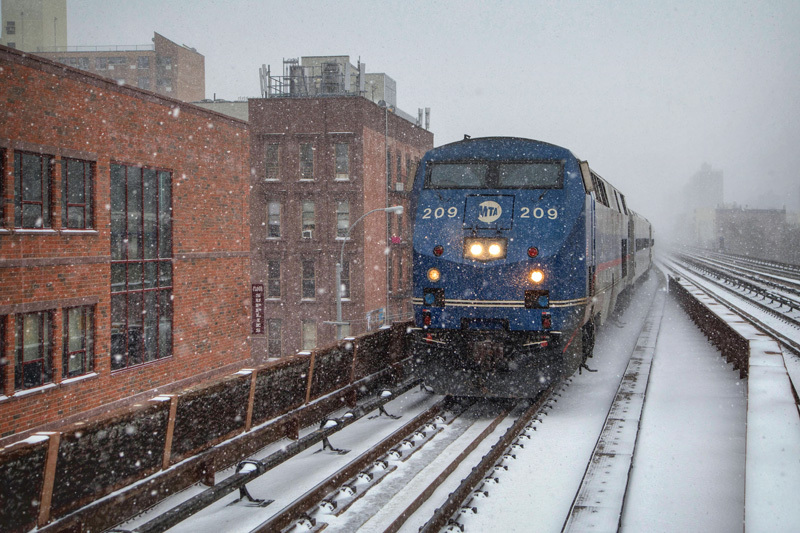 It was followed by the New York & New England’s line in 1881. The first railroad crossing over the Hudson River south of Albany opened in Poughkeepsie in 1888, leading to additional traffic through Hopewell. 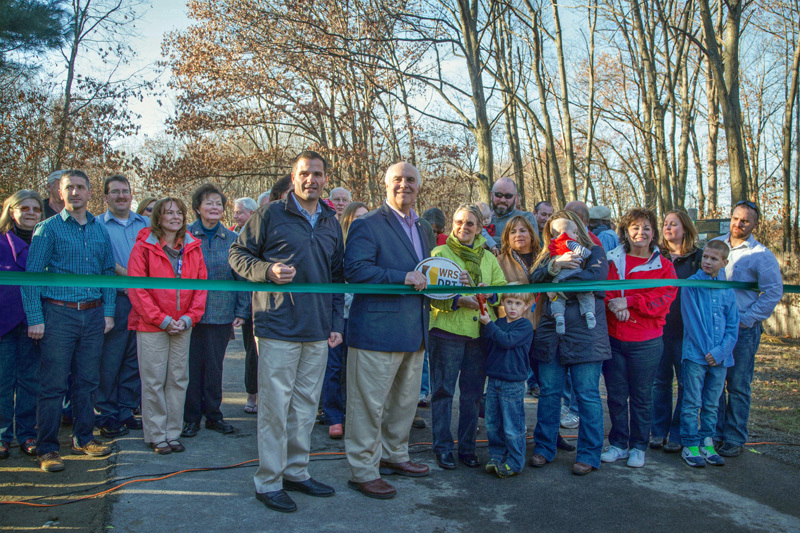 That link formed the “Maybrook Line,” which is now the Dutchess Rail Trail. 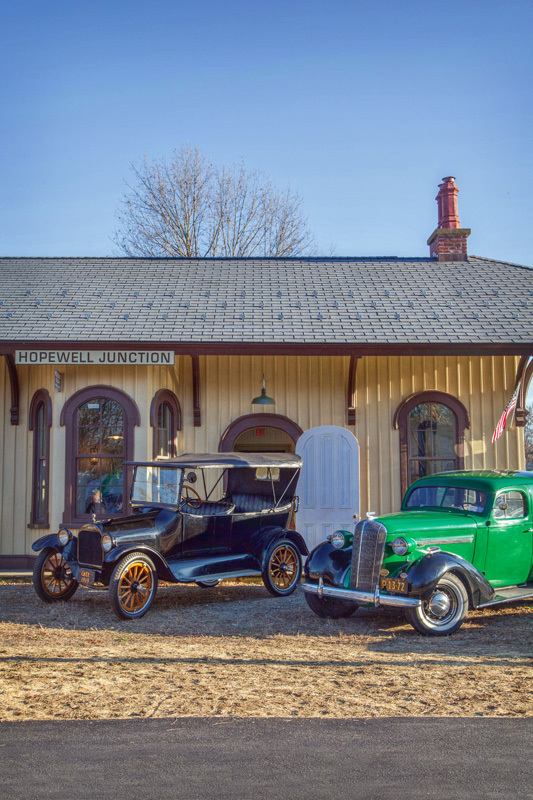 Historical views of Hopewell Junction depot. 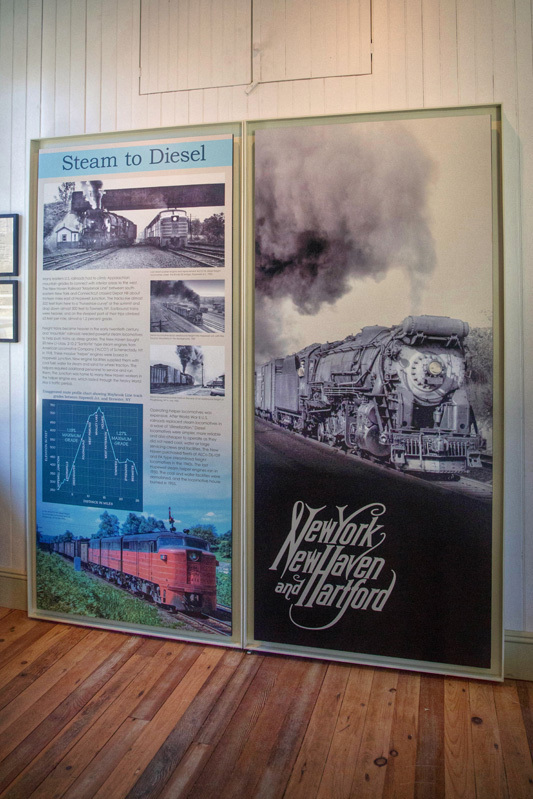 All photos via the Hopewell Junction Restoration Corp.
Saturday’s festivities also marked an unofficial event for the Depot – the first opening of what I call the “museum room.” Over the past few months, I worked with other volunteers to design four interpretive panels highlighting the history of local railroading through Hopewell, and its impact on the community. 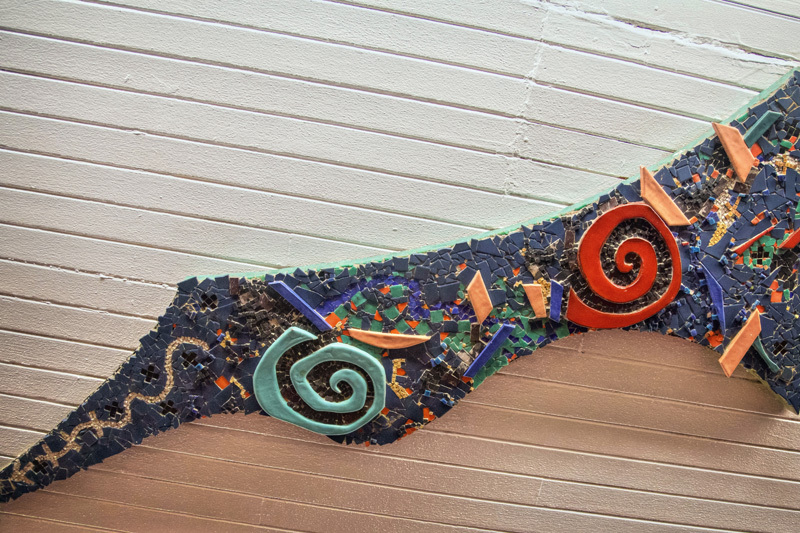 All four panels were completed, printed, and hung for the rail trail event. 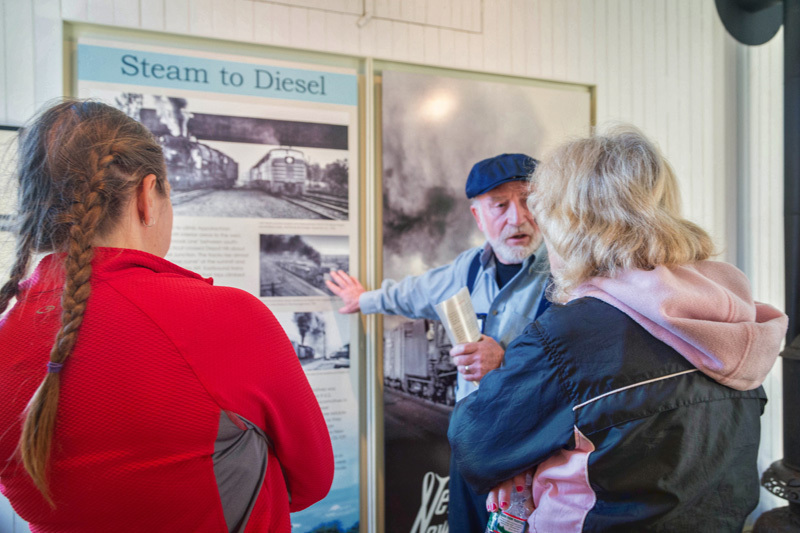 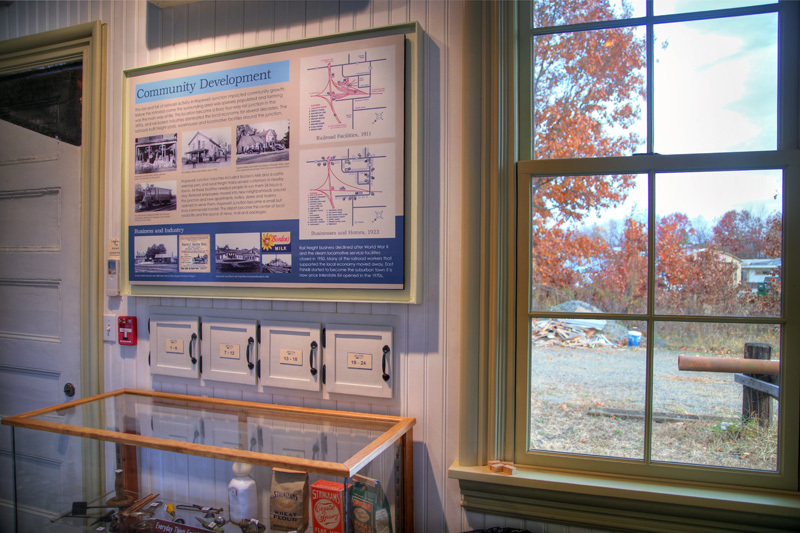 The restored Hopewell Junction Depot and the new interpretive panels on display. 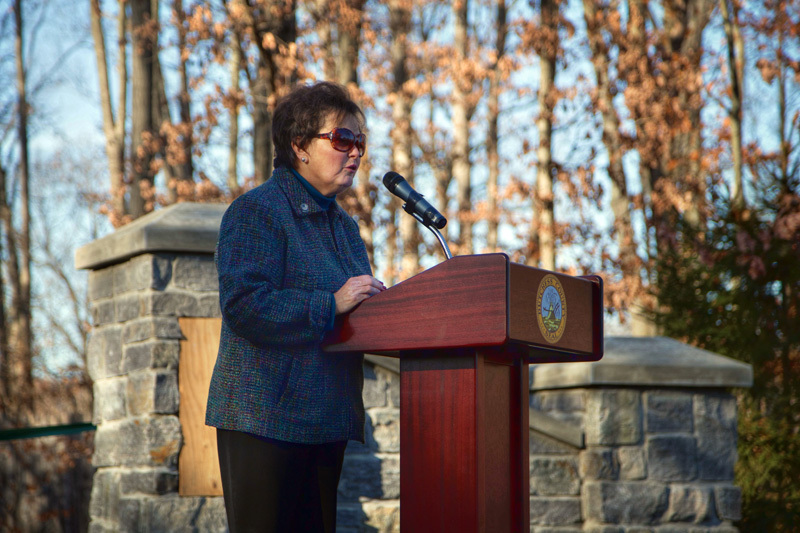 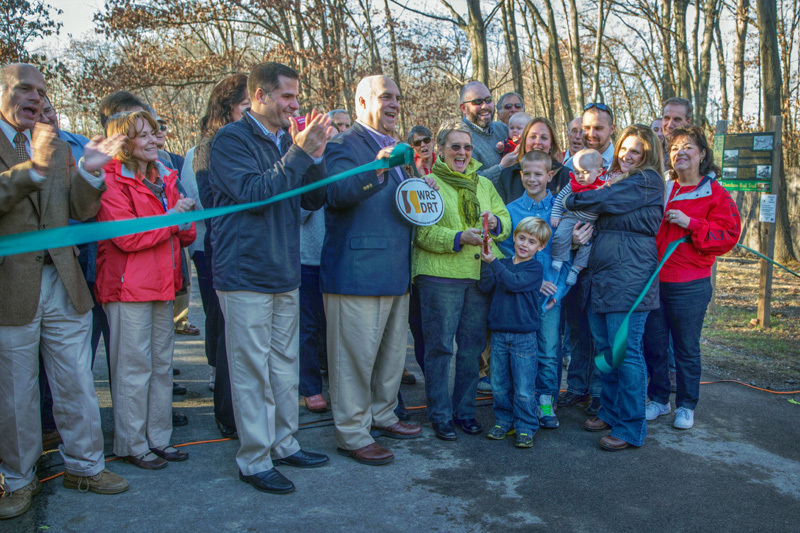 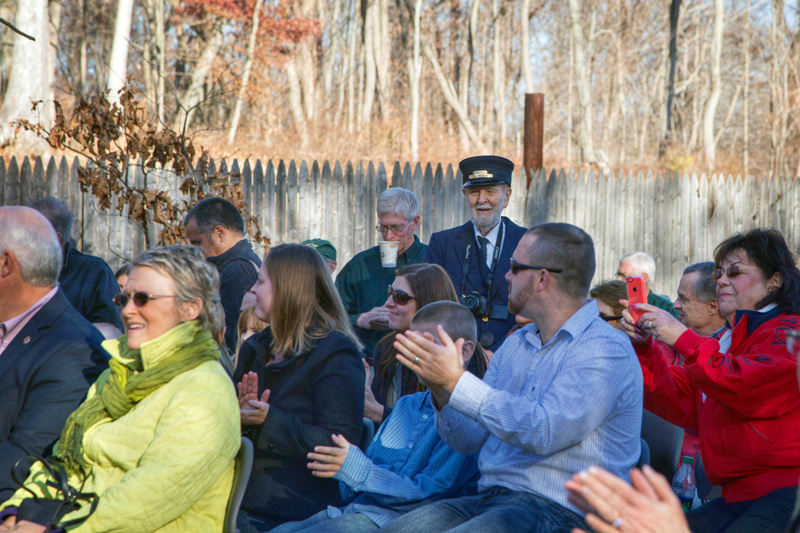 In all, the Dutchess Rail Trail opening was a lovely event, and heavily attended. 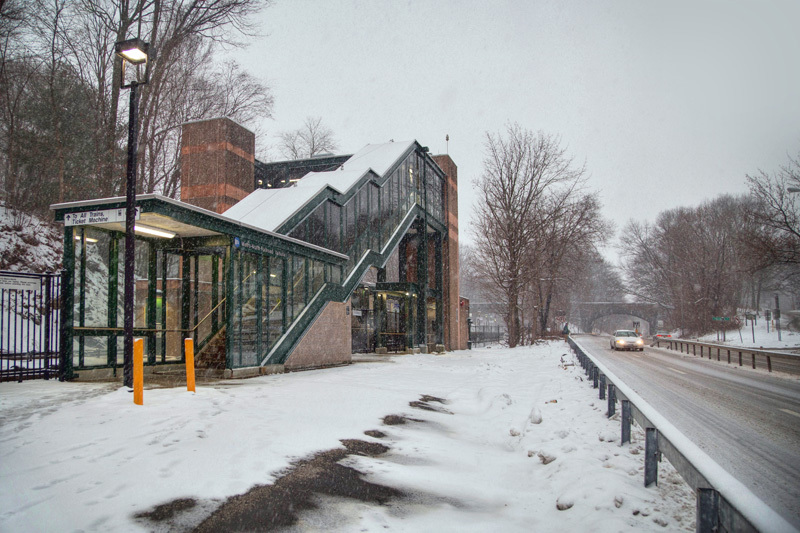 Hopewell Junction is now connected by trail to the Walkway Over the Hudson, which is an attractive journey. 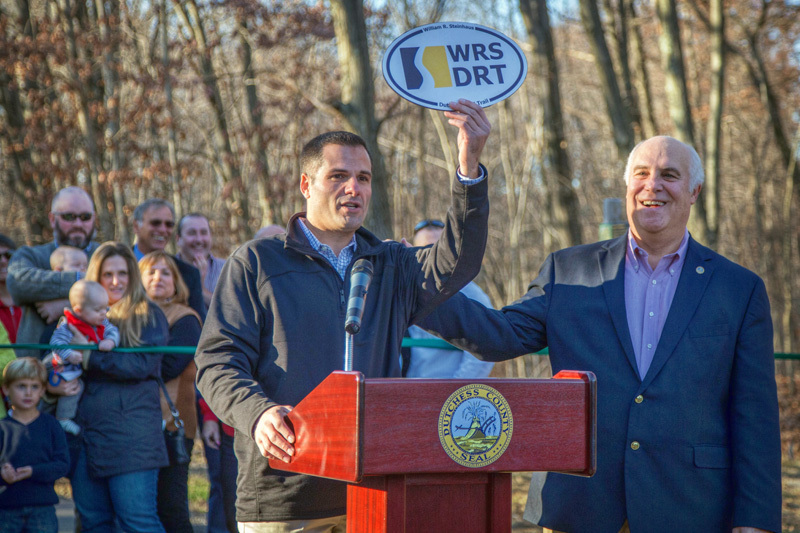 While some of the most die-hard railfans are sometimes against the conversion of rail lines into rail trails, I am generally in support of rail trails due to the fact that they preserve the history of abandoned rail lines. 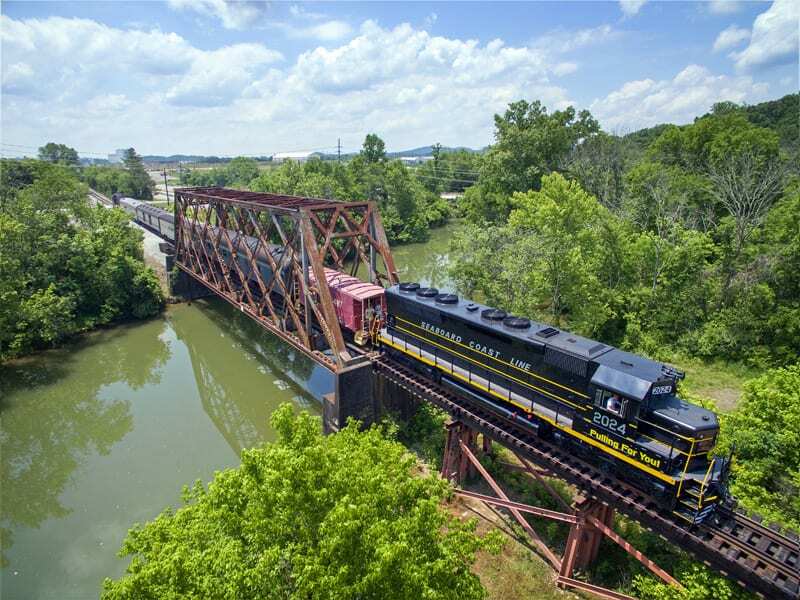 The original concept behind rail trails was railbanking – essentially preserving the railroad’s right of way in case there would be reactivation in the future. In practice, however, railbanking by converting to trails is at best a scam, and at worst an acceptable to way to grab land, or a method to support the trucking industry by ensuring that competition by rail freight will never be restored. 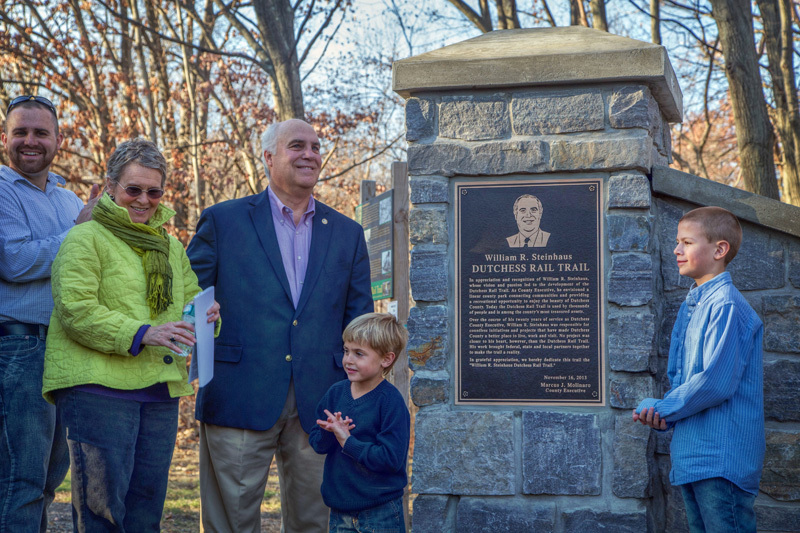 Once the right of way is converted to a trail, turning it back into a rail line is almost impossible, or as Metro-North President Howard Permut said regarding reactivating the Harlem Line up to Millerton, “how do you de-map a rail trail?” Although the Rails to Trails Conservancy admits its origins in the concept of railbanking, they have little regard for railroads. 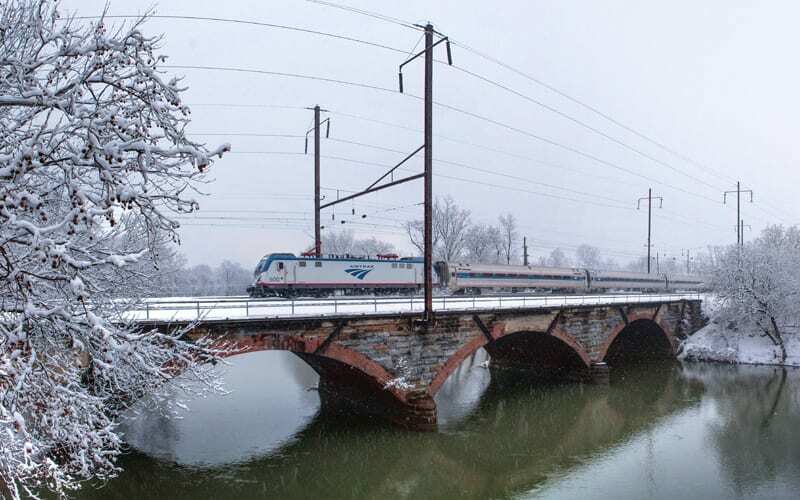 In fact their 2011 annual report celebrates a victory in preventing a rail line from reactivating service – and we’re talking about a rail line that still had tracks on the ground, and had not been turned into a trail. 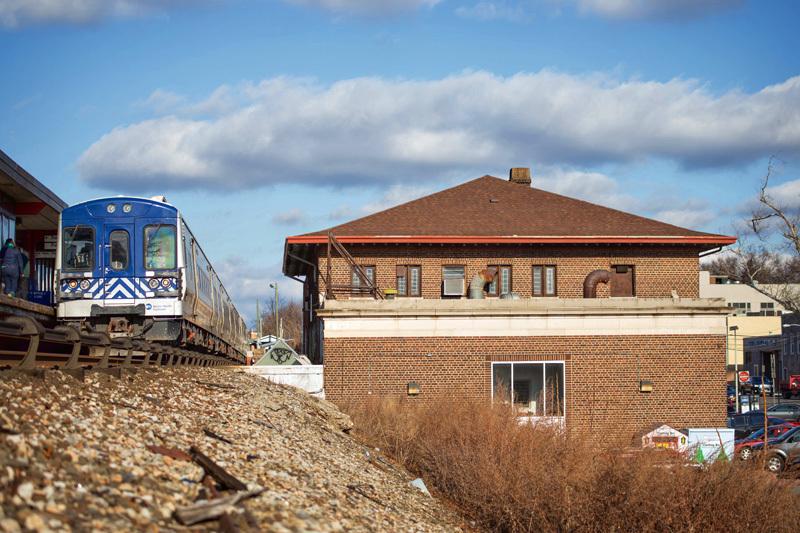 Unfortunately, the once-laudable concept of preservation by saving abandoned rail corridors has been perverted. Instead of saving abandoned corridors, trail proponents have set their sights on driving out existing railroads and claim the right of way for themselves (the Rails to Trails Conservancy’s how-to Acquiring Rail Corridors guides would-be vultures to circle existing railroads until they die). 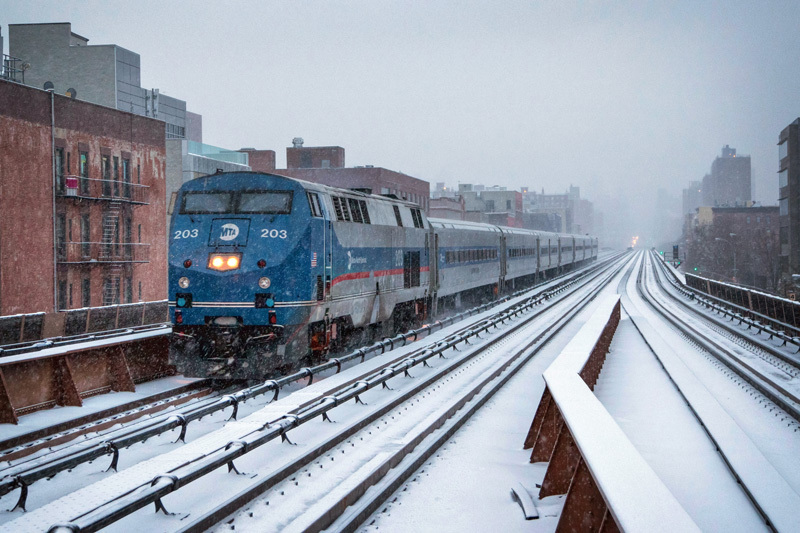 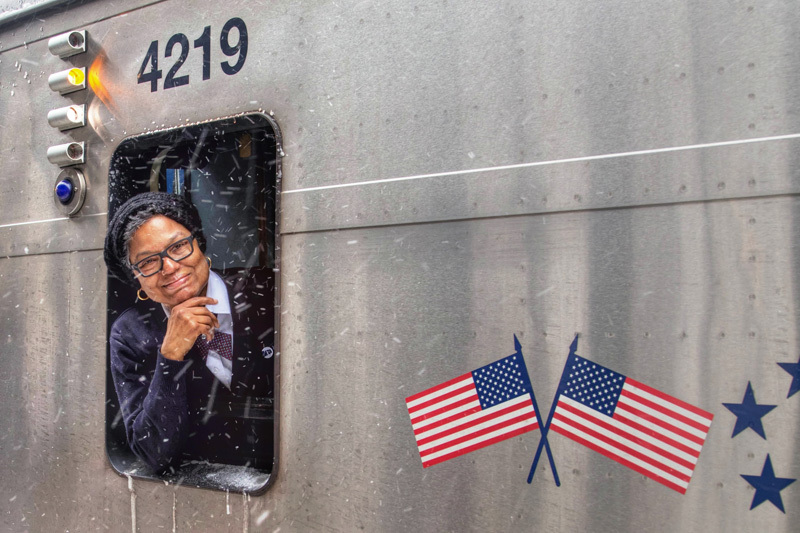 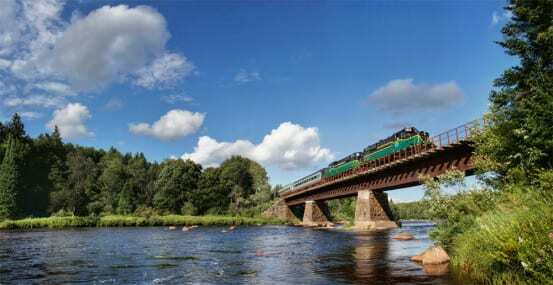 Two New York Rail lines – the Catskill Mountain Railroad, and the Adirondack Scenic Railroad – are both under fire from politicians and an extremely vocal group of trail proponents that want them gone by any means (including committing felonies and vandalism). 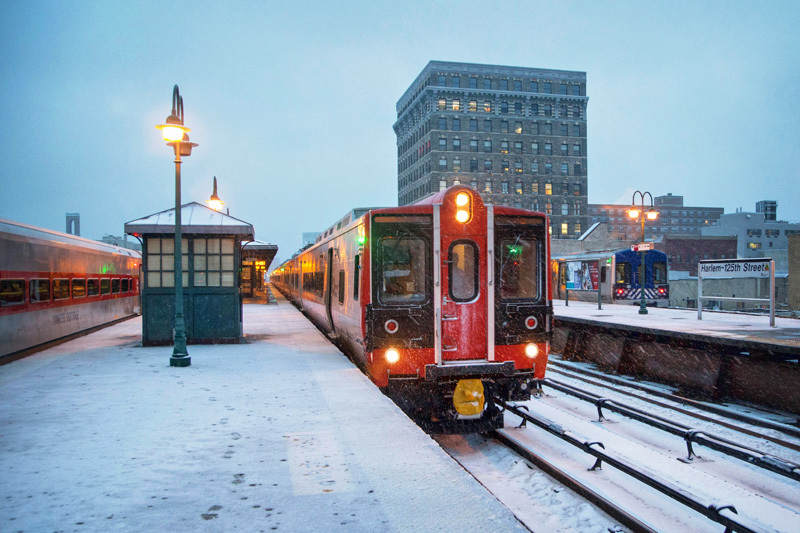 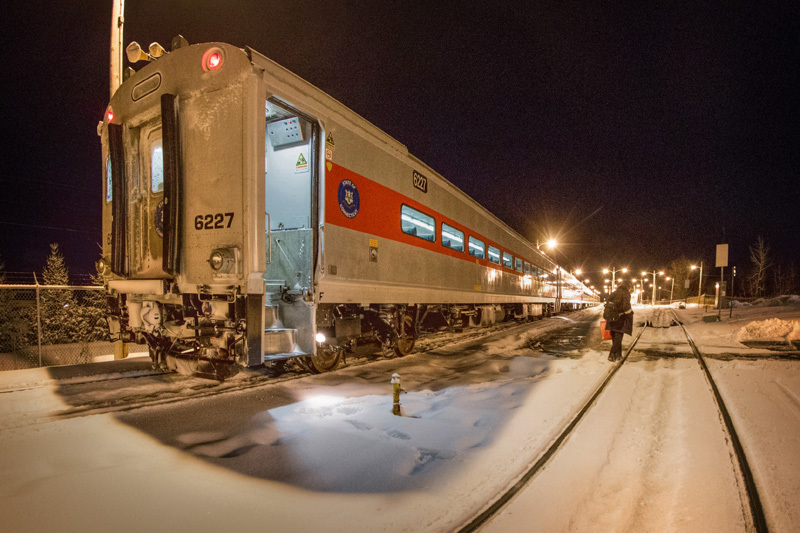 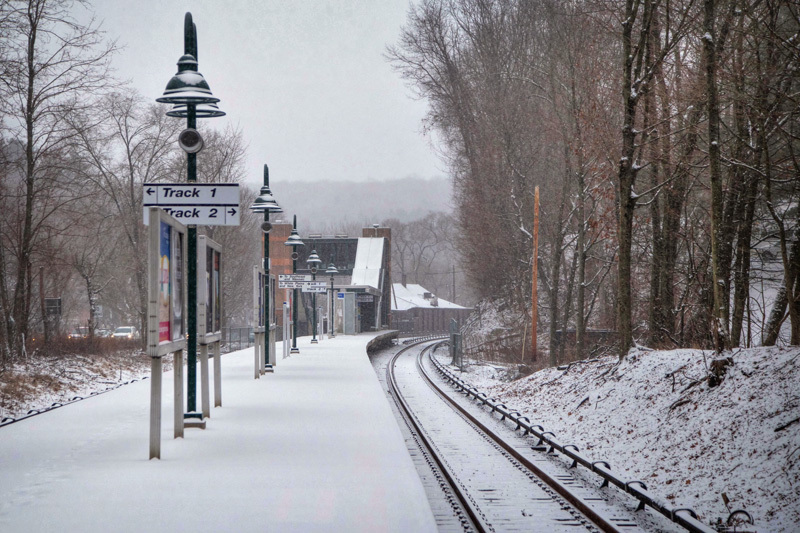 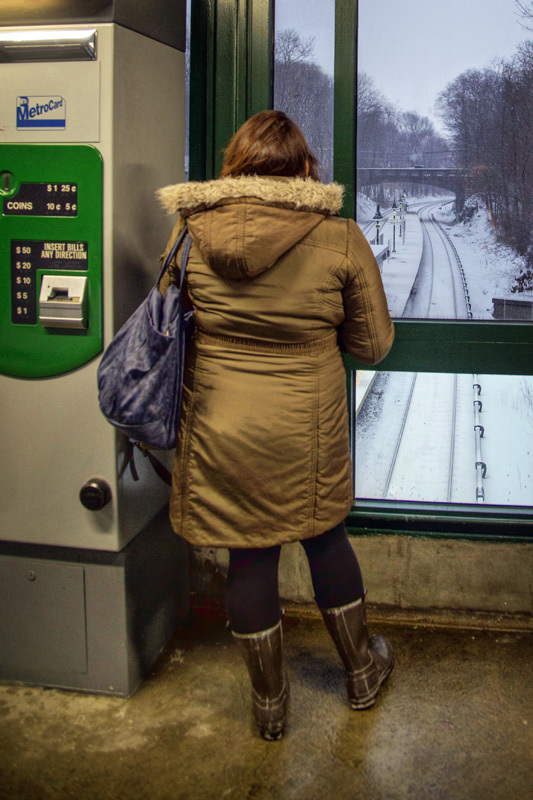 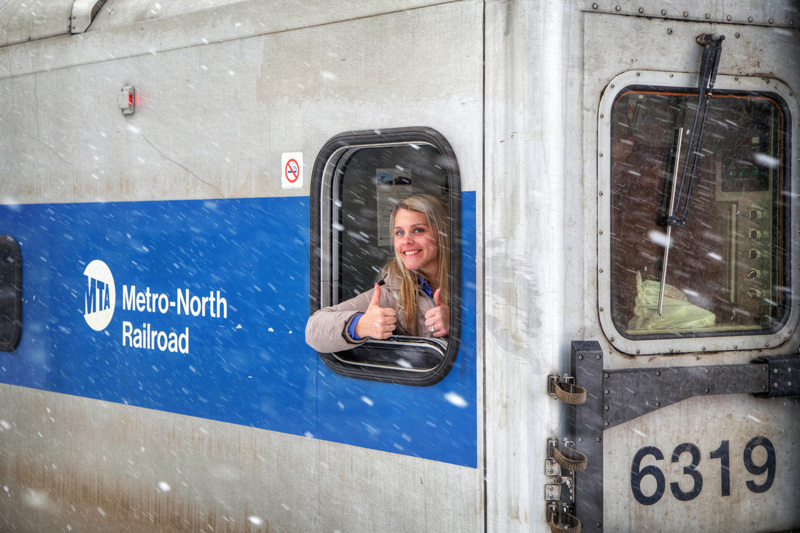 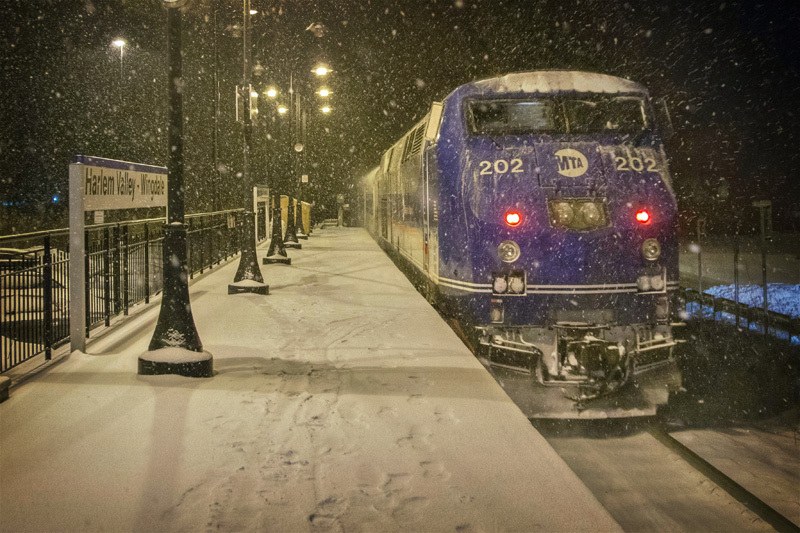 The most serious case is the Catskill Mountain Railroad – a successful all-volunteer operation that attracts visitors from around the state and beyond to ride its scenic trains. 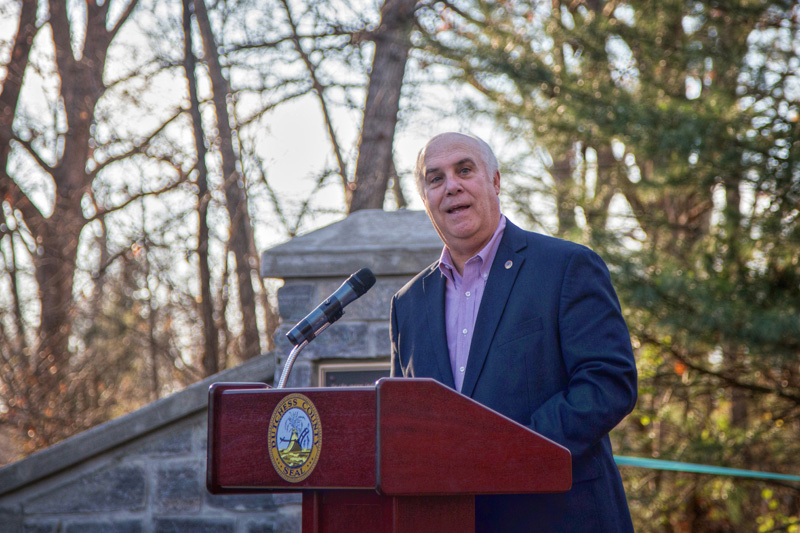 While I credit former Dutchess County Executive Steinhaus for his role in preserving history on both the Dutchess and Harlem Rail Trails, it seems that Ulster County Executive Mike Hein is green with jealousy, and foaming at the mouth to get his own rail trail, even if it means taking down an active railroad in the process. 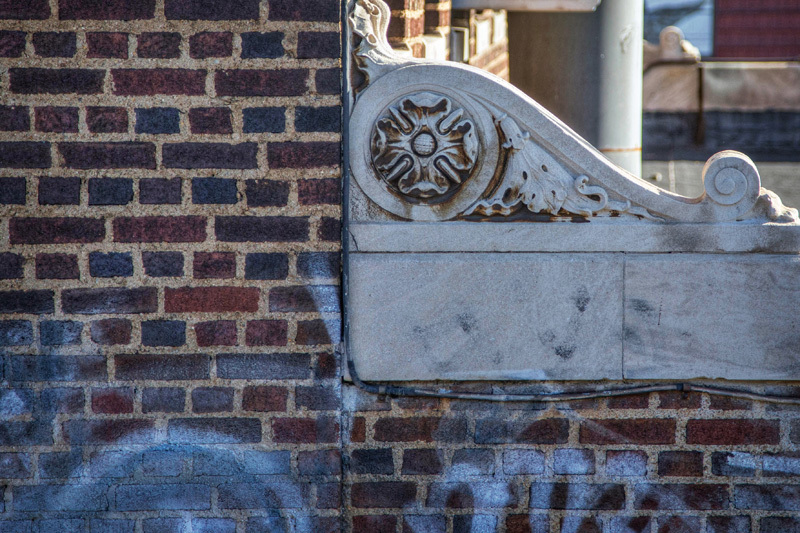 Mr. Hein, I think you miss the point, we’re supposed to be preserving history, not demolishing it. 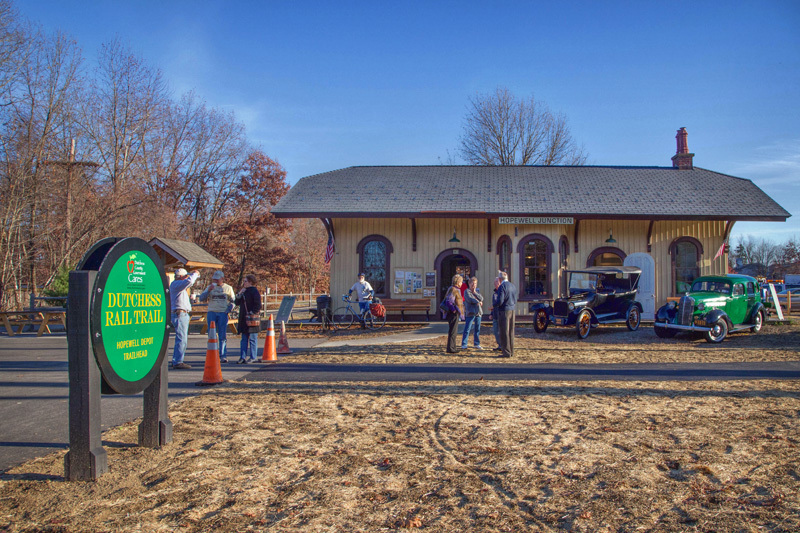 Advocates for rail trails seek to shut down the Catskill Mountain Railroad and the Adirondack Scenic Railroad (pictured above) and turn them into trails. 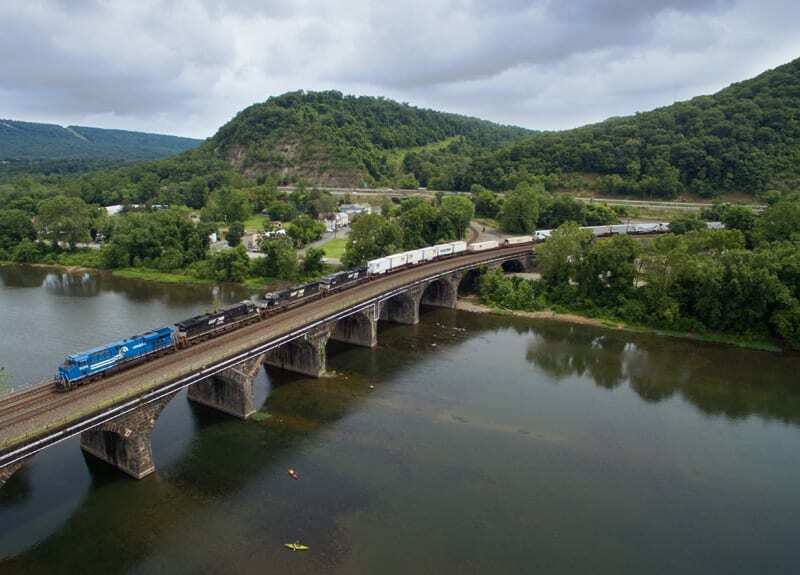 Hein has promoted tourism to Ulster County (conveniently, the agency engaged in this promotion is a financial donor to Mr. Hein), yet seeks to take down a railroad that does in fact attract tourists, all of which is run by volunteers with no cost to the county. Rail trails are certainly in vogue these days and popping up everywhere – so why would any tourists travel to Ulster just for a trail, when they could visit one closer to home? 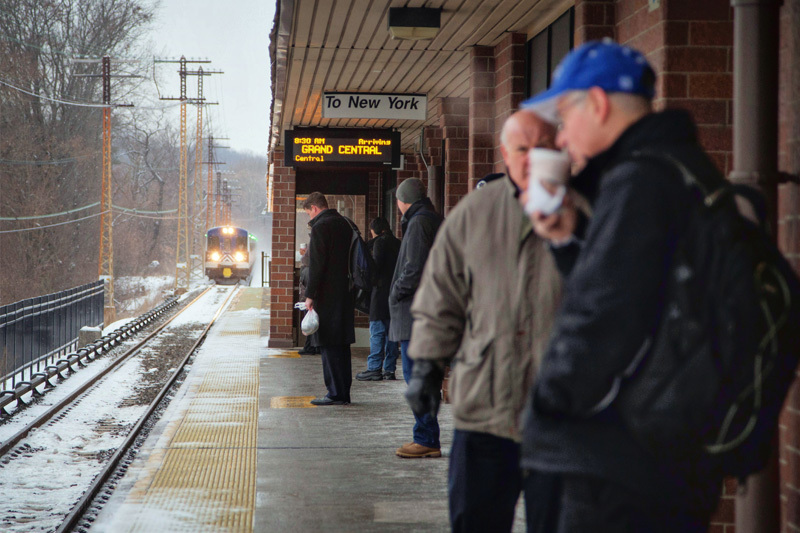 An economic impact analysis of the rail trail plan, with grossly inflated numbers, compares the proposed trail with the Walkway over the Hudson. No offense, Mr. Hein, but that is apples to oranges – the Walkway is a unique creation, and undoubtedly draws tourists for that exhilarating experience of walking across the mighty Hudson. 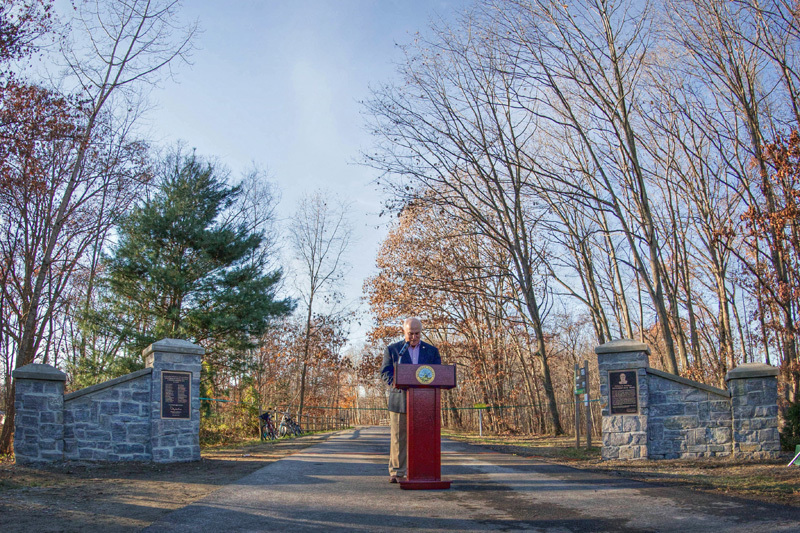 A trail in the Catskills wouldn’t attract anywhere close to the visitors that the Walkway receives. If any of you out there like the Dutchess or other rail trails, and you support the actual preservation of history, go lend a hand to the Catskill Mountain Railroad, which desperately needs financial support. 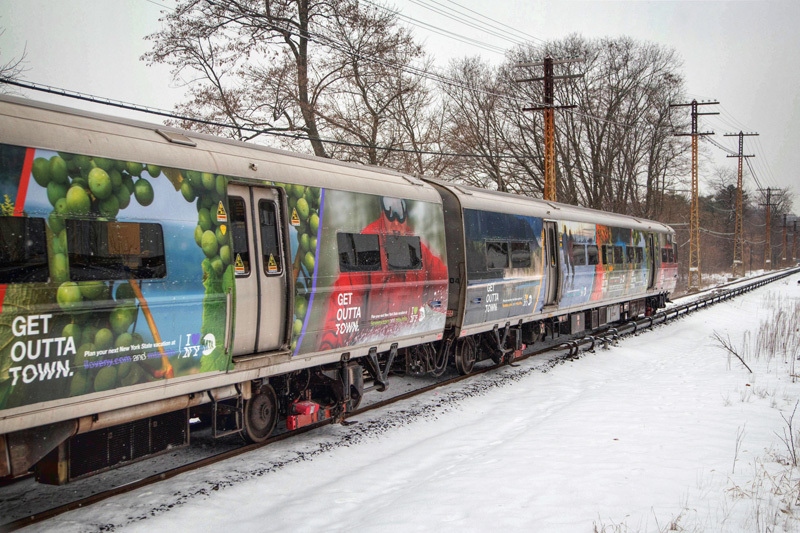 They support rails WITH trails – a no brainer solution. 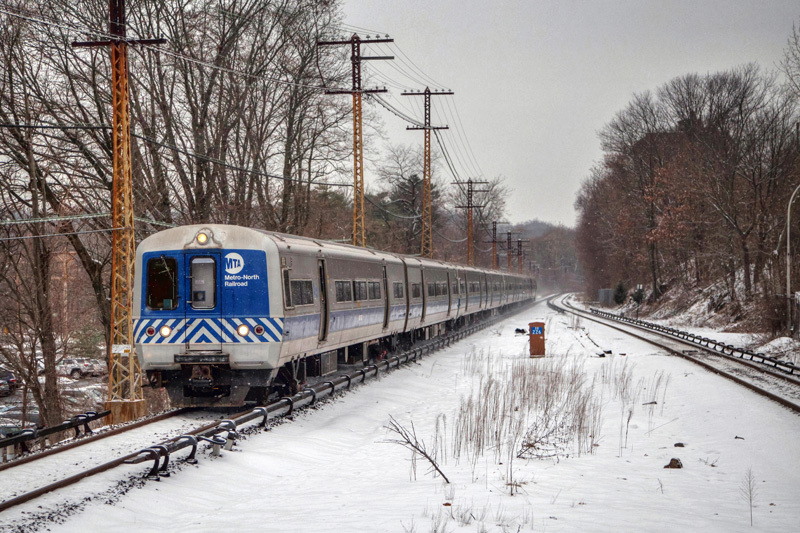 Why demolish an active rail line when the county could easily create a trail alongside it? 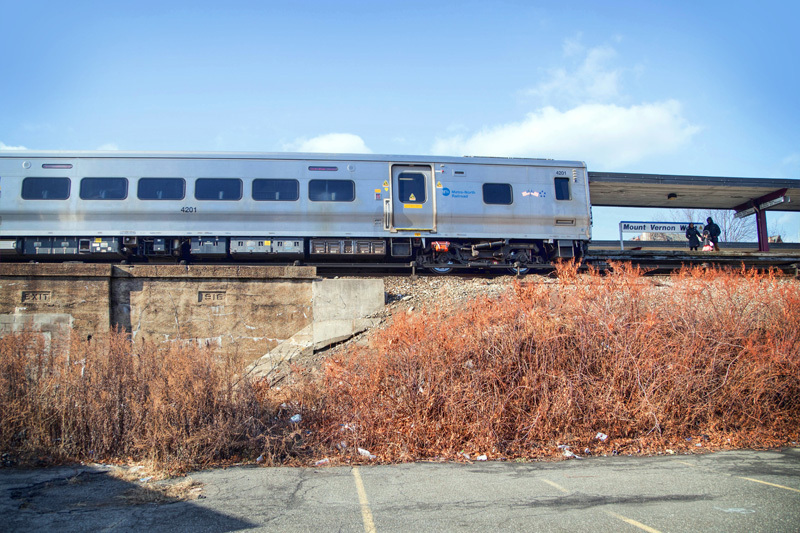 Because a rail with trail “decreases the usefulness” of a trail, will lead to safety issues for the railroad, and will increase costs? 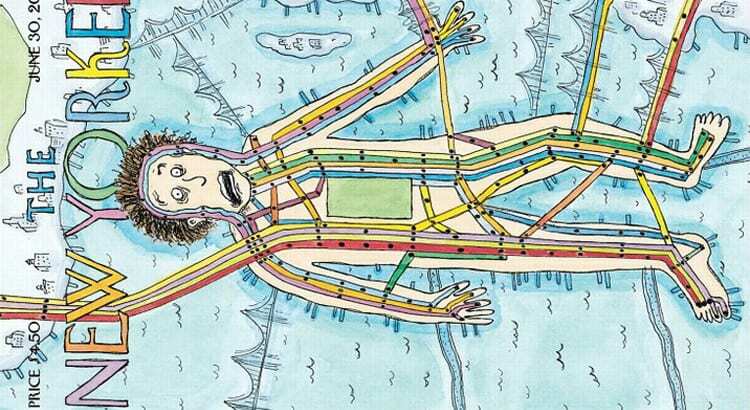 That is grasping at straws. 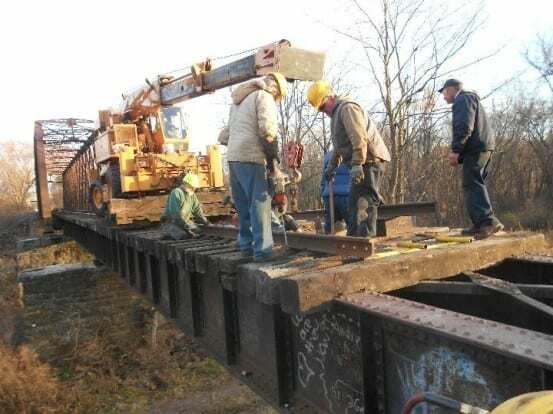 Why should anyone trust anything the county has to say in their report, especially when cited public estimations of fixing a bridge on the line were more than $850,000 dollars, yet the railroad repaired it with volunteers for under $30,000? As for safety, the Rails to Trails Conservancy’s 2000 study, as cited by the US Department of Transportation, found that Rails with Trails “are compatible with active railroads” and “are just as safe as other trails.” So really, why does Hein refuse to consider a rail and trail? 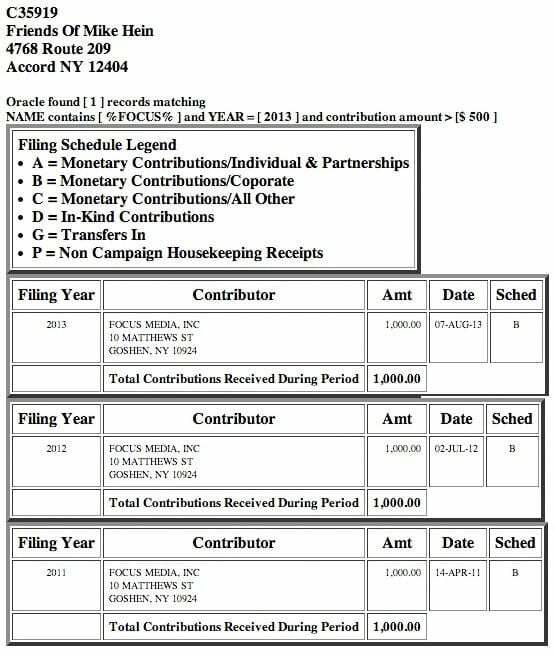 Is it an ego thing, or has another company or PAC that donates money to Mr. Hein yet again greased the wheels? 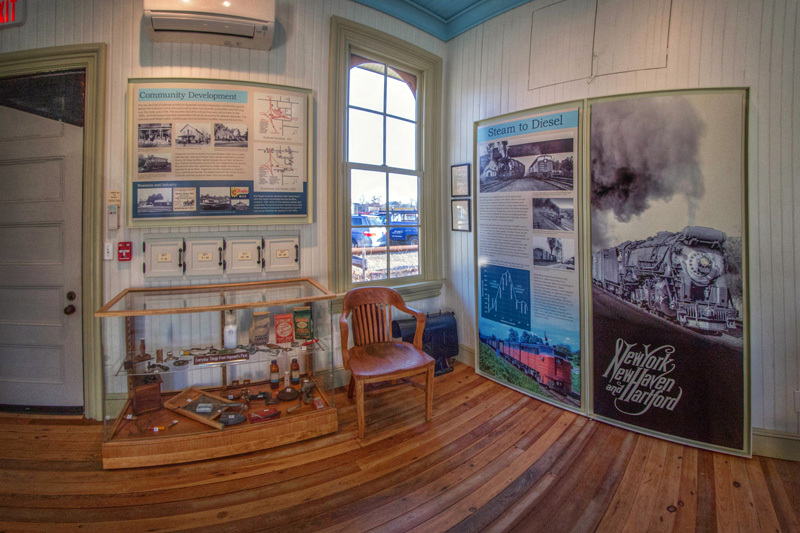 Hein & Friends like to depict the Catskill Mountain Railroad as a failure by showing photos of Hurricane Irene damage. 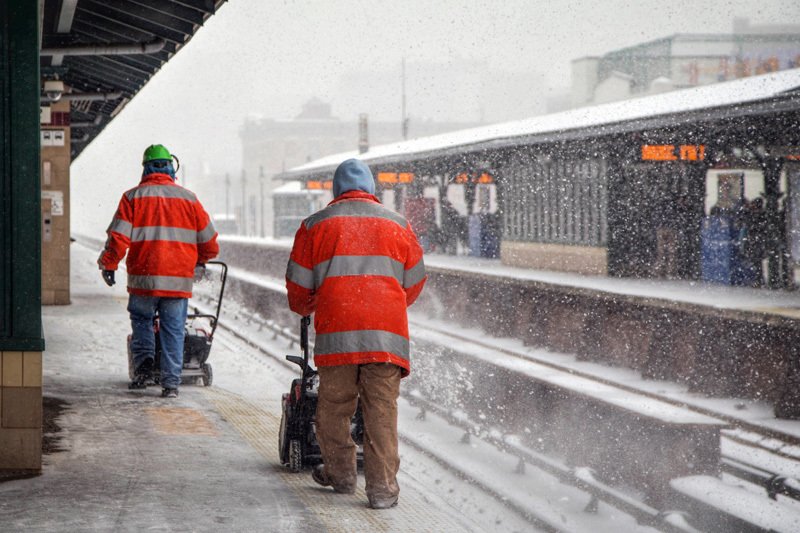 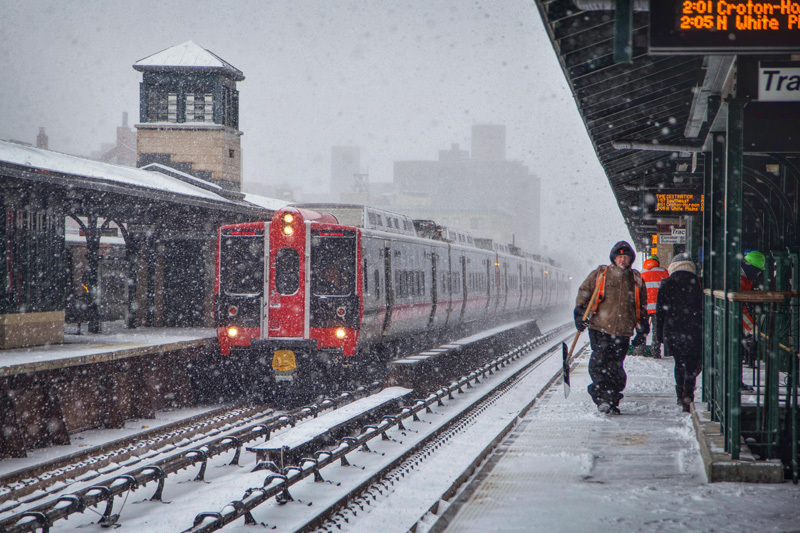 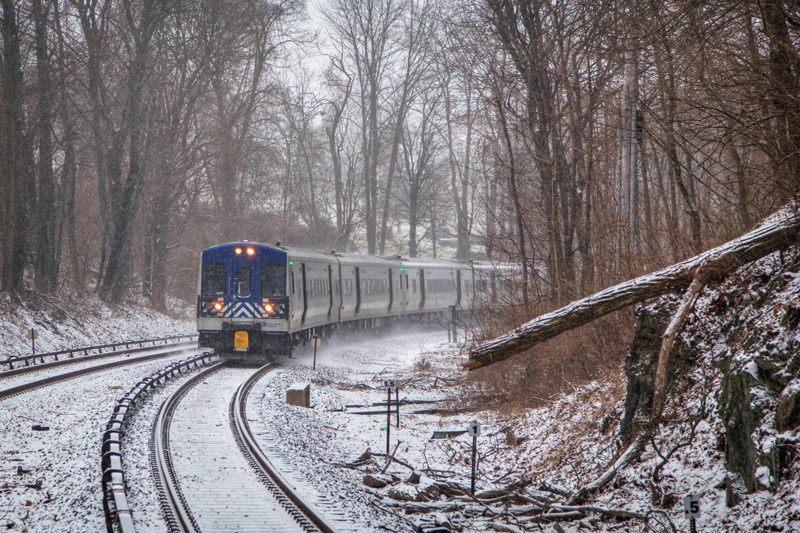 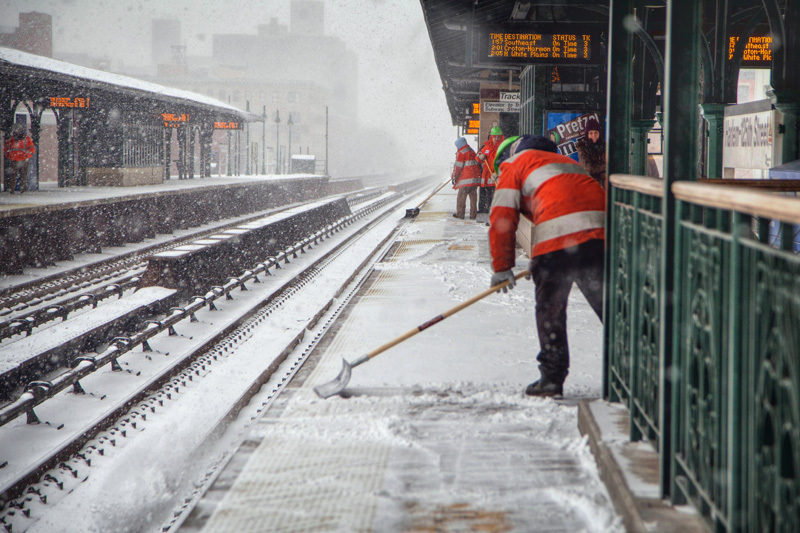 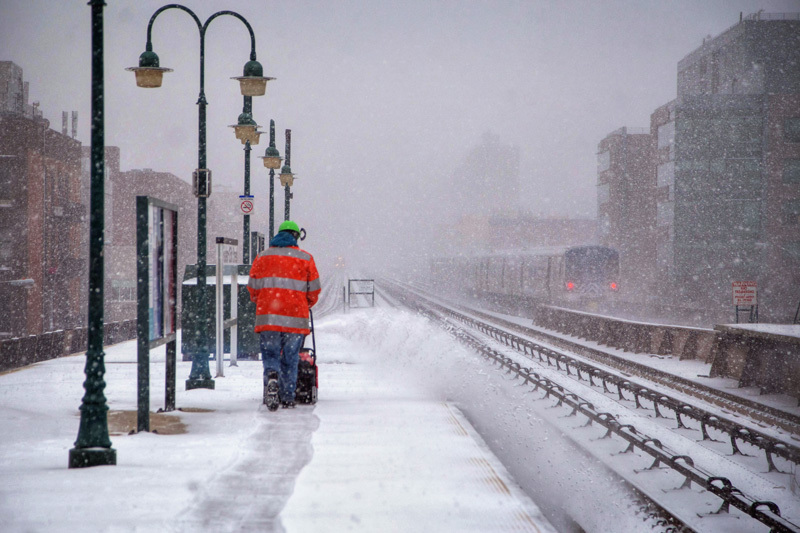 Even established railroads like Metro-North were heavily damaged by this storm. 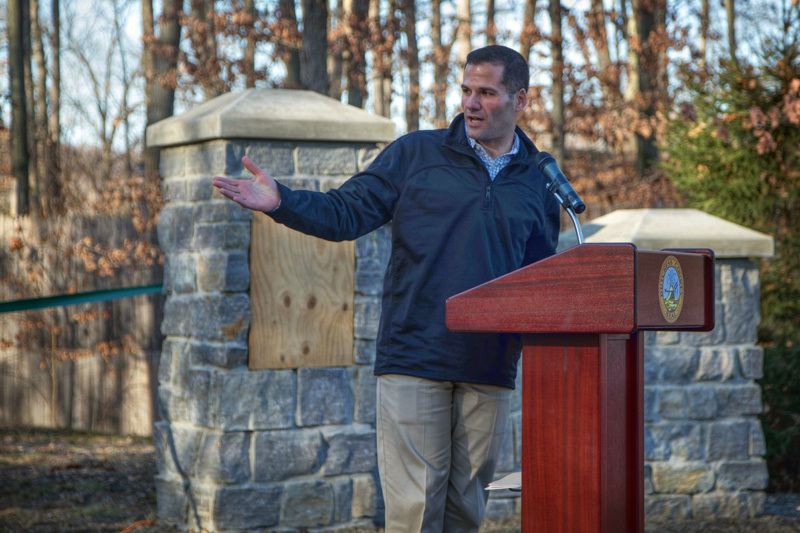 In reality, volunteers repaired the storm damage and more without the FEMA funding earmarked for it, as Mike Hein refuses to disburse it. 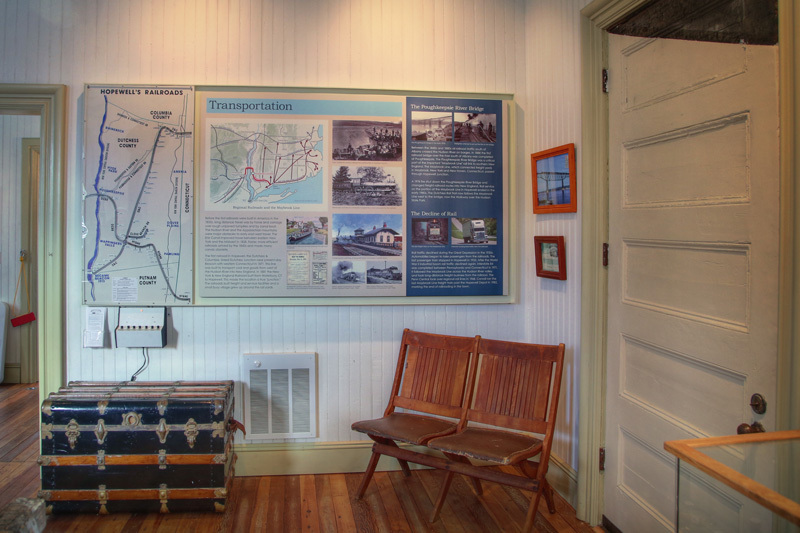 Support rails with trails, and preservation of our history. 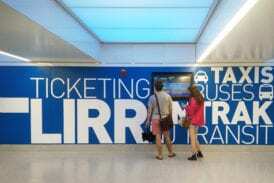 That would make a real world-class tourist attraction. 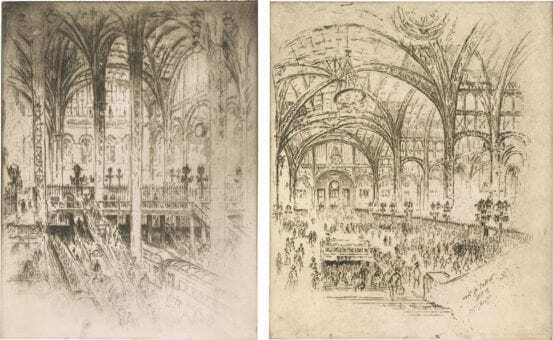 When the New York Central Railroad’s chief engineer William Wilgus came up with the concept of Grand Central Terminal, there were most likely a few people out there that felt he was completely nuts. 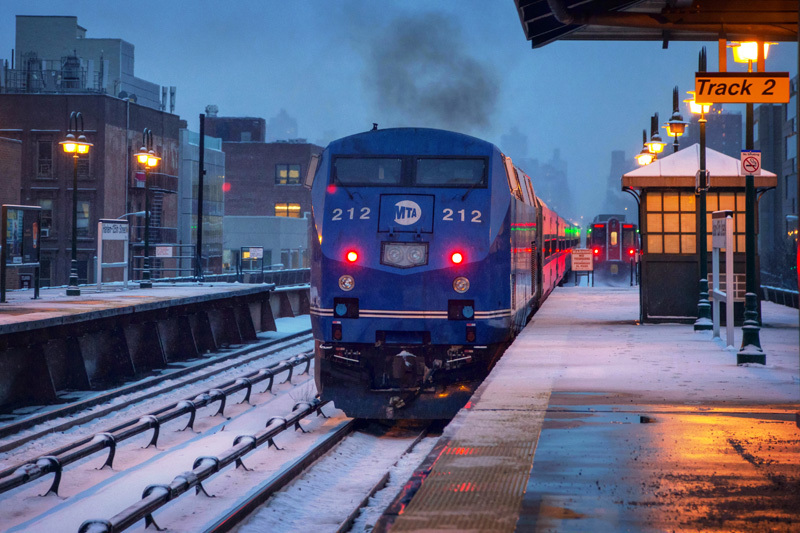 Despite the fact that at the time the NYC was one of the mightiest railroads in not only the United States, but the world, the price tag for the project was incredibly high. 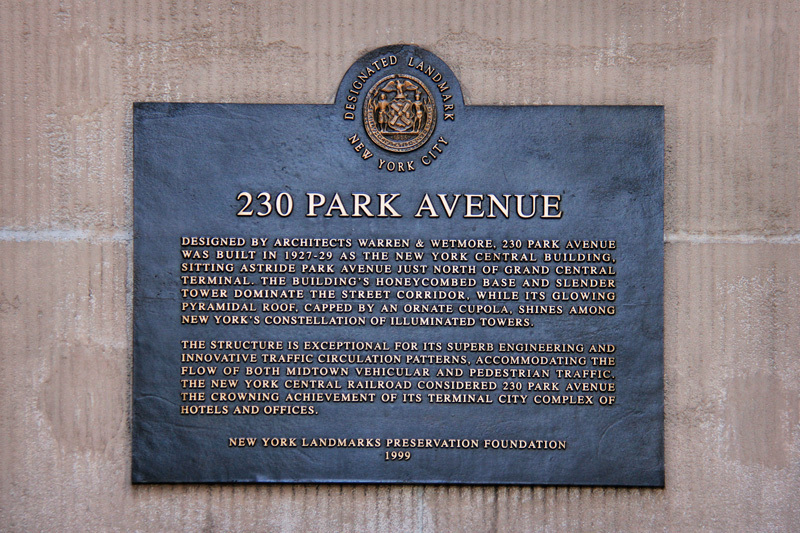 Without the concept of “air rights” it is likely that the project would never have moved forward. 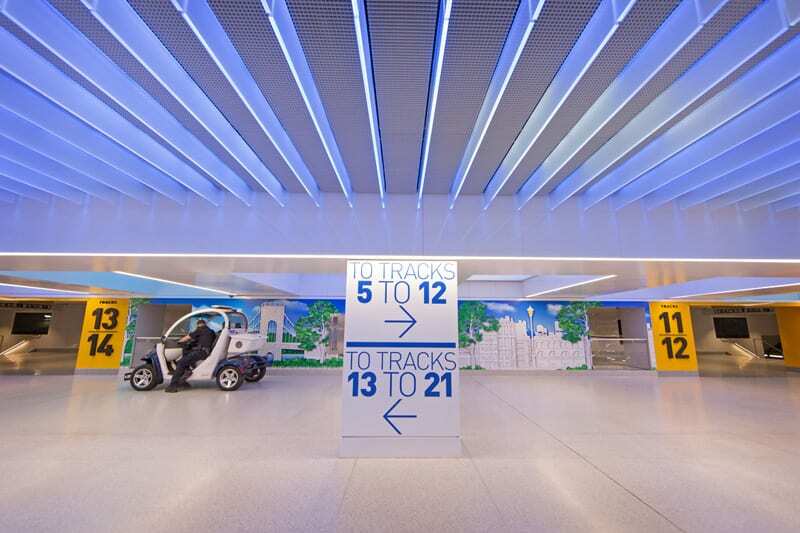 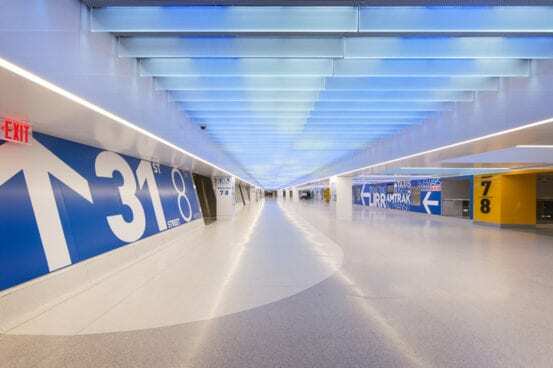 Covering the Terminal’s tracks and allowing buildings to be constructed in the “air” above turned out to be a very sound investment. 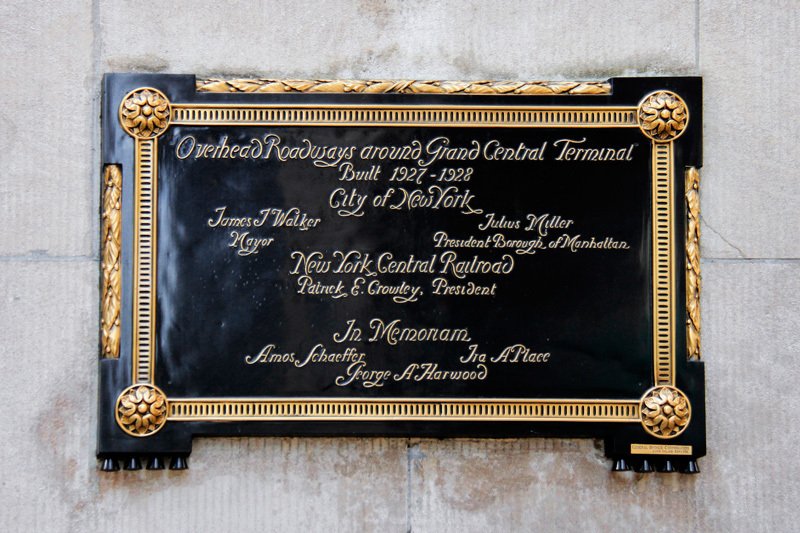 The railroad owned significant amounts of highly profitable, prime New York real estate, and the neighborhood surrounding Grand Central and built on that land became known as Terminal City. 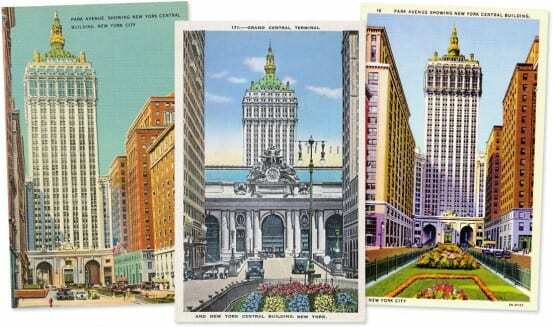 The Biltmore Hotel, Commodore Hotel, and the Yale Club were all parts of this city within a city. 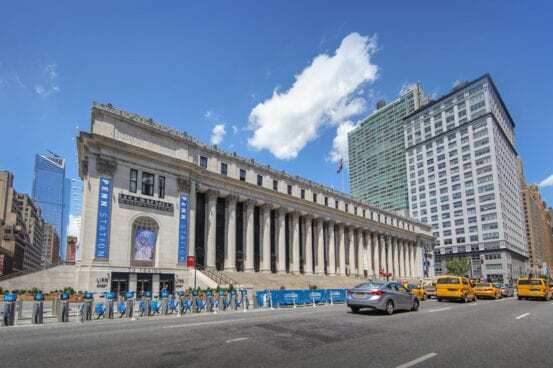 But it was the New York Central Building, finished in 1929, that was the crowning achievement of Terminal City, and an appropriate companion for Grand Central Terminal. One of the final buildings designed by Warren and Wetmore in New York City, the New York Central building became the new home of the railroad’s corporate offices. 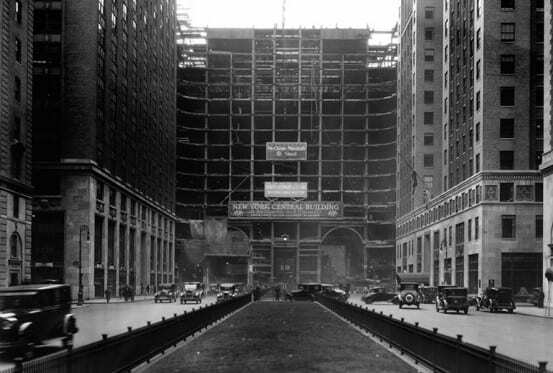 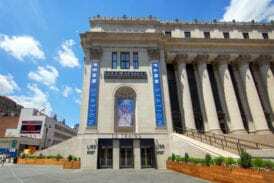 Although today we view the building as a Beaux Arts masterpiece, on par with Grand Central Terminal itself, when the building was completed in 1929 it was generally looked down upon by the architecture world. As American architecture had moved beyond the Beaux Arts style about ten years prior, critics felt the building was almost like a step backwards. 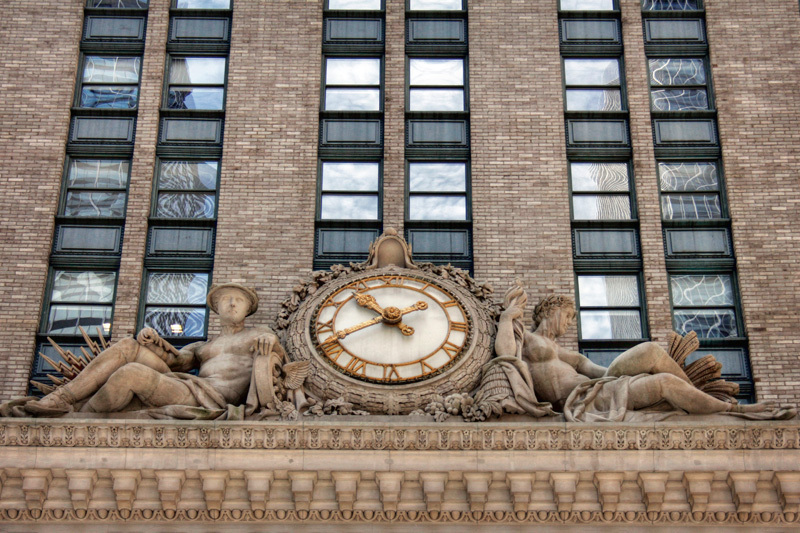 Viewed as a whole, however, the New York Central building fits perfectly with its companion, Grand Central Terminal. 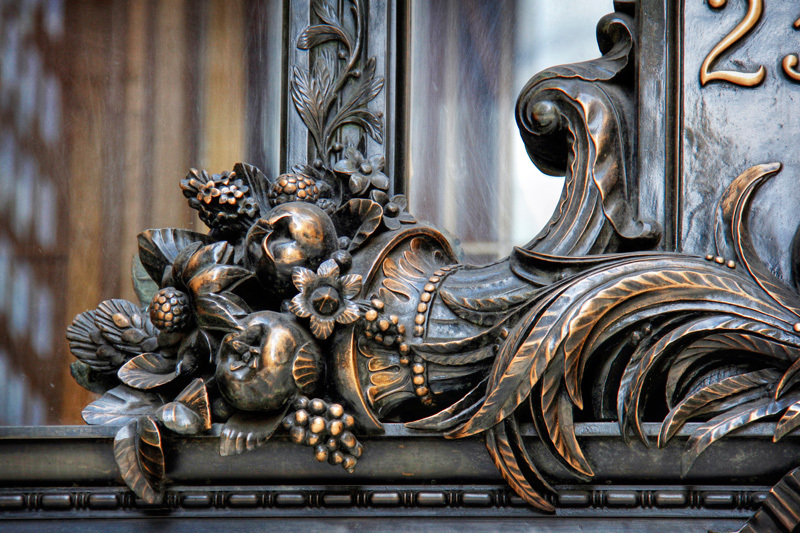 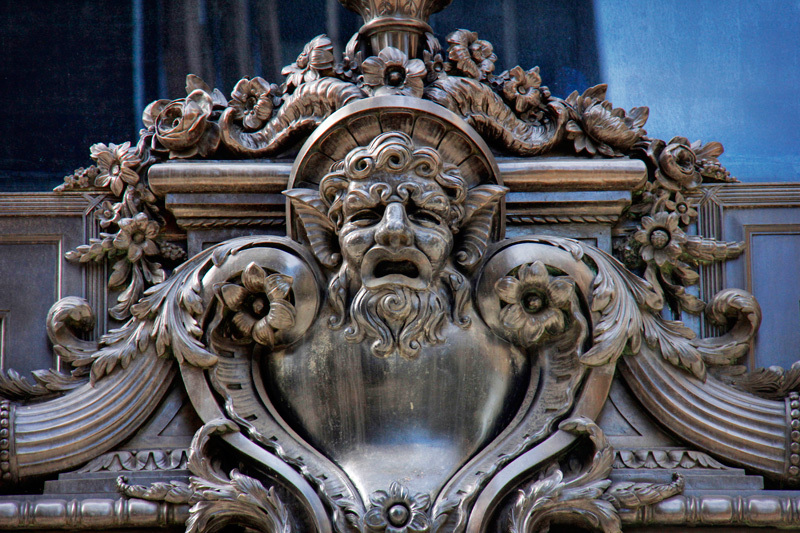 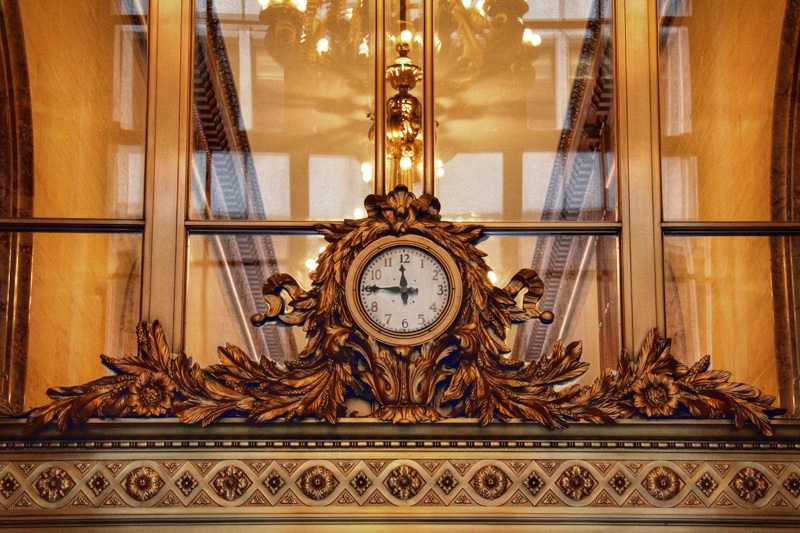 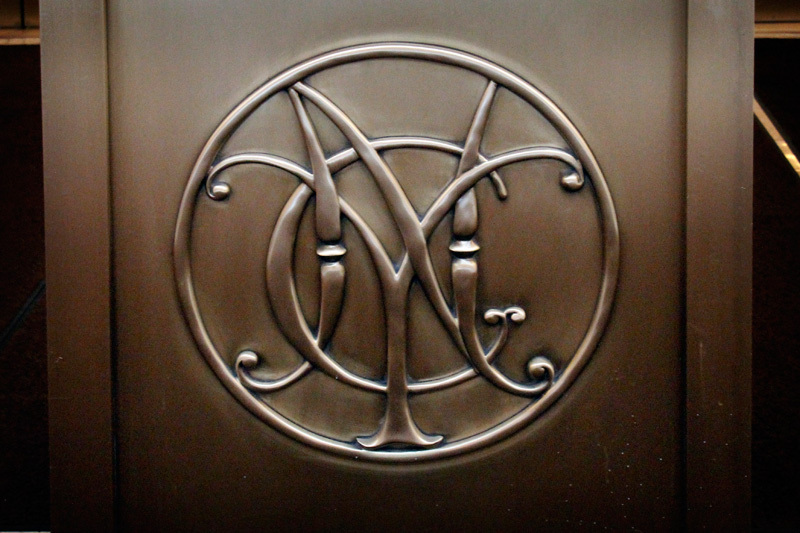 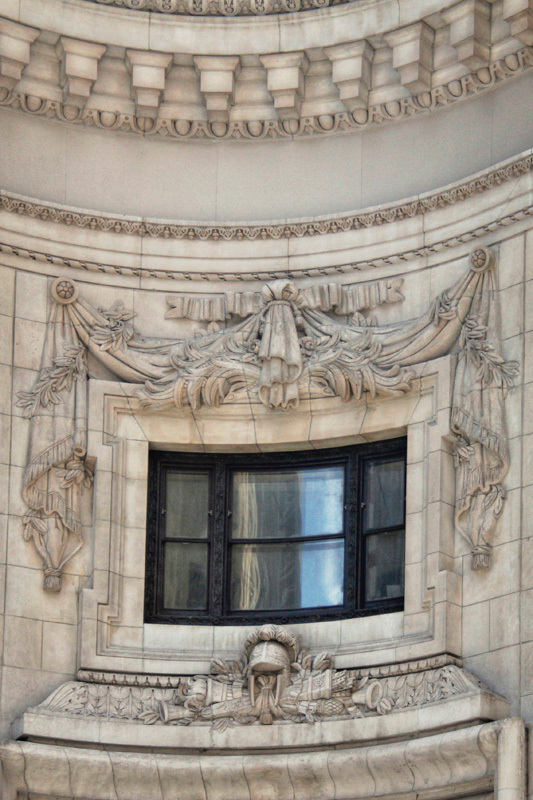 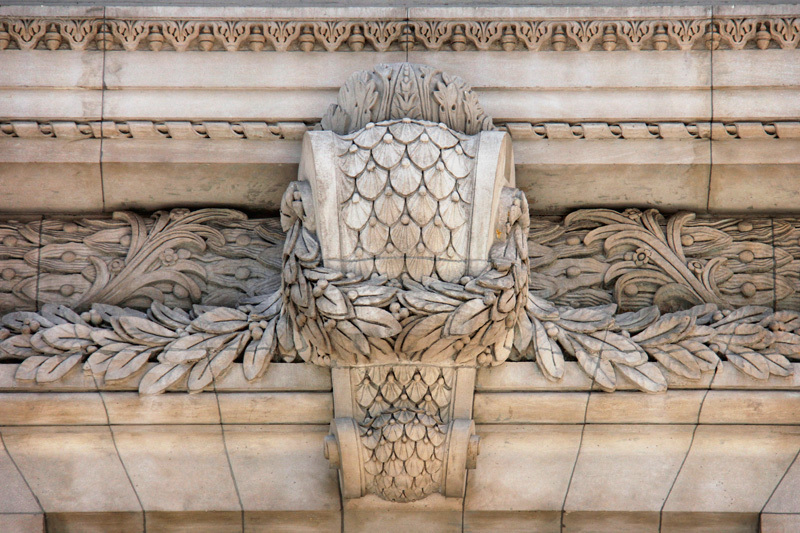 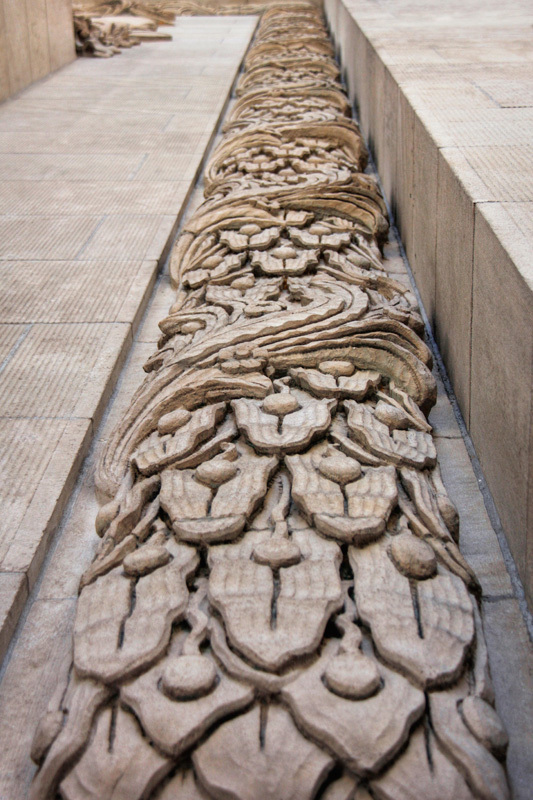 Some of the most wonderful parts of the New York Central building are the details and sculptural elements you’ll find all over, a major component of the Beaux Arts style. 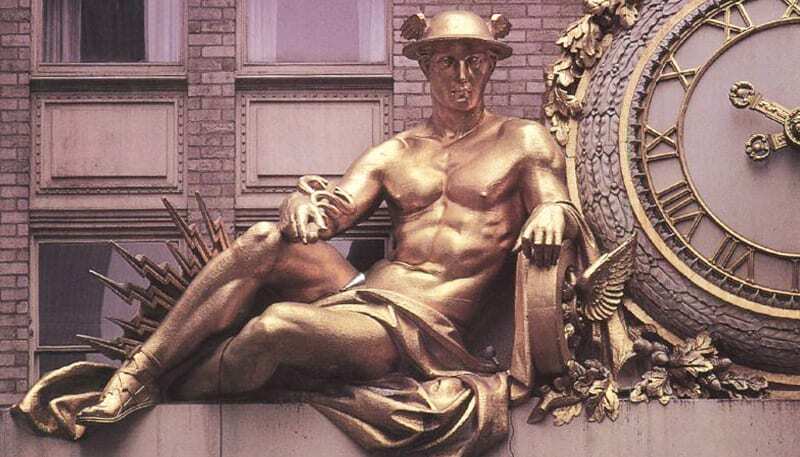 These elements were sculpted by Edward McCartan, Director of the sculpture department of the Beaux-Arts Institute of Design in New York City. 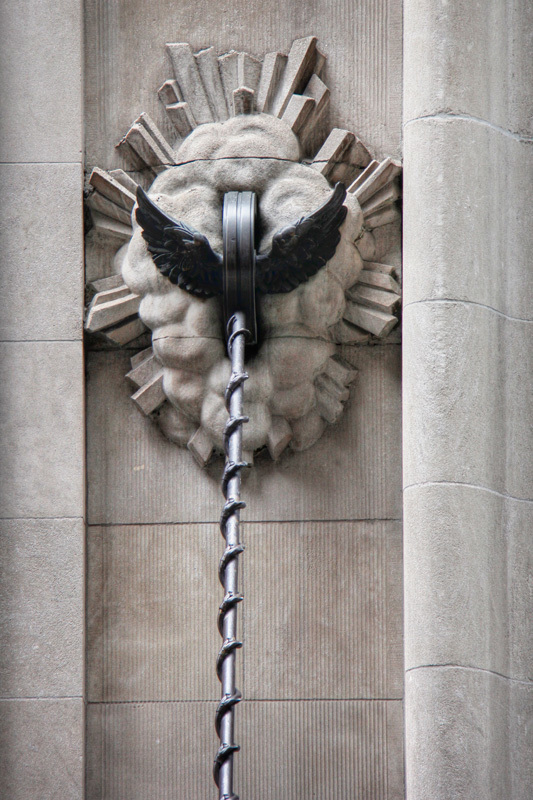 While Warren and Wetmore frequently used the work of Sylvain Salieres, including for Grand Central Terminal, by the time the New York Central building was to be constructed, Salieres was no longer alive. 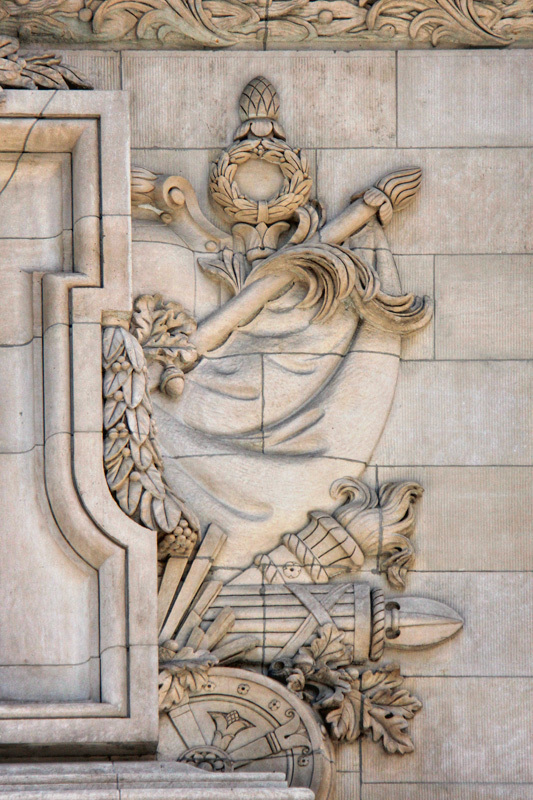 The building’s primary sculptural element is the clock that sits atop the front façade, featuring Mercury at left, and the goddess Ceres at right. 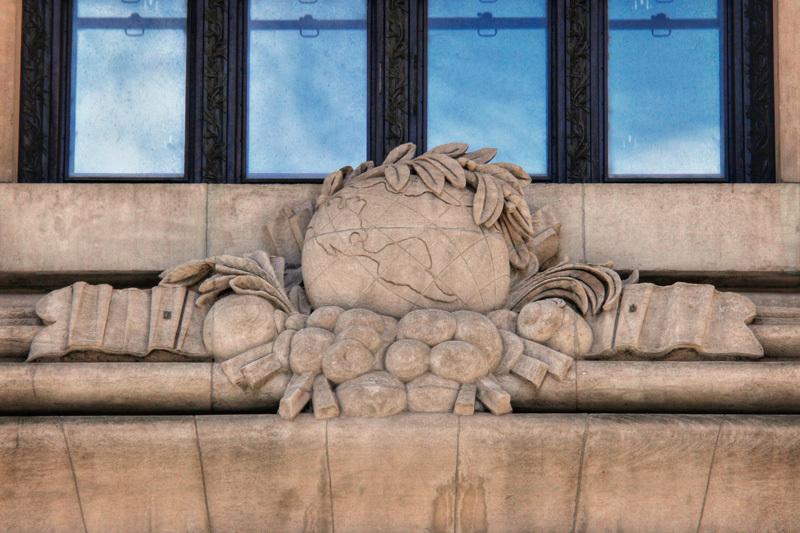 Mercury is the typical deity used to represent transportation, while Ceres represents agriculture – one of many types of freight carried by the railroad. 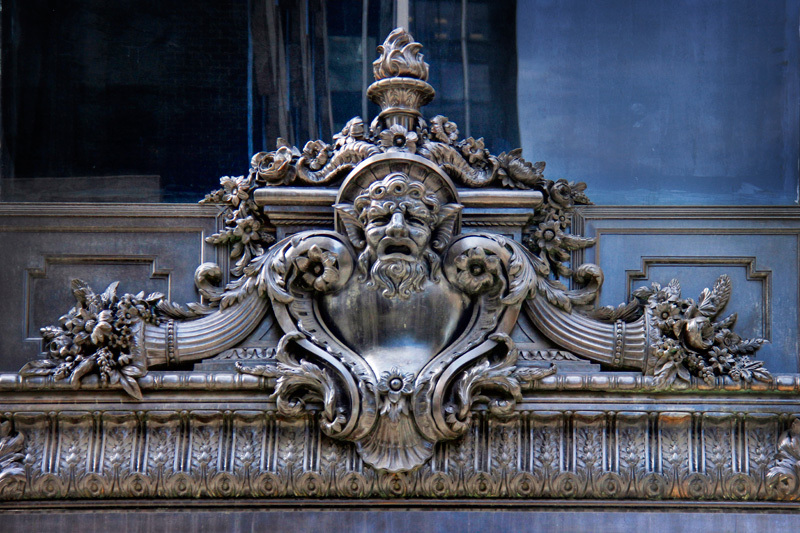 Found in various locations around the building are several other faces, whose identities never seem to be discussed. 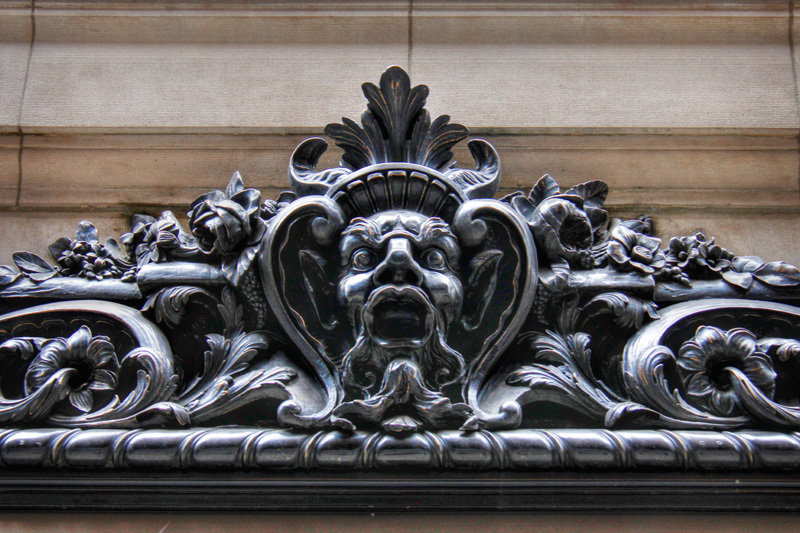 One of these faces is contorted into a painful grimace, and placed in front of a fiery torch. Perhaps this figure is representative of Prometheus of Greek myth – the titan who gave fire to man, who was punished by Zeus for the act. 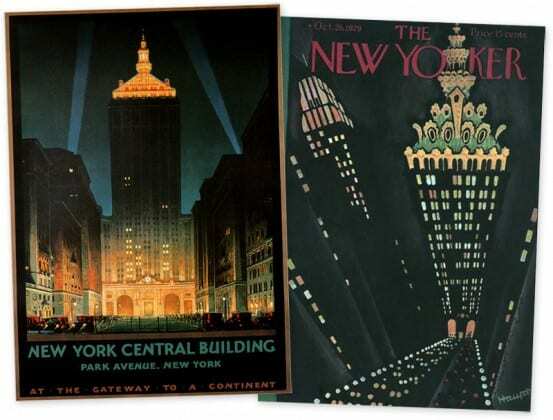 Poster of the New York Central Building by Chesley Bonestell, and cover of the October 26, 1929 edition of the New Yorker with illustration by Theodore G. Haupt. 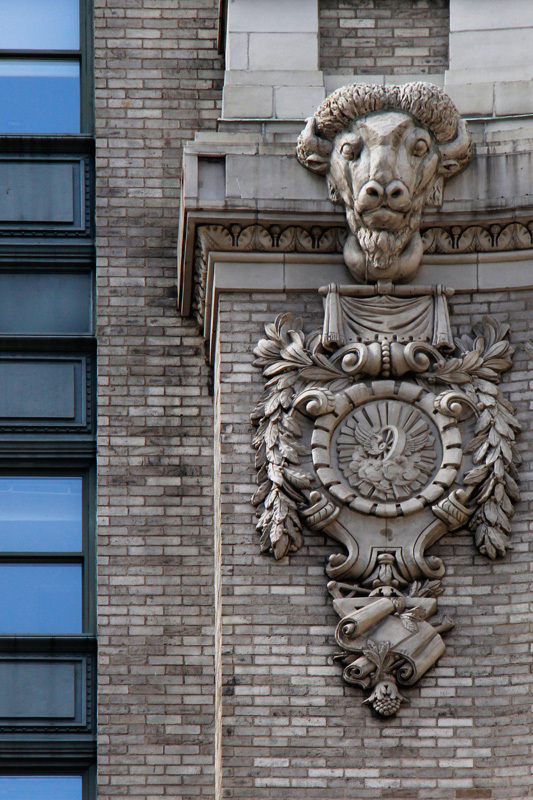 High above street level are the faces of American Bison, situated above stylized compasses, representative of how the railroads essentially built this country – or at least how it contributed to the migration of people to the west. 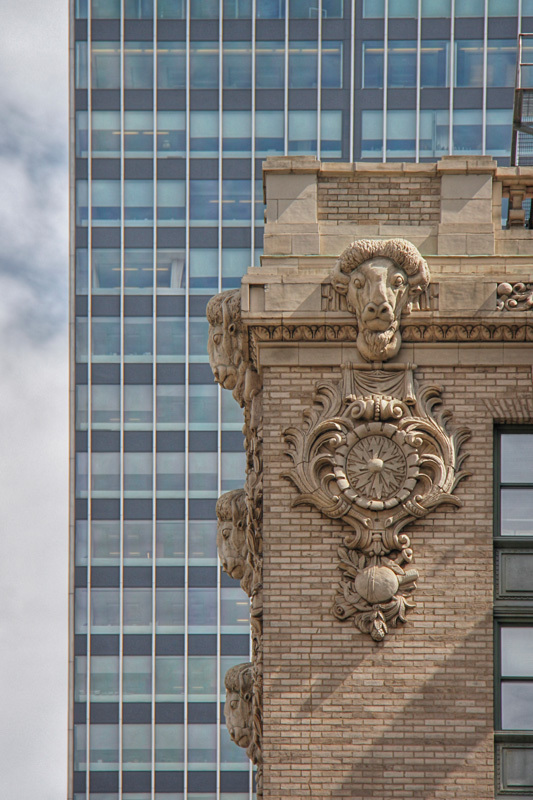 Sharing a similar concept, a face resembling the Greek god of nature and the wild, Pan, appears towards the very top of the building. 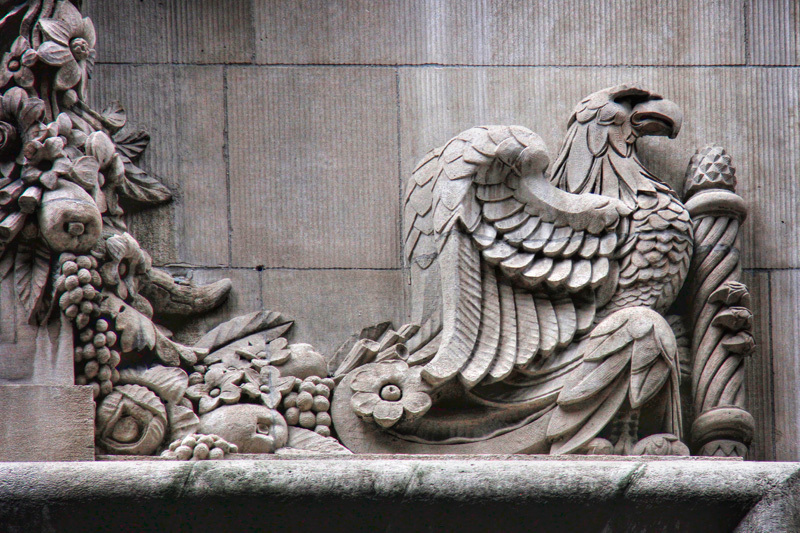 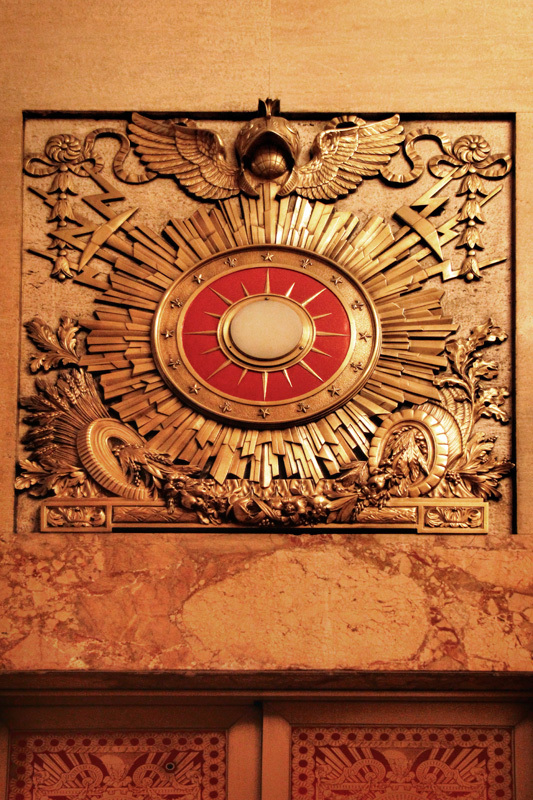 Eagles, representative of the United States, can be found above some of the doors to the building, and lions, a symbol of power can be found in the tunnel that carries Park Avenue through the building. 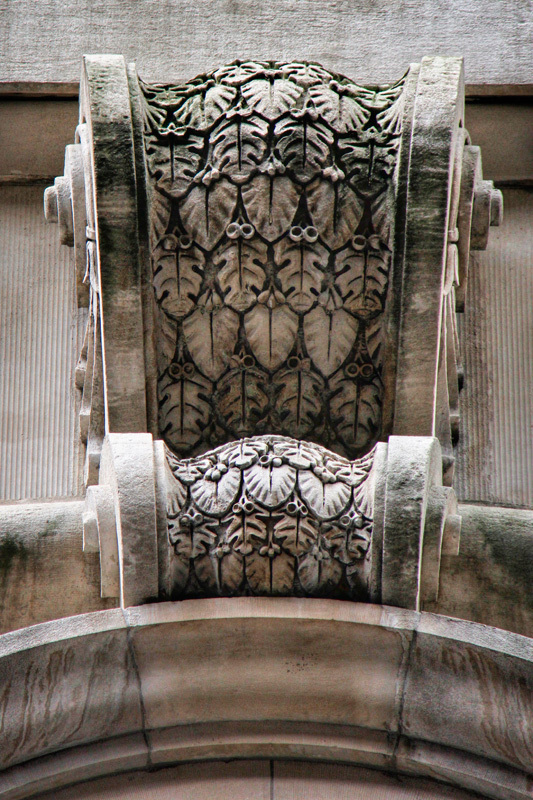 Purely decorative columns, much derided by the architects of the day, can also be found on the upper reaches of the tower. 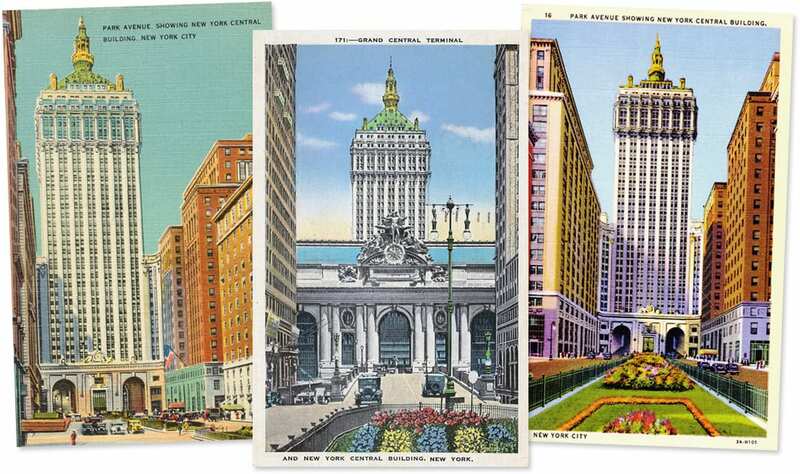 As the New York Central’s financial woes grew after World War II, the railroad began selling off some of its New York real estate. 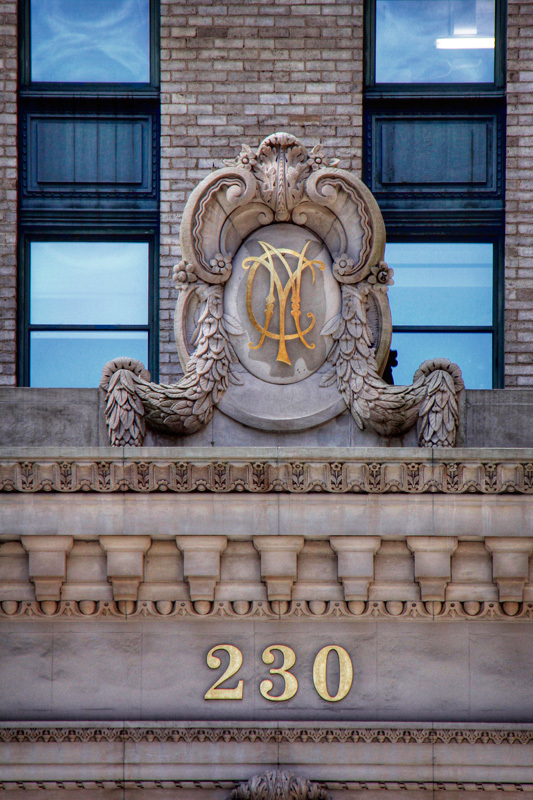 After being sold in the 1950’s, the New York Central Building became the New York General Building – a crafty idea that required only minimal changing of the signage. 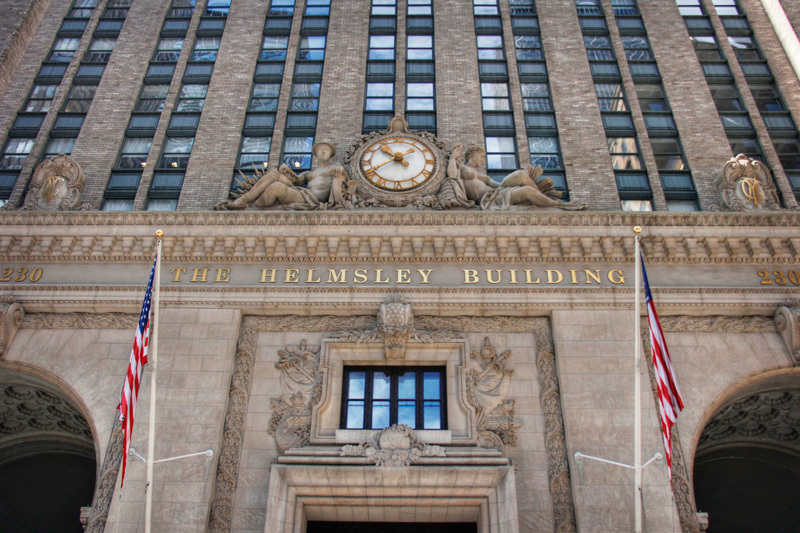 Eventually, the building was purchased by Helmsley-Spear, and it is rumored that Harry Helmsley’s wife Leona was the one who formally changed the building’s name to the Helmsley Building. 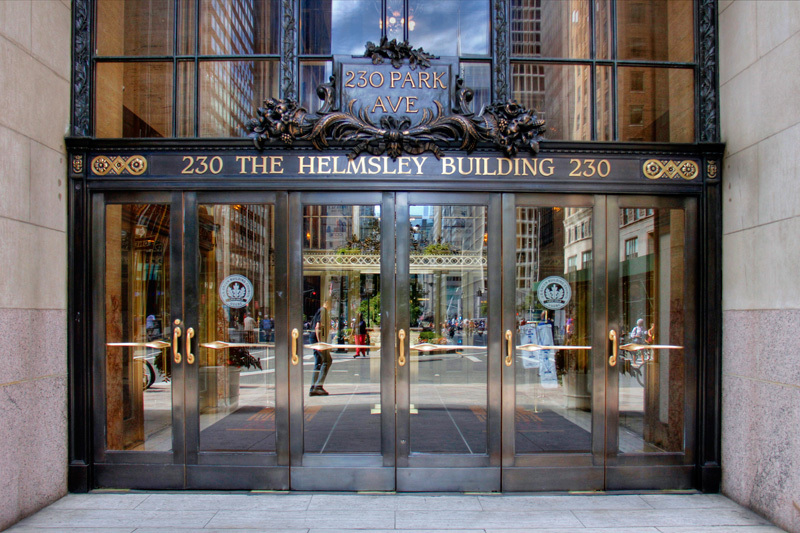 Perhaps the biggest travesty of the Helmsleys, besides all the tax evasion and treating their employees like dirt, was their grand idea to “update” the façade of the building. 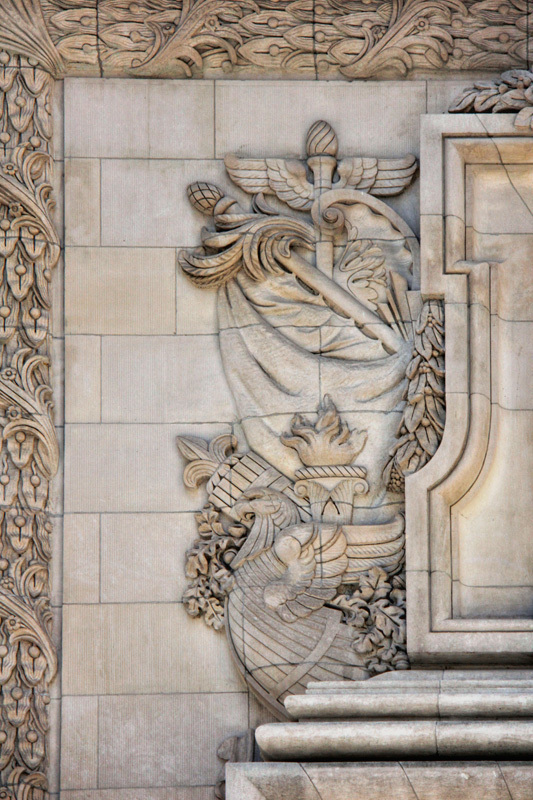 All of the architectural details on the building, including the sculptures of Mercury and Ceres, were coated with a layer of gold paint. 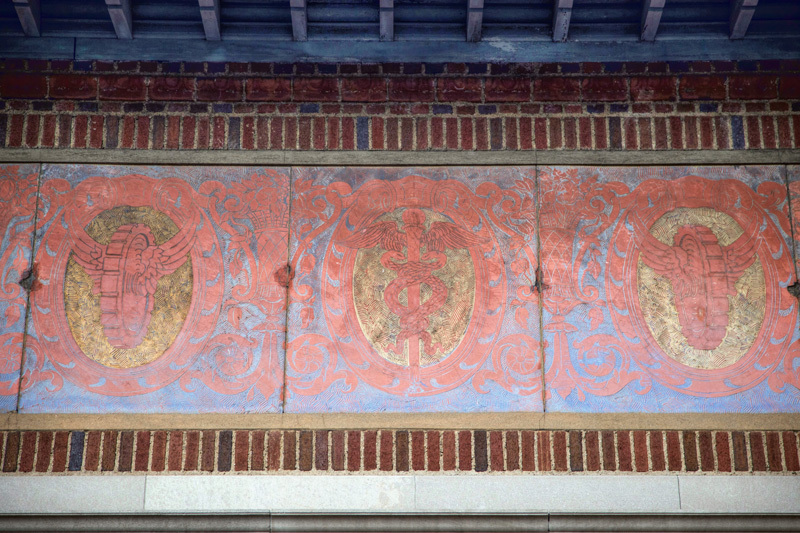 Thankfully, during the building’s 2002 restoration, these elements were restored to their original state, without the paint. 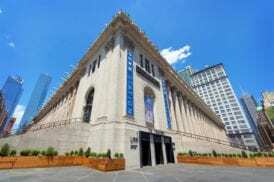 The building was sold in 1998, about a year after Harry Helmsley’s death, though it is said that Leona required a stipulation along with the sale – that the building would not be renamed. 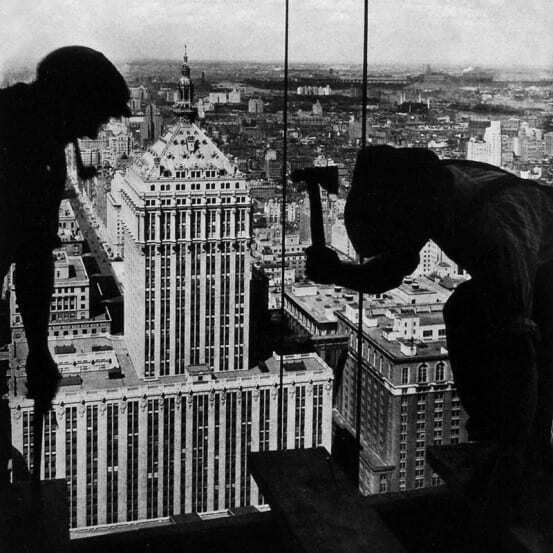 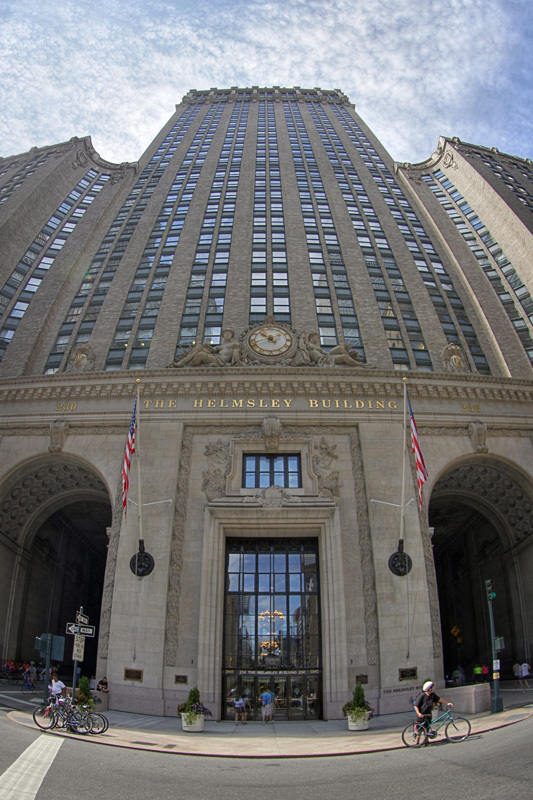 It is likely for this reason why the outside of the building still reads the Helmsley Building, while the property owners refer to it by the generic name 230 Park. 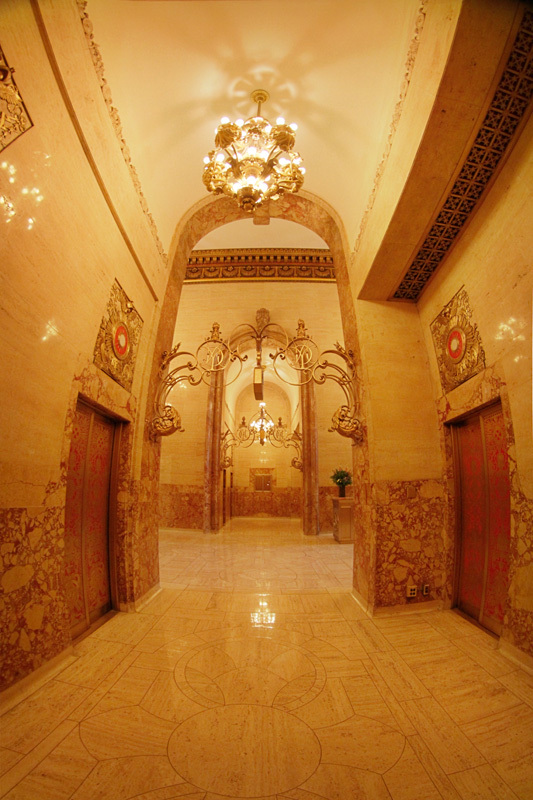 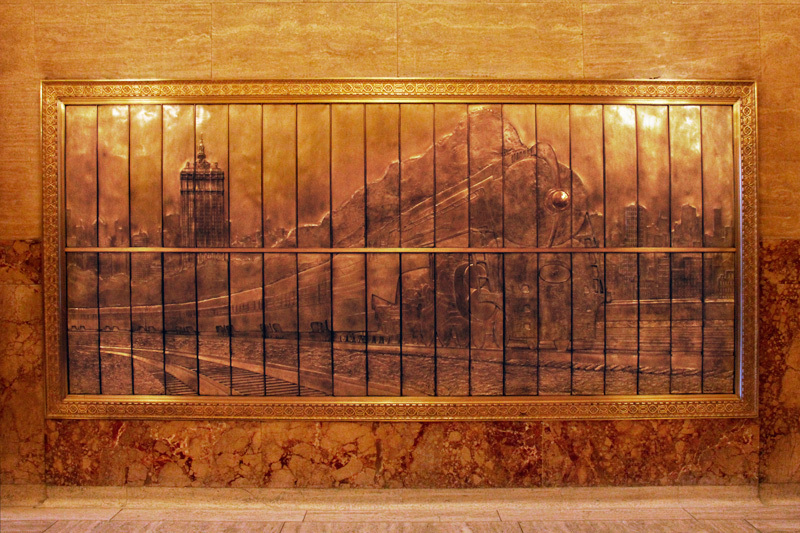 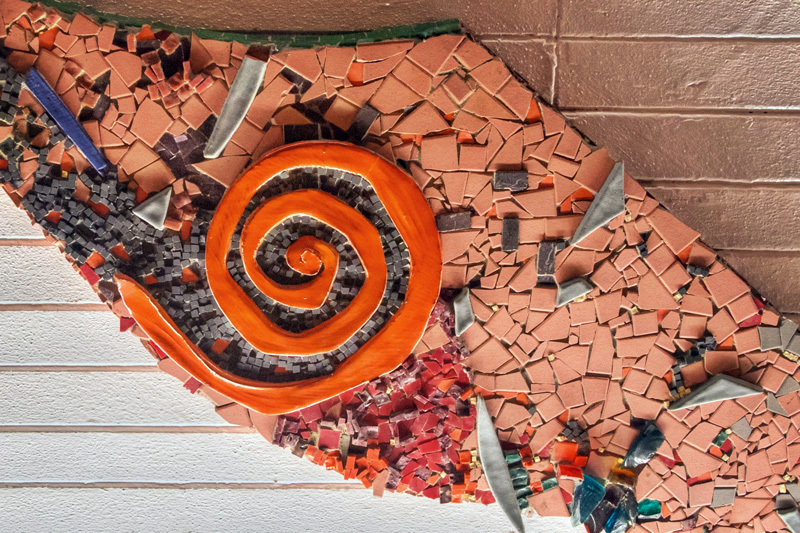 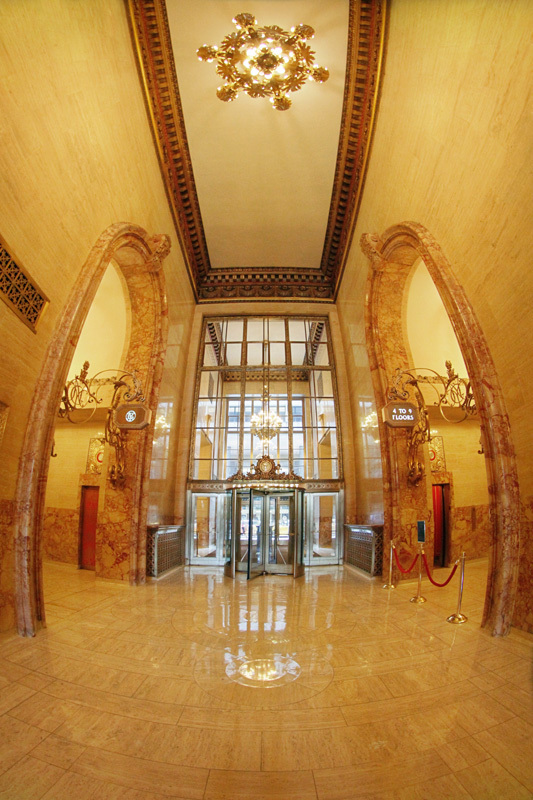 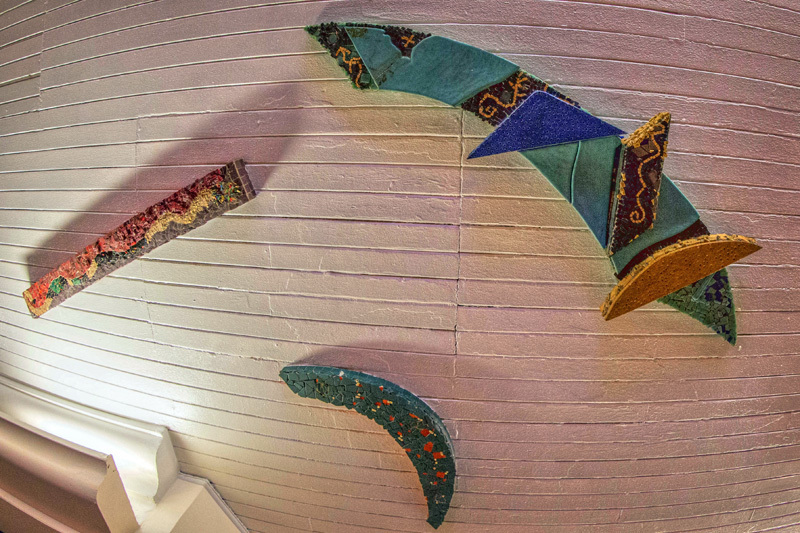 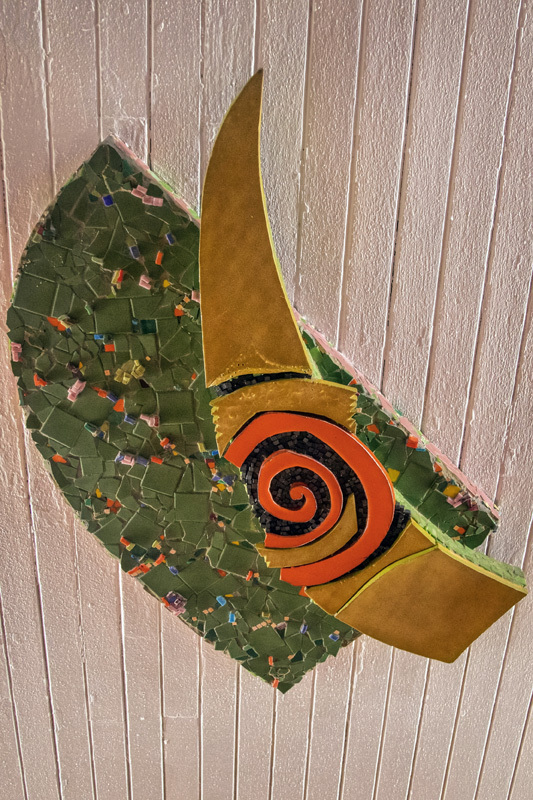 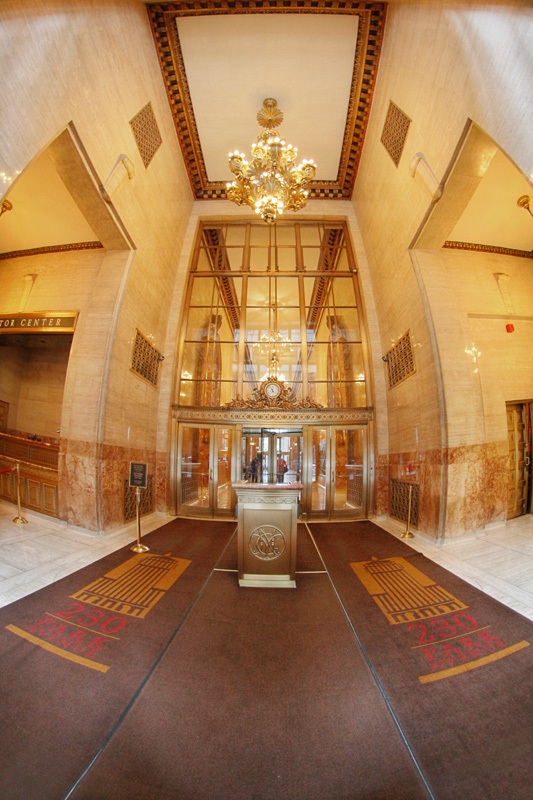 The current owners have made several modifications of their own to the building – two bronze murals – weighing over a ton and comprised of 40 individual panels – depicting the streamlined 20th Century Limited have been installed in the building’s lobby in 2010. Though attractive, it would have been nicer if a more time appropriate scene was selected – the building predates the streamlined locomotive by about ten years. 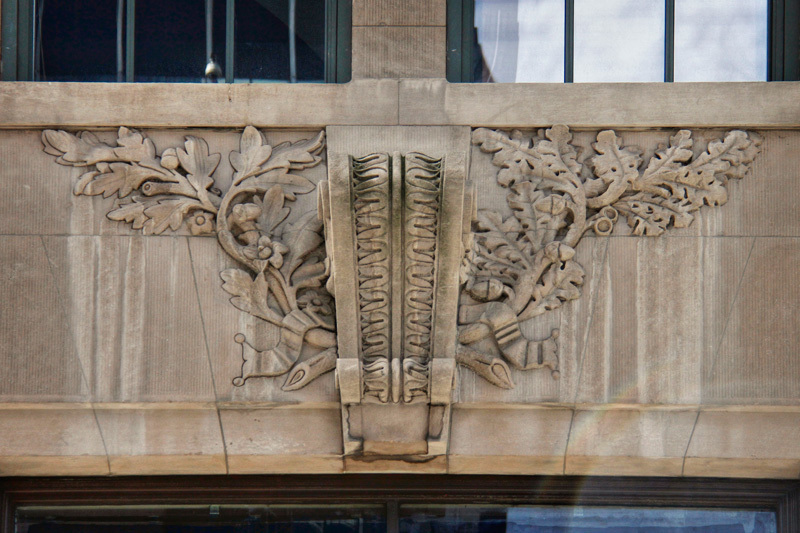 Bringing the building into the “modern age,” the current owners also hired lighting designer Al Borden, who came up with a night time lighting scheme for the building. 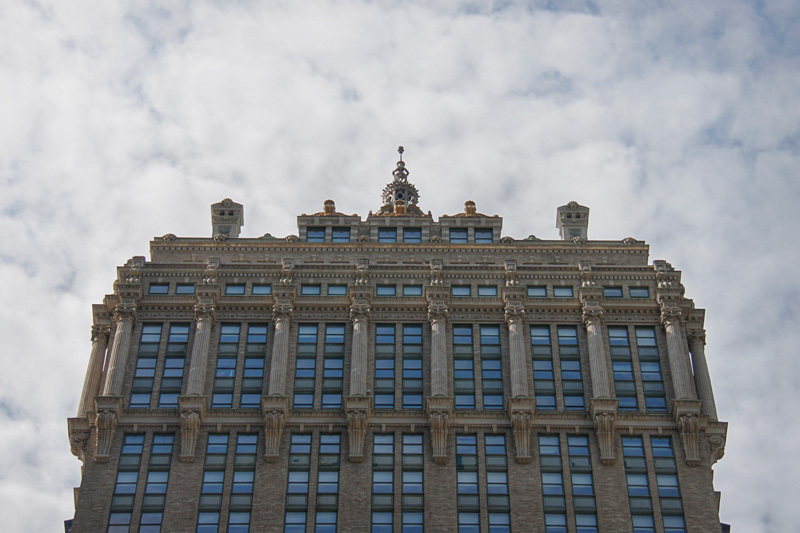 As the building is designated as a landmark, none of the lighting was permitted to “compromise the building’s architectural integrity.” Thus all light sources had to remain hidden, and none could be drilled into the building’s surface. 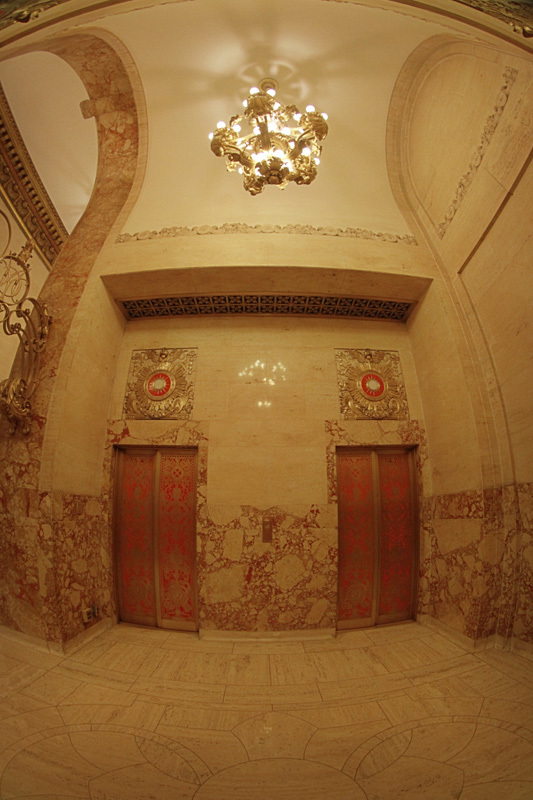 Over 700 individual lights were added to the building, and similar to the Empire State Building, the colors can change reflecting holidays and other events. 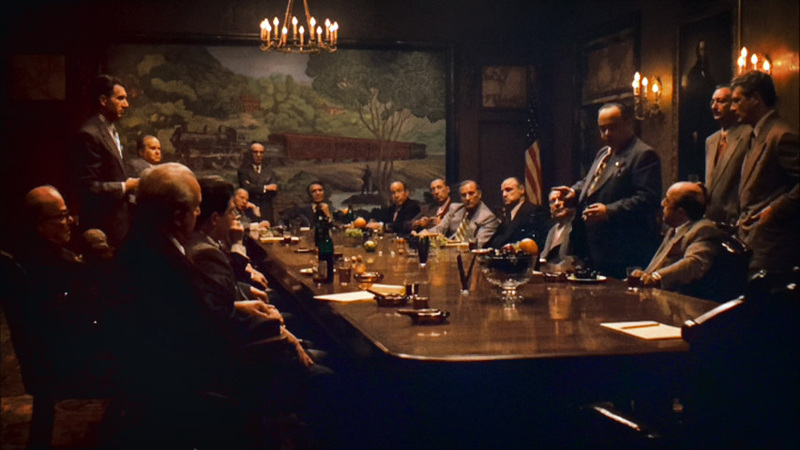 A scene from the movie The Godfather was filmed in the former New York Central building. 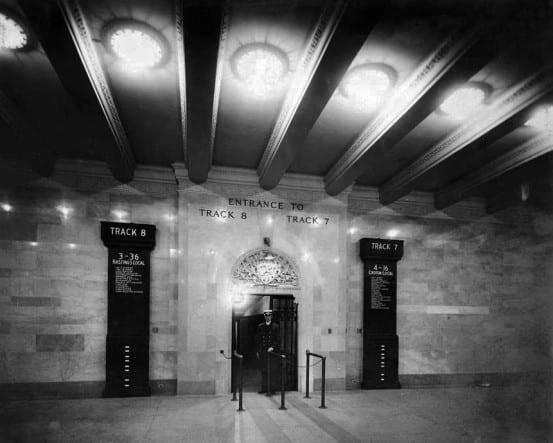 Note the portrait of William Henry Vanderbilt, and the old style #999 Empire State Express. When constructed, the New York Central Building was one of the primary features of the New York skyline. It may not have been the tallest building, but it was certainly one of the more unique. 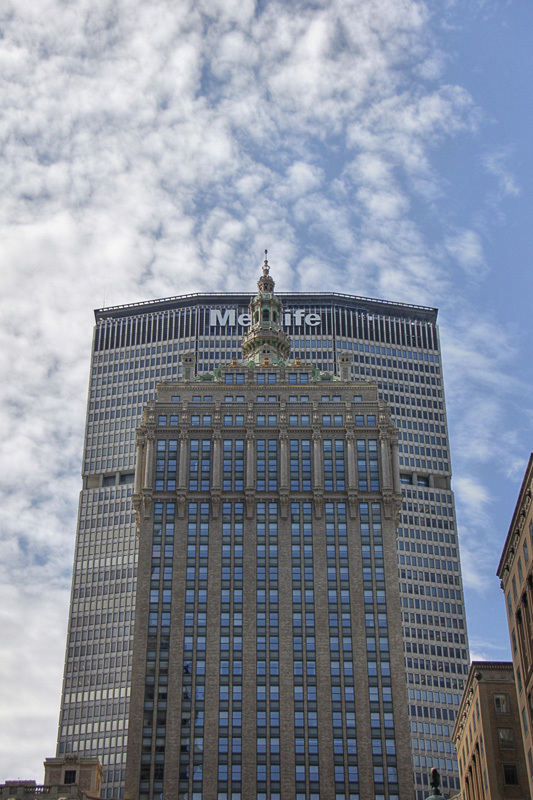 It remained as such until the late 1950’s when it was dwarfed by the massive Pan Am Building, now known as the MetLife Building. 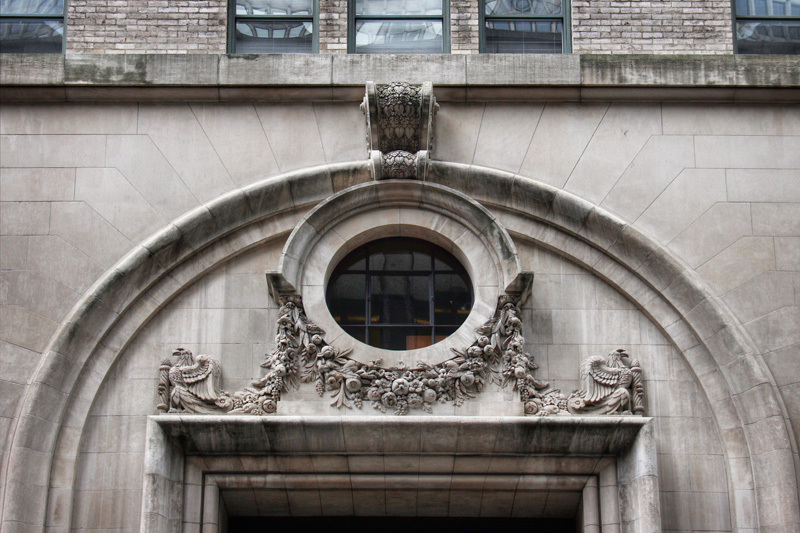 Despite that, the building is still a symbol of New York, and has appeared numerous times in popular media. 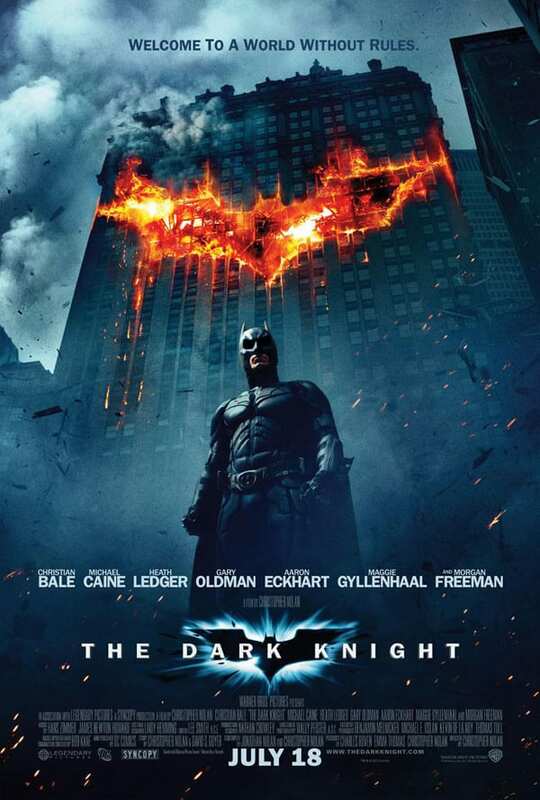 Moviegoers might recognize it as the building that appeared in the poster for 2008’s film The Dark Knight, and eagle eyed viewers may have seen some of the building’s inner rooms in the movie The Godfather. 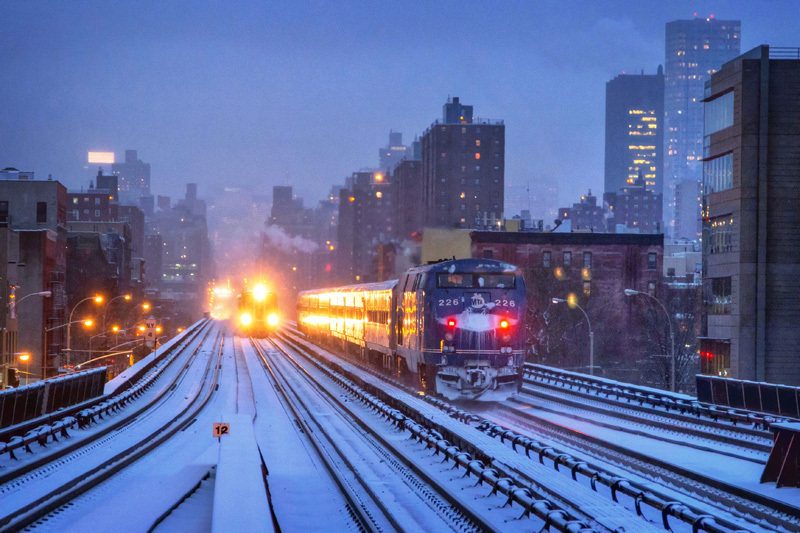 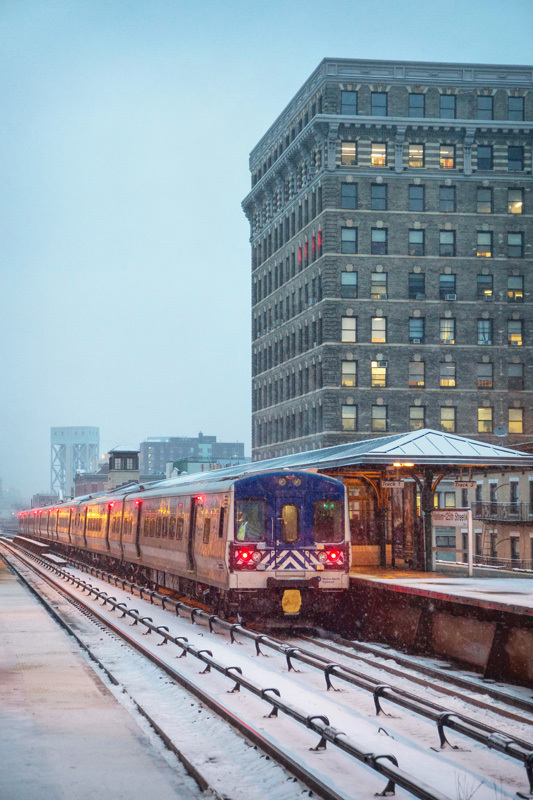 The MetLife and Helmsley Buildings are visible from four miles away at Harlem 125th Street station. 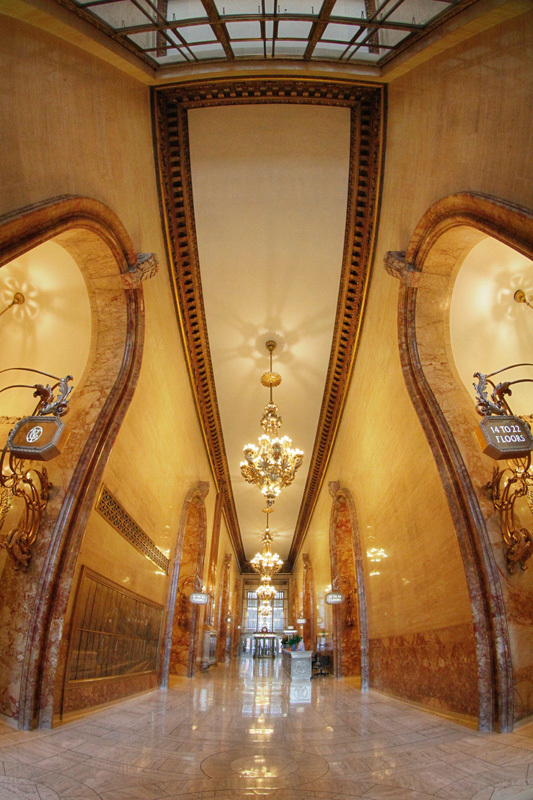 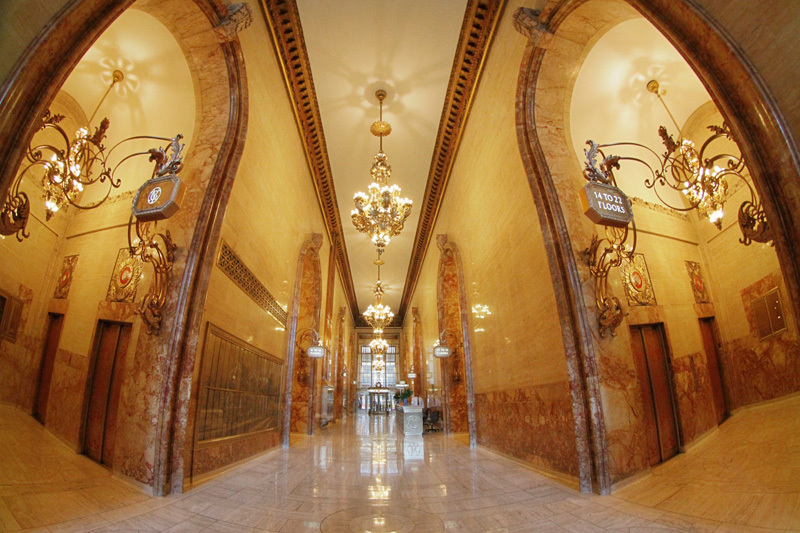 Let’s take a photo tour of the old New York Central building, including a quick peek of the marble-covered inner lobby. 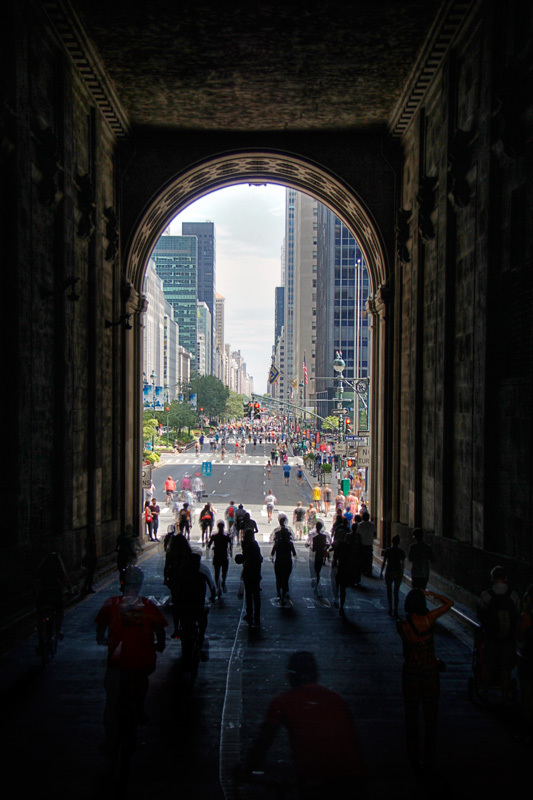 Weekends in August are the best time to check out the building, as part of the city’s Summer Streets program, which closes parts of Park Avenue to cars. 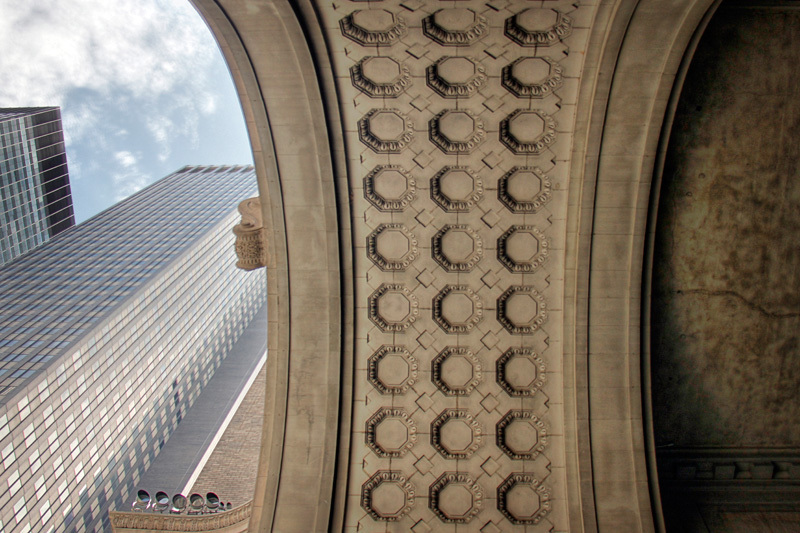 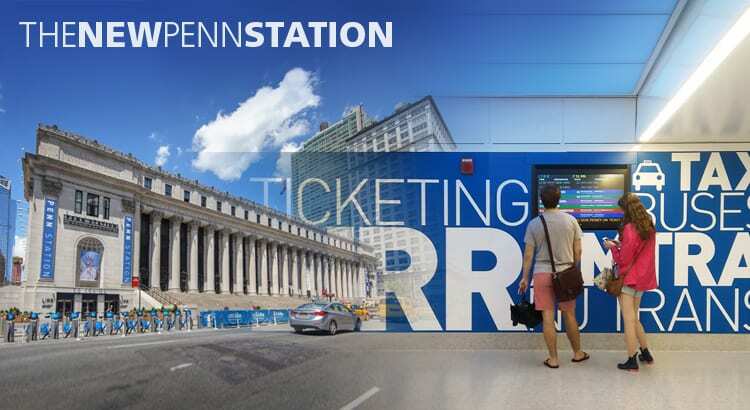 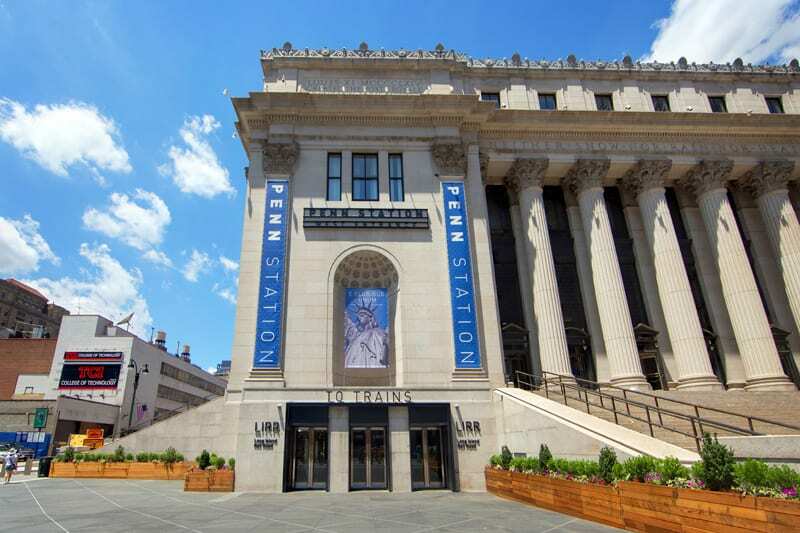 You’ll be given the rare opportunity to not only view the building up close and personal, but to walk the Park Avenue Viaduct, and the tunnels that travel through the old New York Central building.